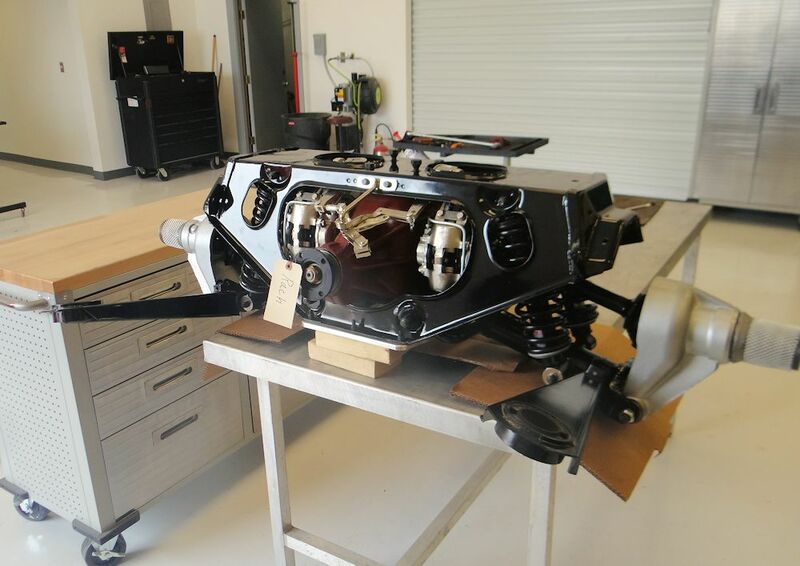 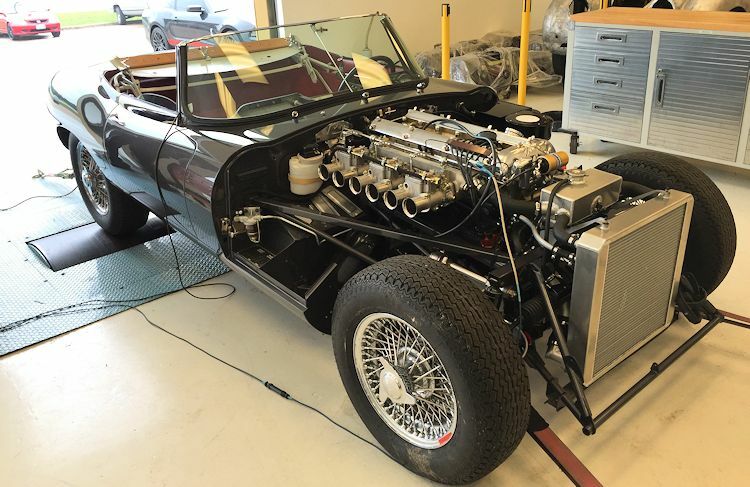 Total restoration with a wide range of mechanical upgrades, Stage Two 4.7 liter engine, CJ five speed transmission, upgraded cooling, ignition, suspension, brakes, Borrani wire wheels, etc. These spectacular photographs are a sampling of the images created for us by Danny Batista Photography, a couple of weeks ago. 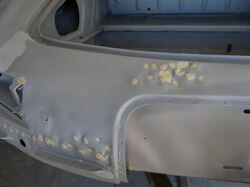 I hope you are pleased with the results! 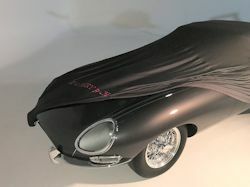 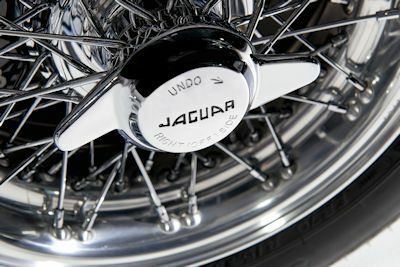 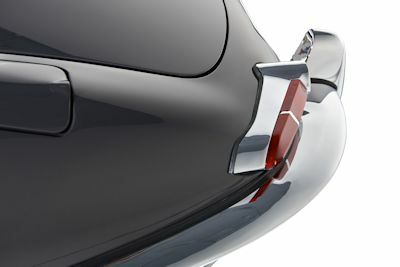 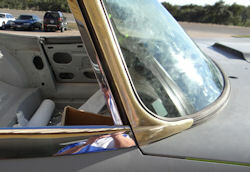 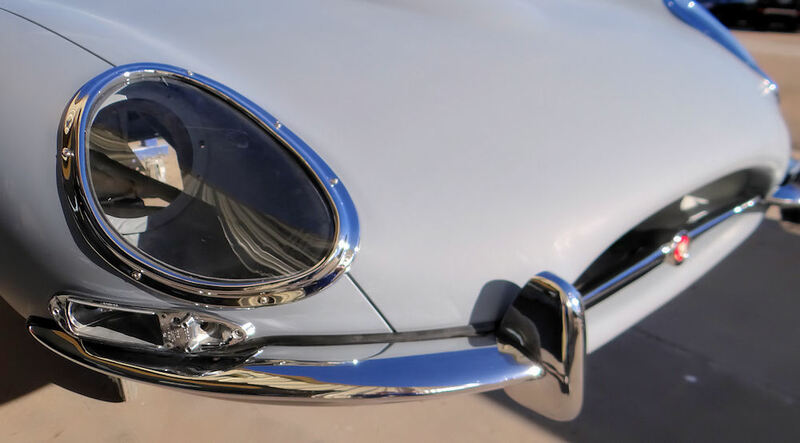 We spent yesterday with Danny Batista Photography shooting hundreds of images of this beautiful E Type. 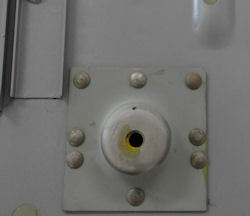 We will publish the photographs in the next week or so. 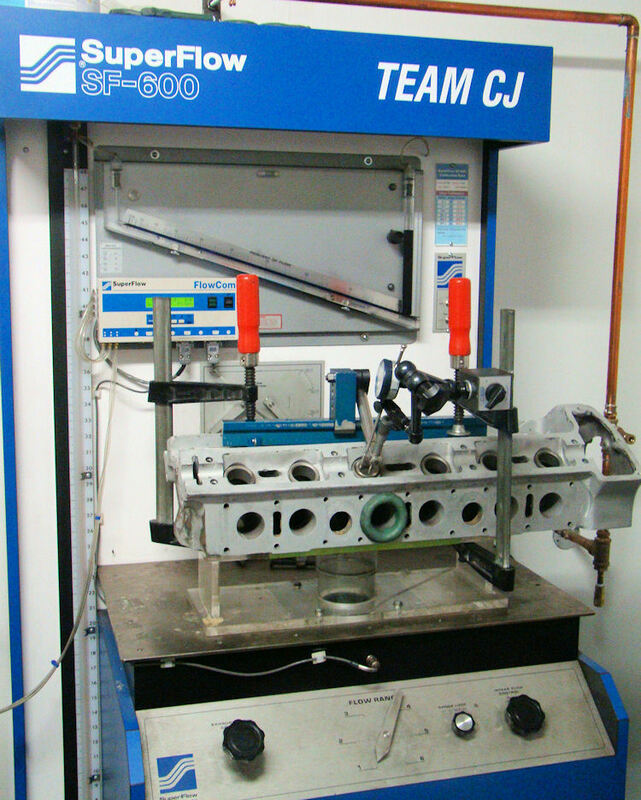 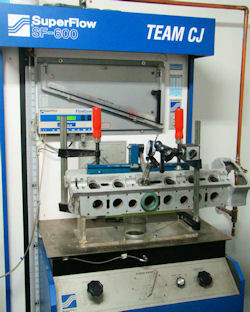 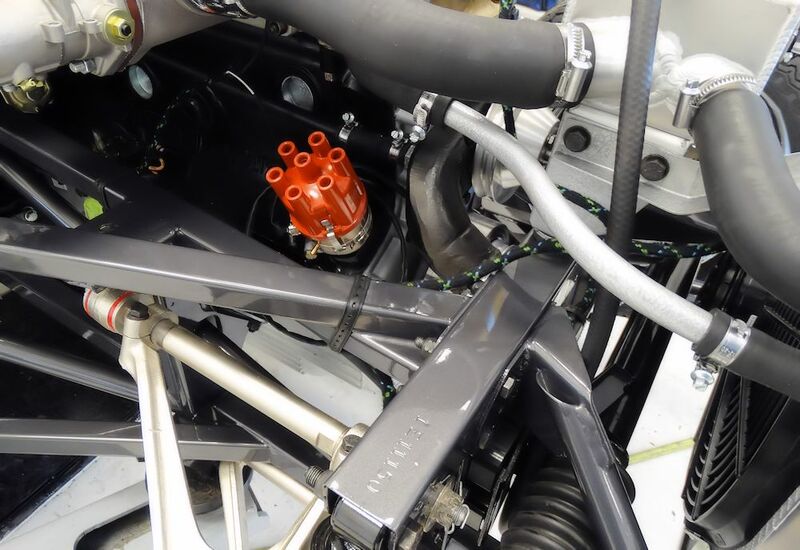 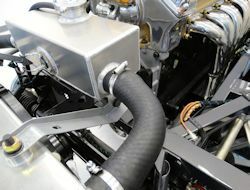 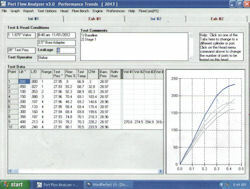 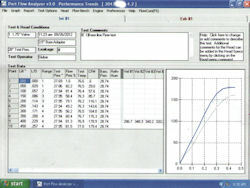 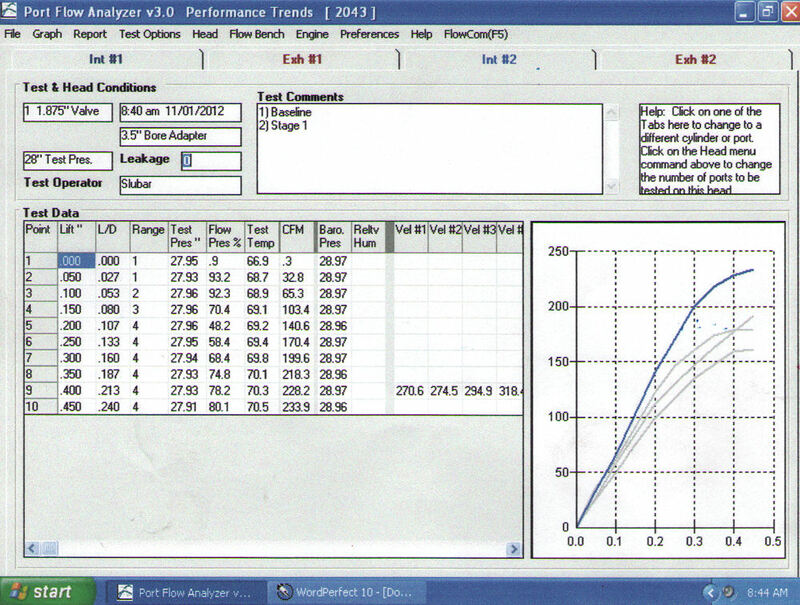 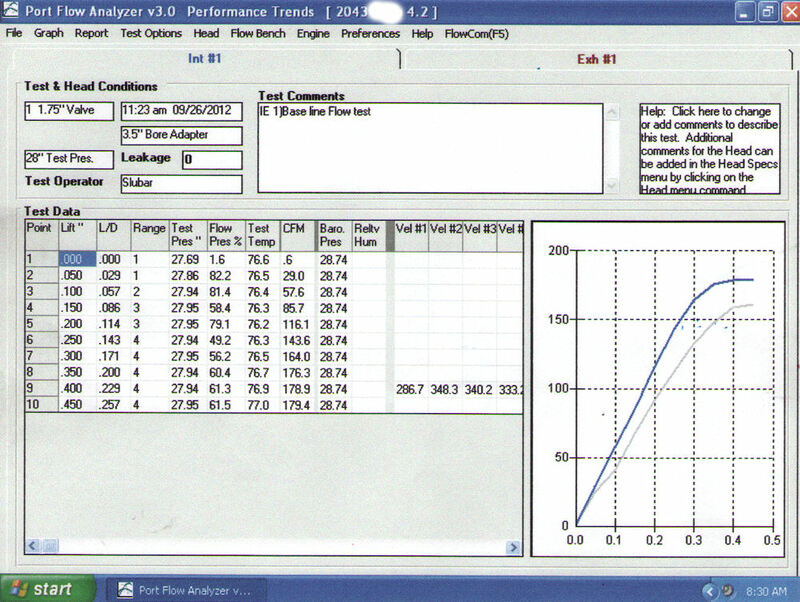 We dyno tested the car again today, having installed our new CJ long manifold headers and straight through exhaust system. 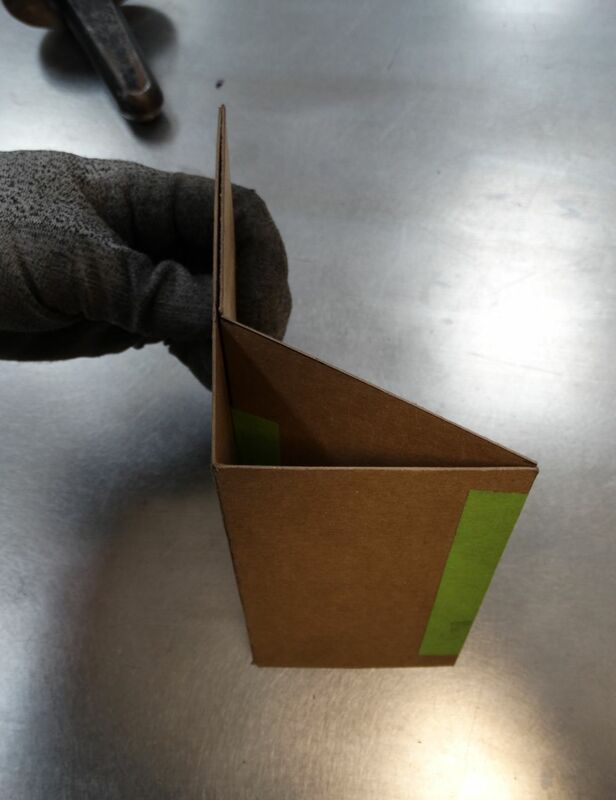 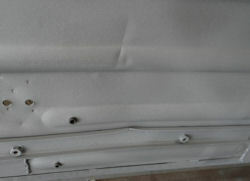 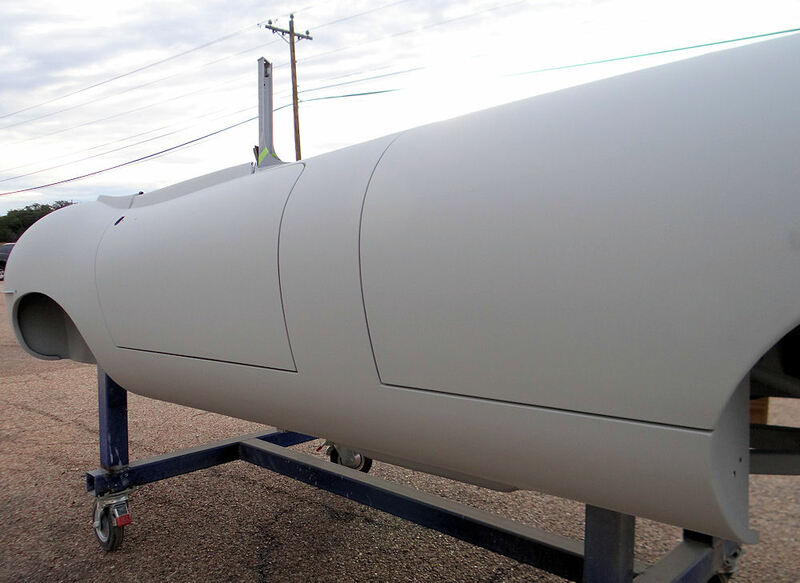 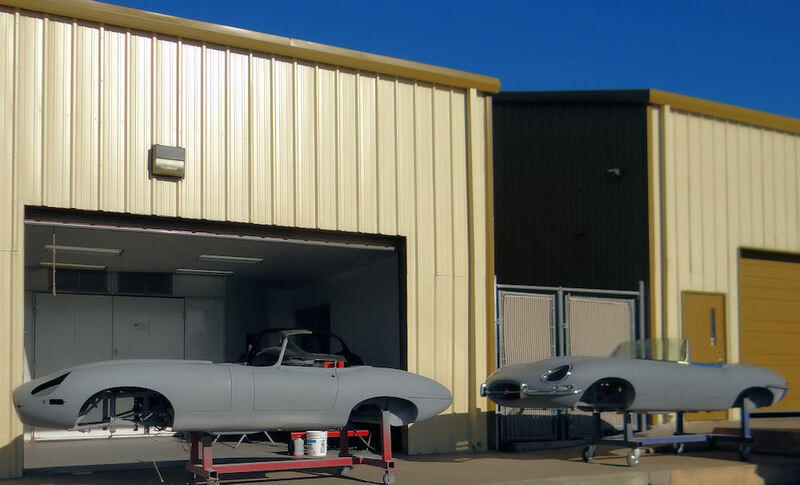 We were particularly pleased with the results, especially given the 100+ degree ambient temperature. 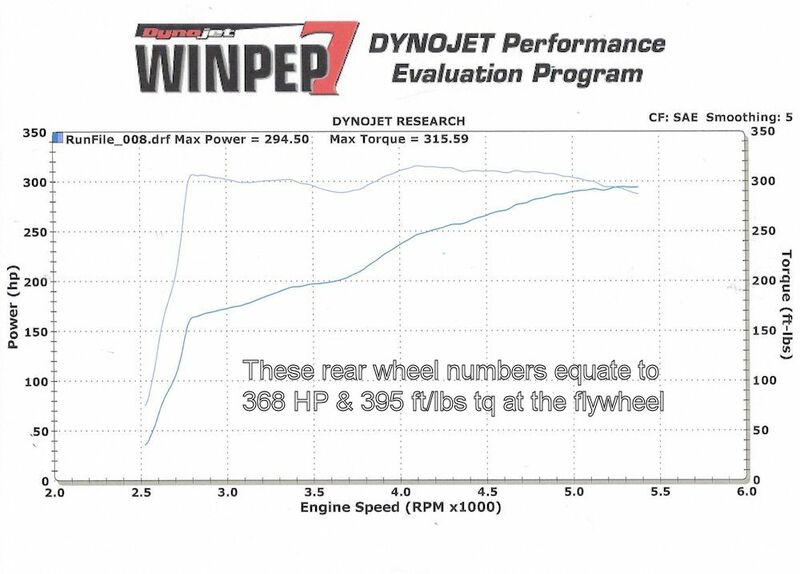 Check out the results below! 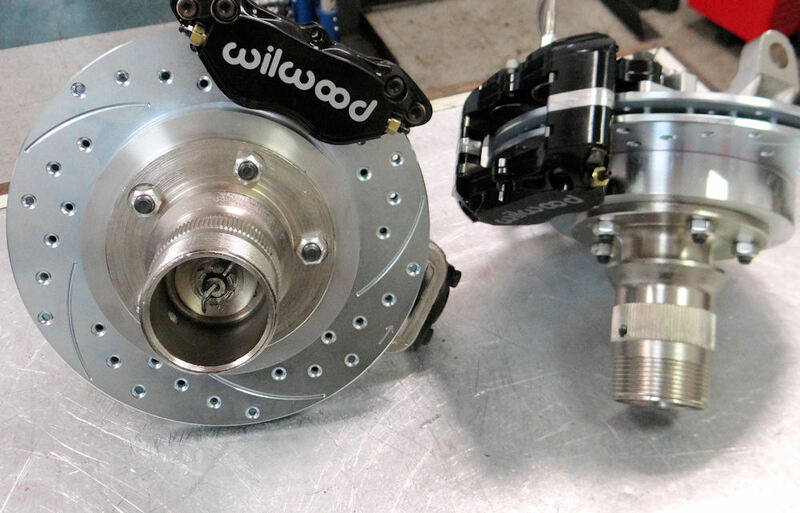 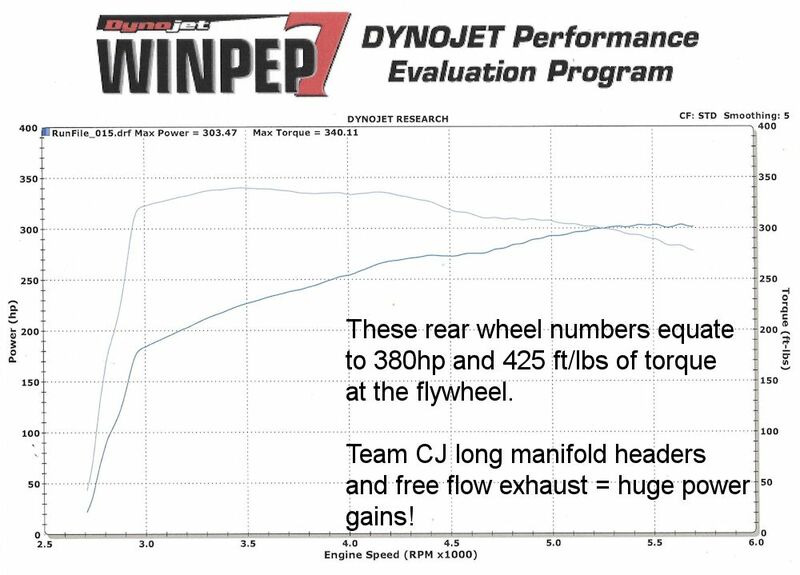 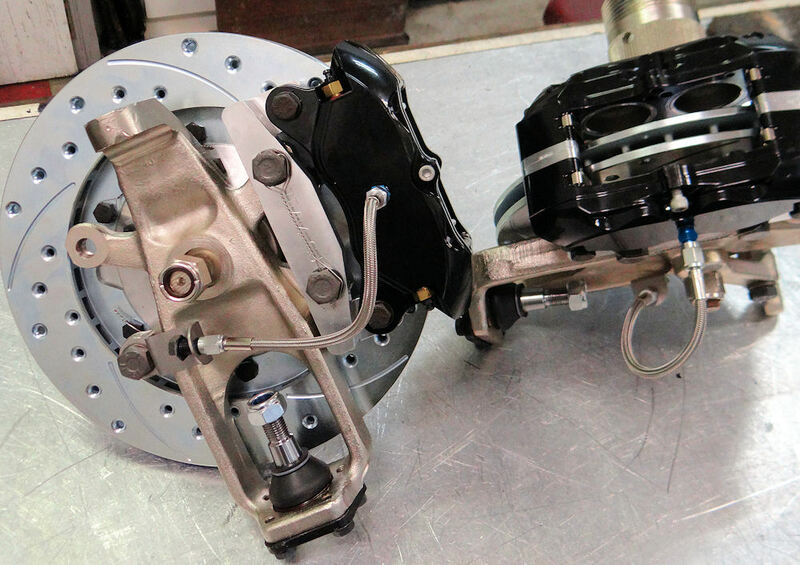 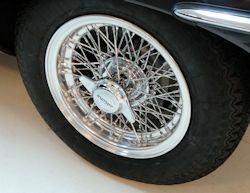 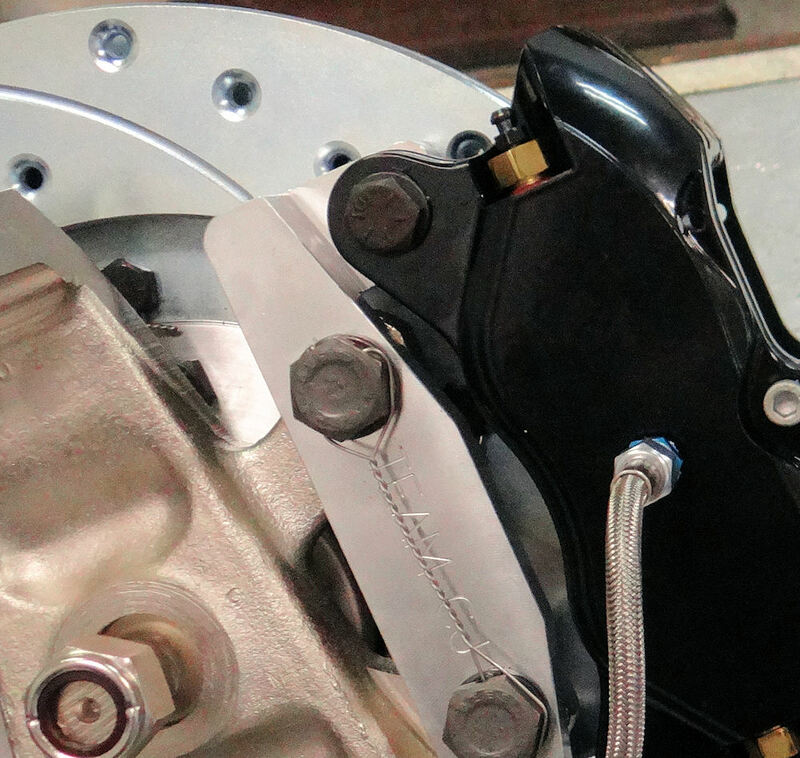 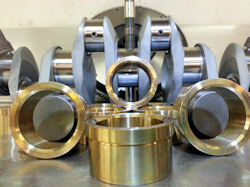 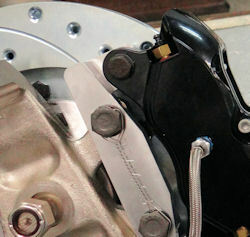 Installing your new Borrani wire wheels..
Click on the photo below for a short video clip of one of the Dyno runs. 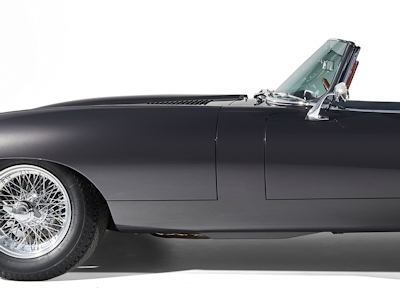 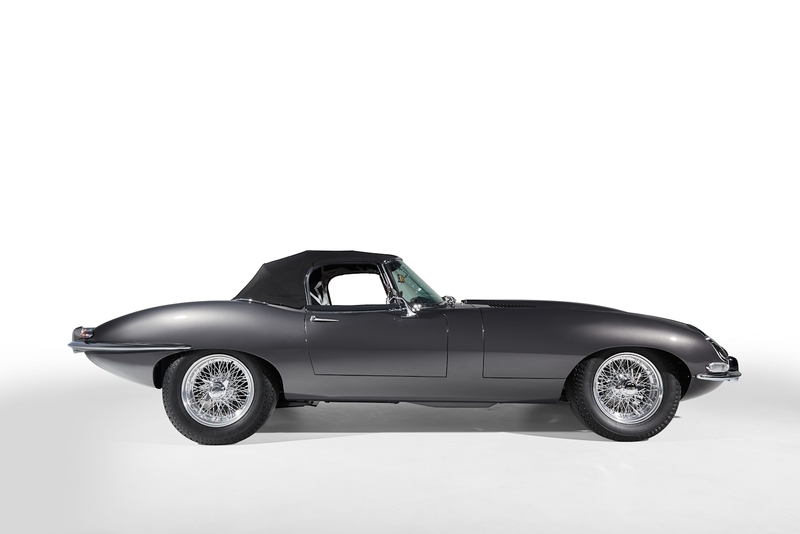 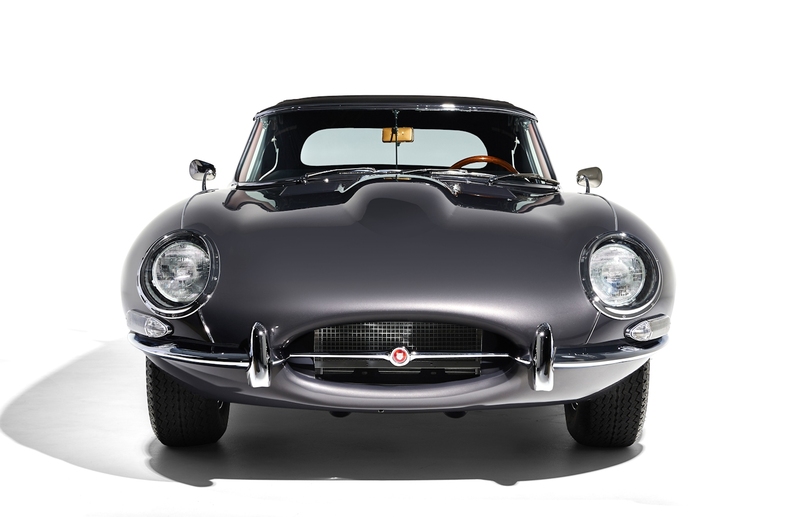 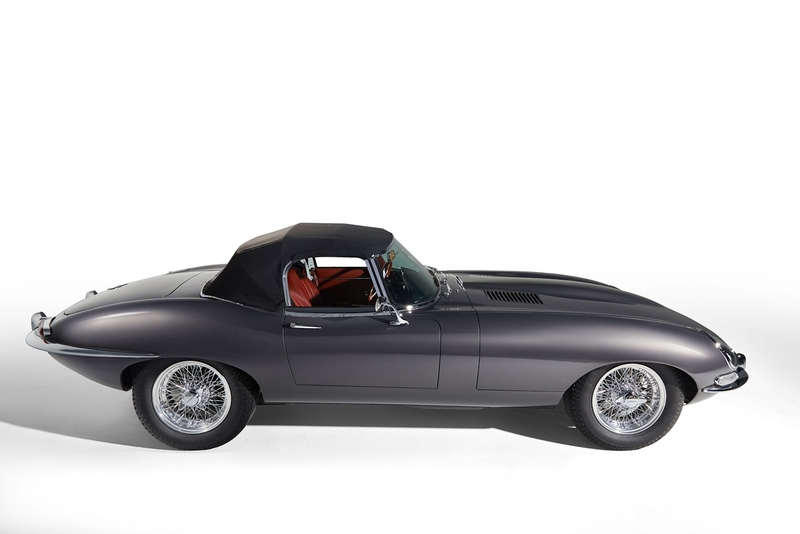 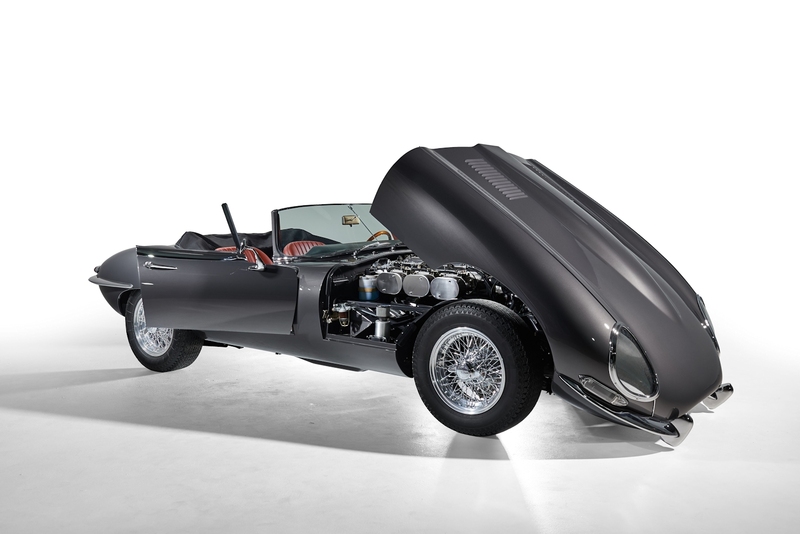 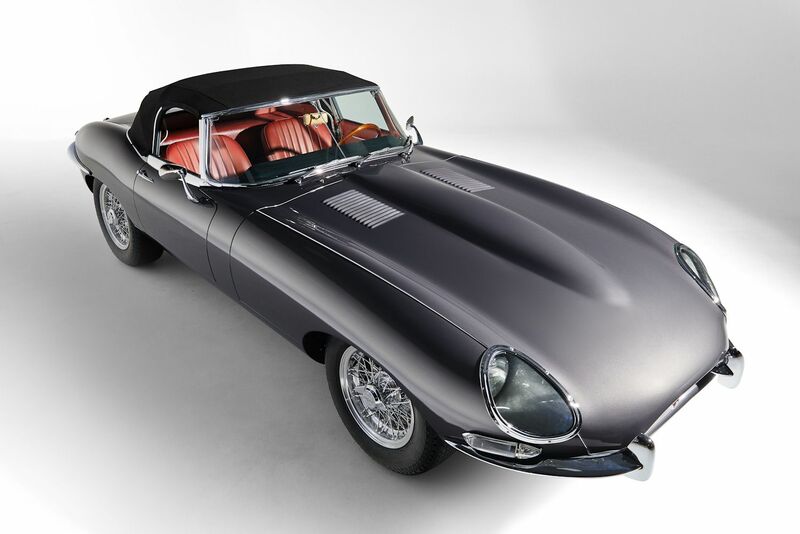 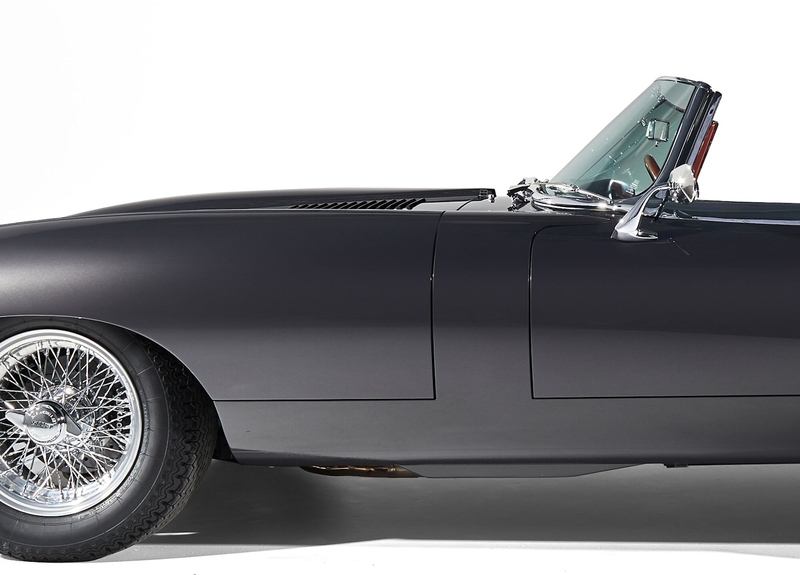 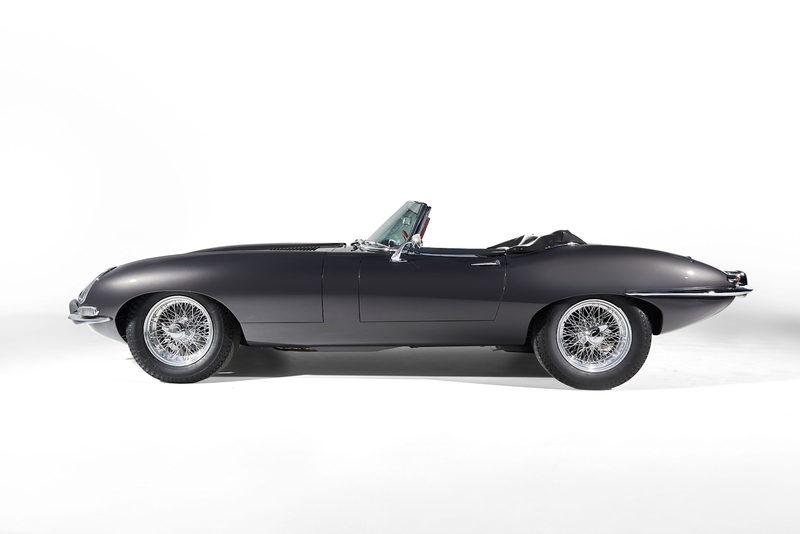 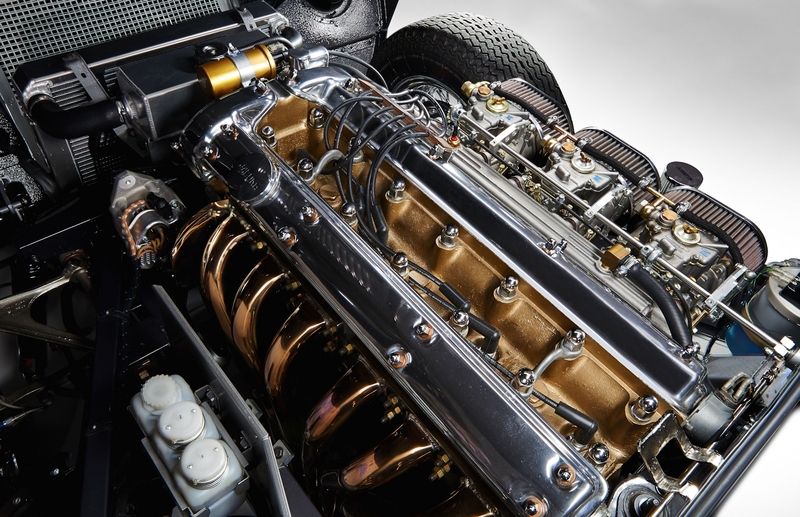 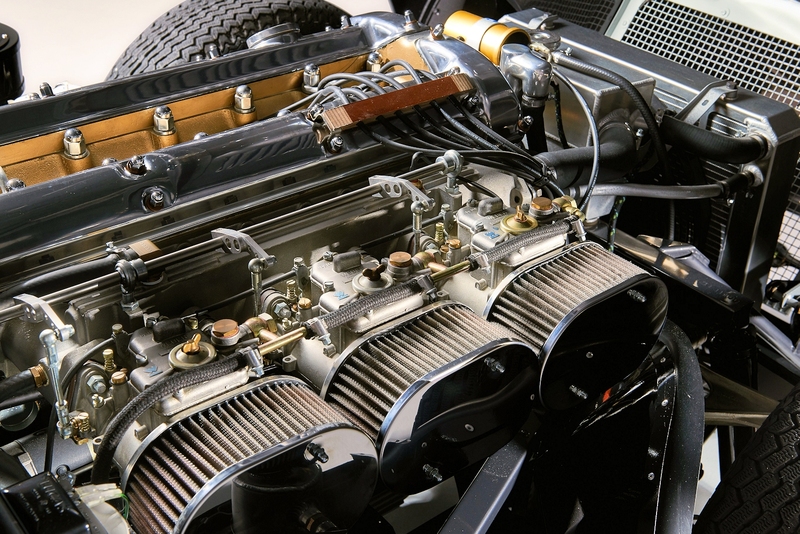 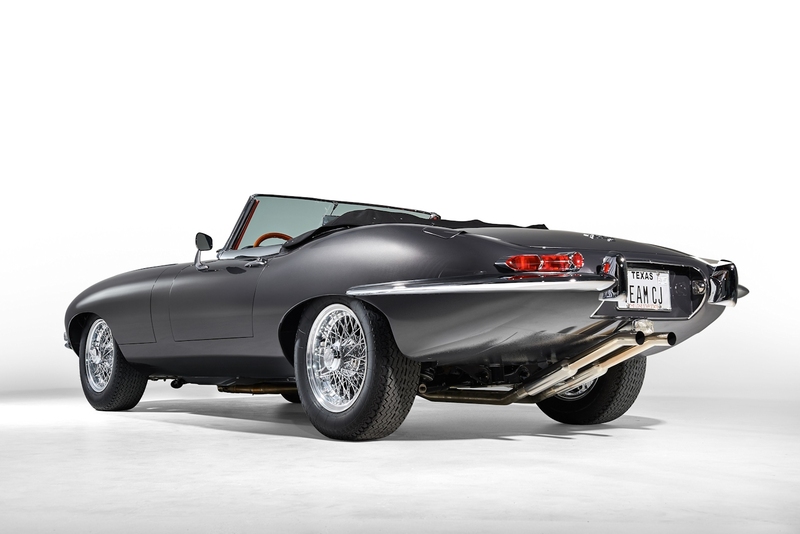 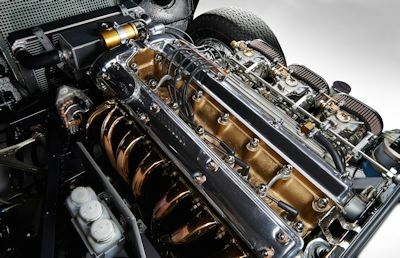 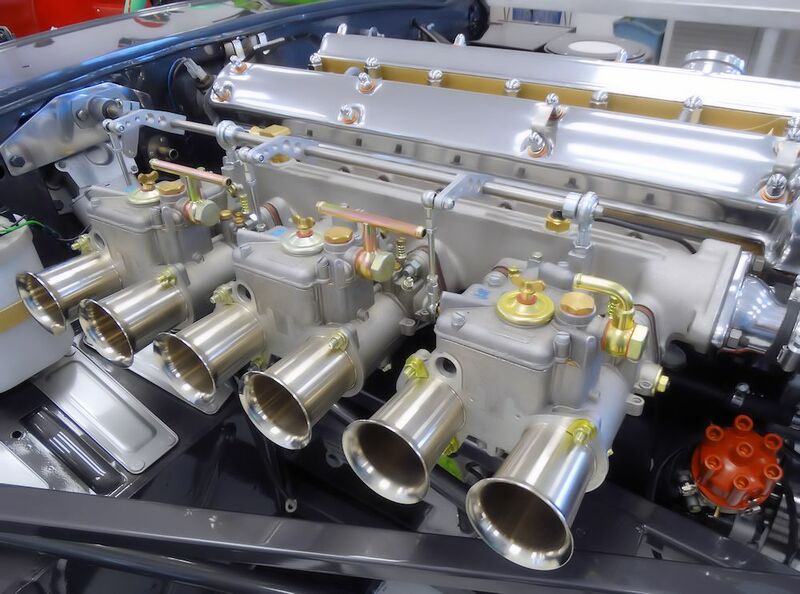 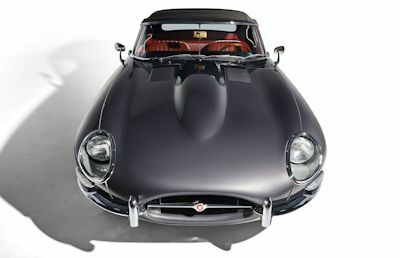 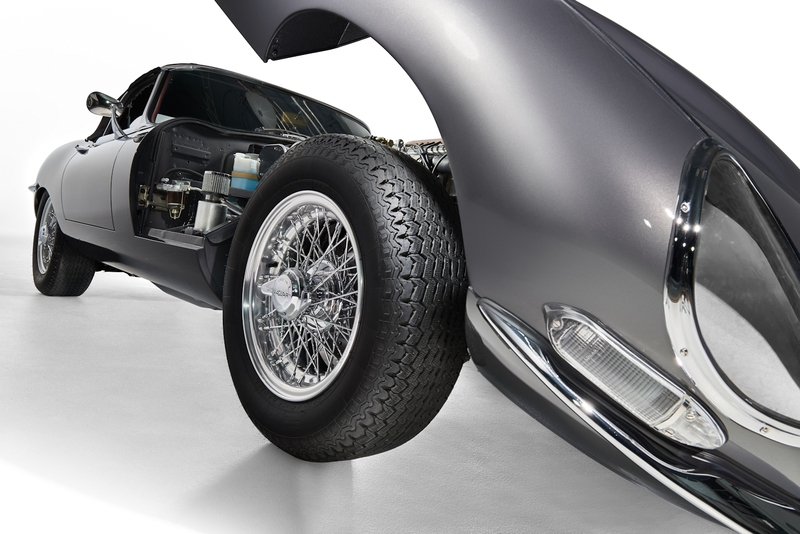 This car is one of the most powerful road legal Series One E Types in the world. 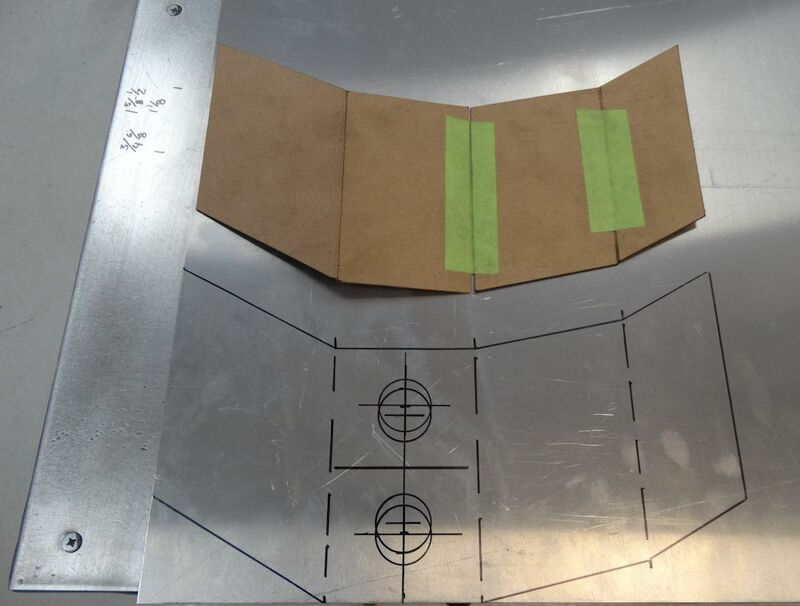 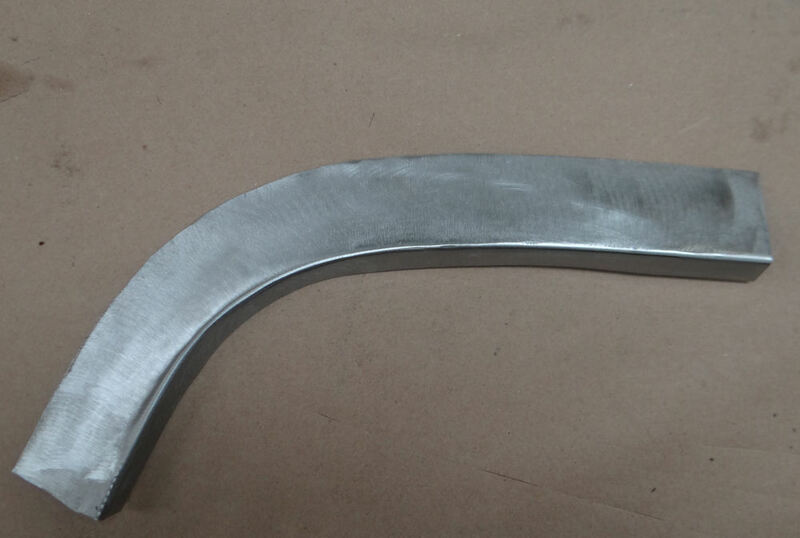 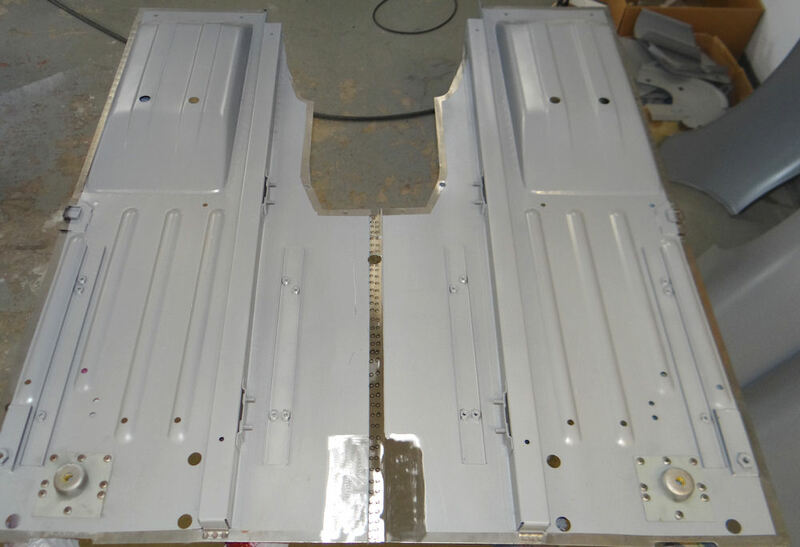 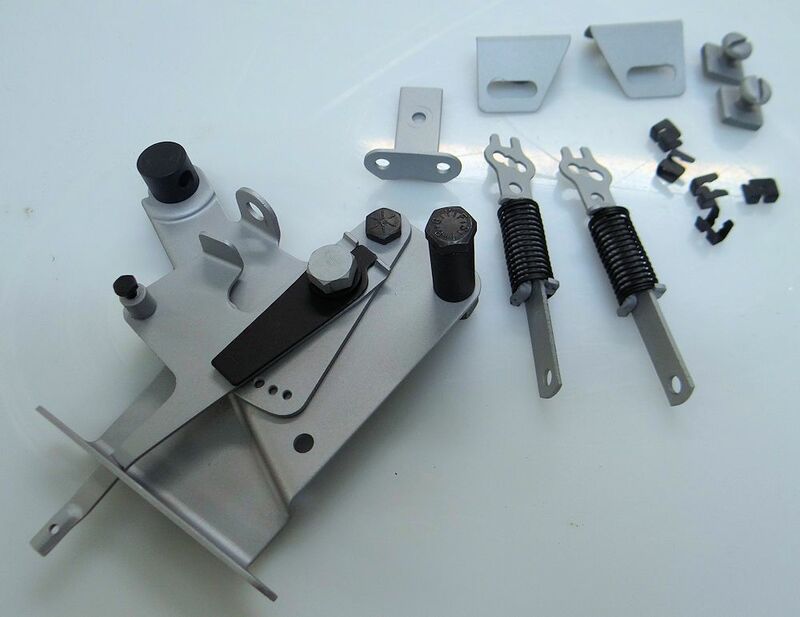 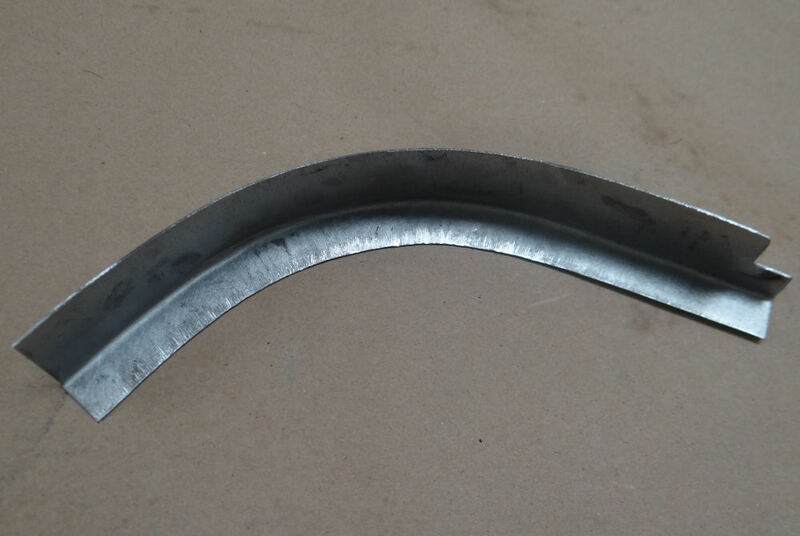 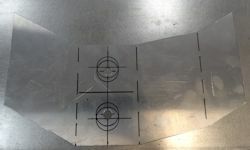 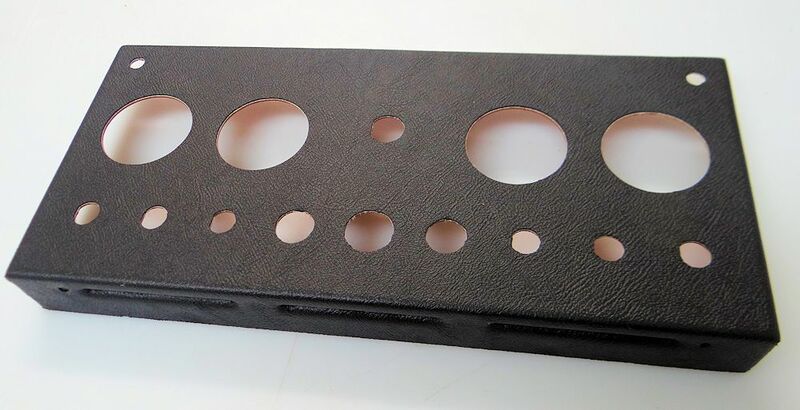 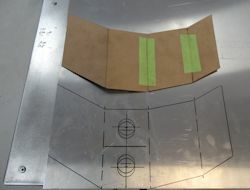 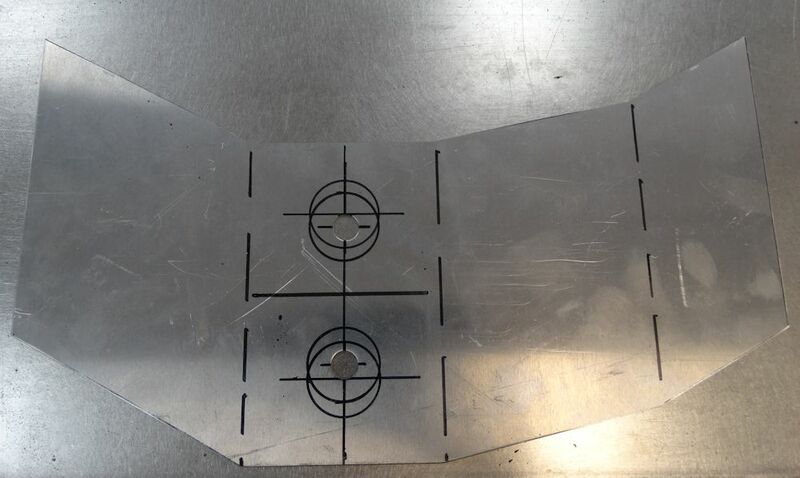 Fabricating an adjustable dead pedal.. Yesterday afternoon Gerardo finished the painting process and I am pleased to report that the finished result looks absolutely spectacular. 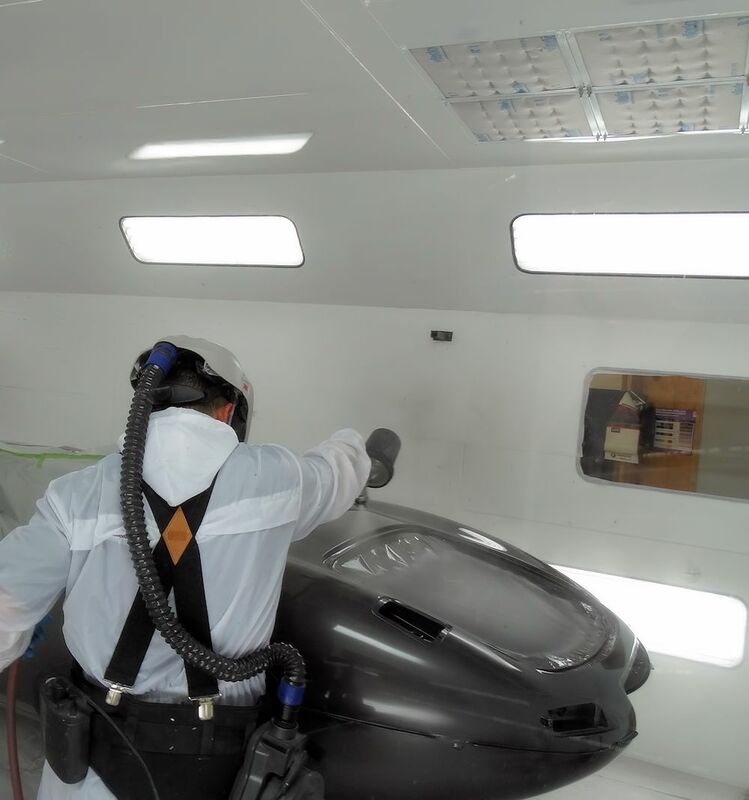 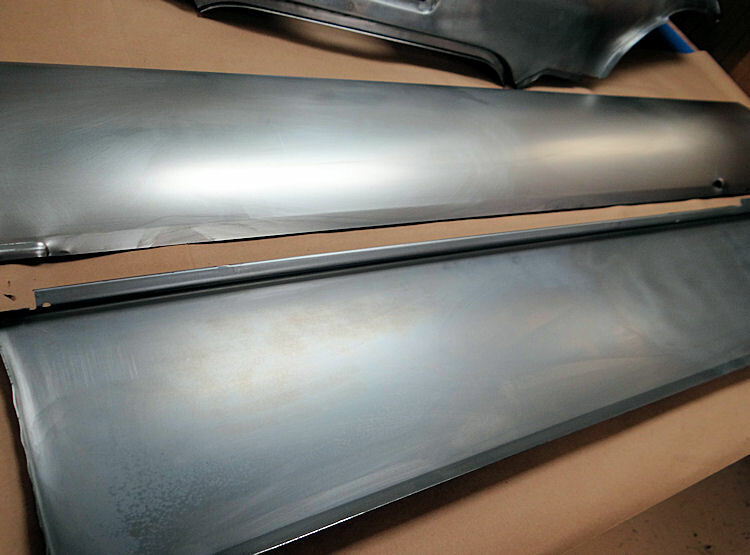 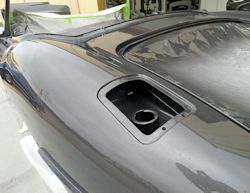 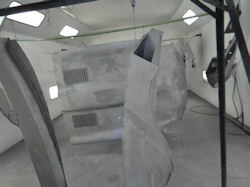 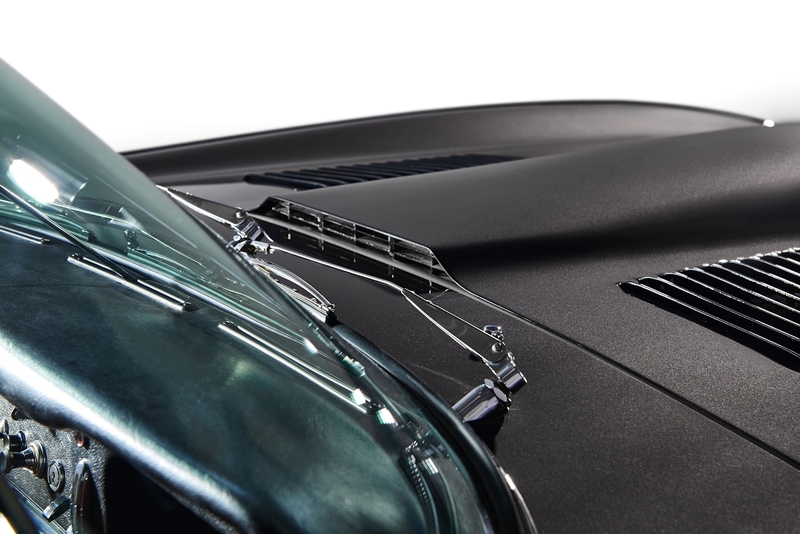 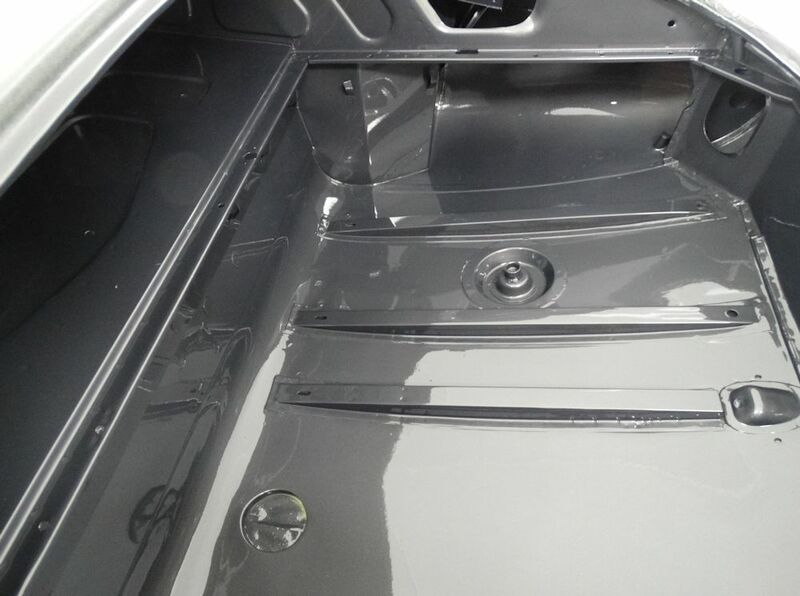 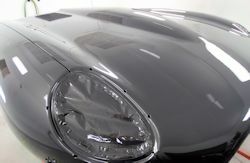 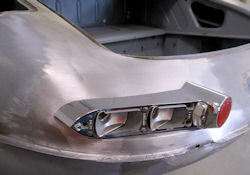 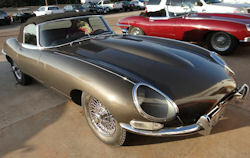 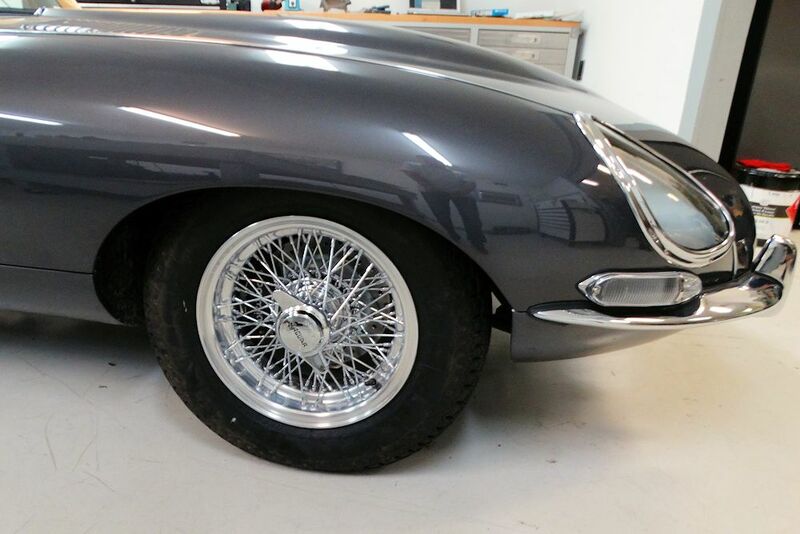 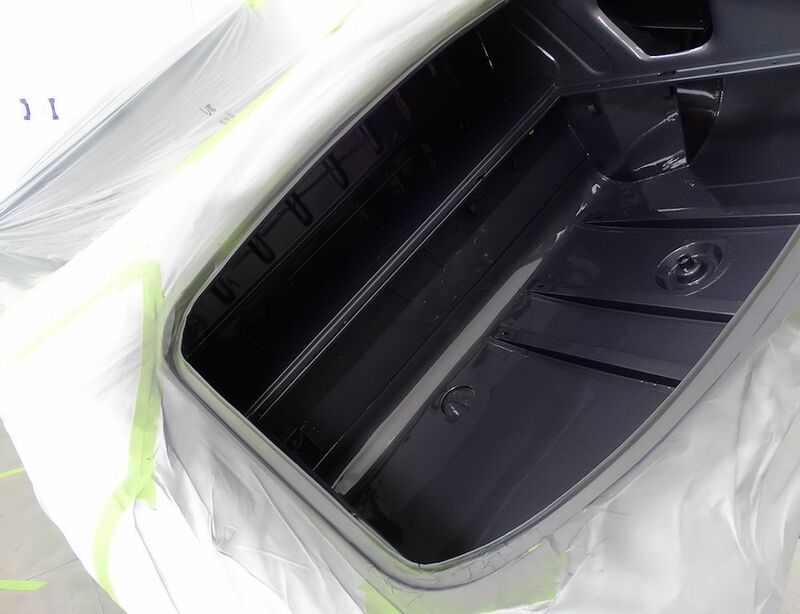 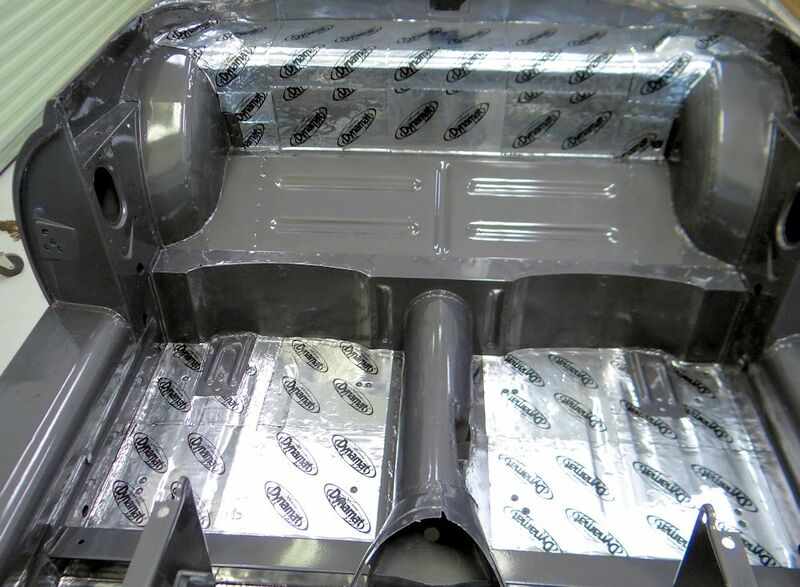 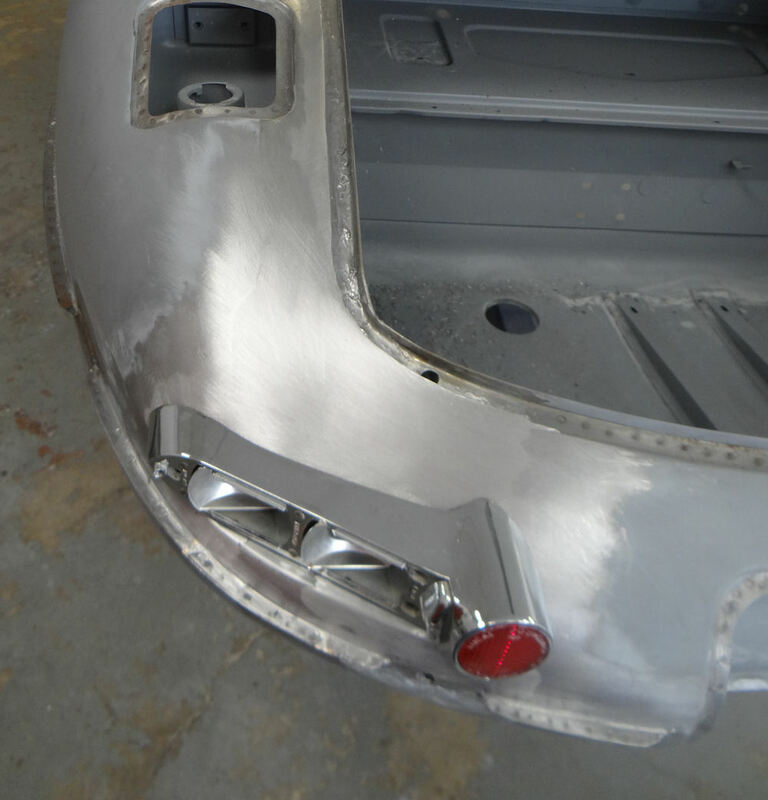 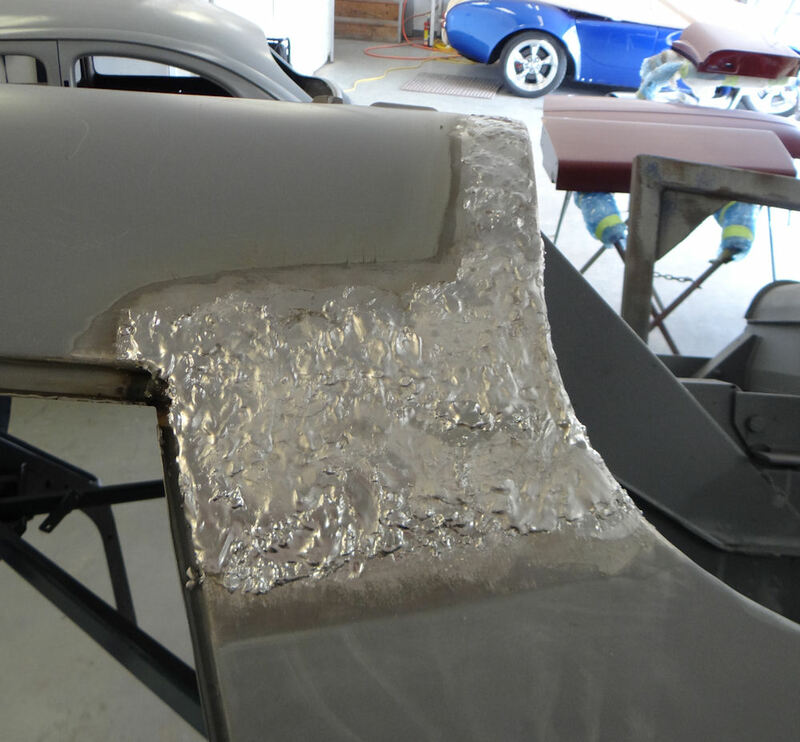 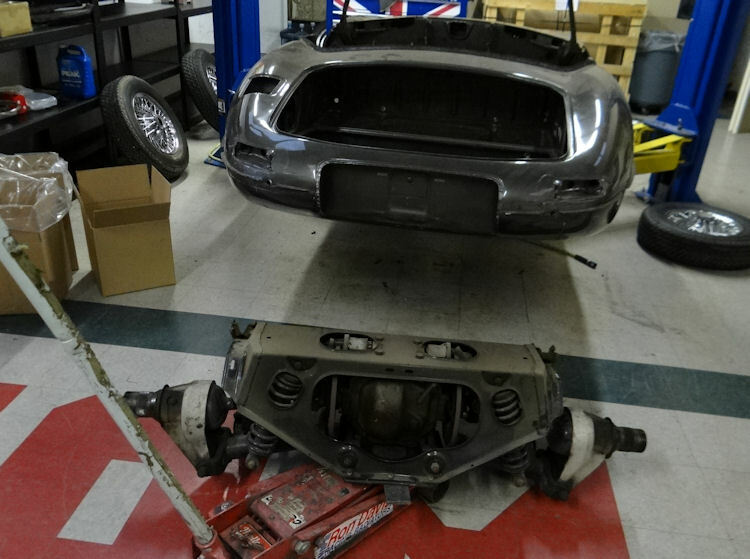 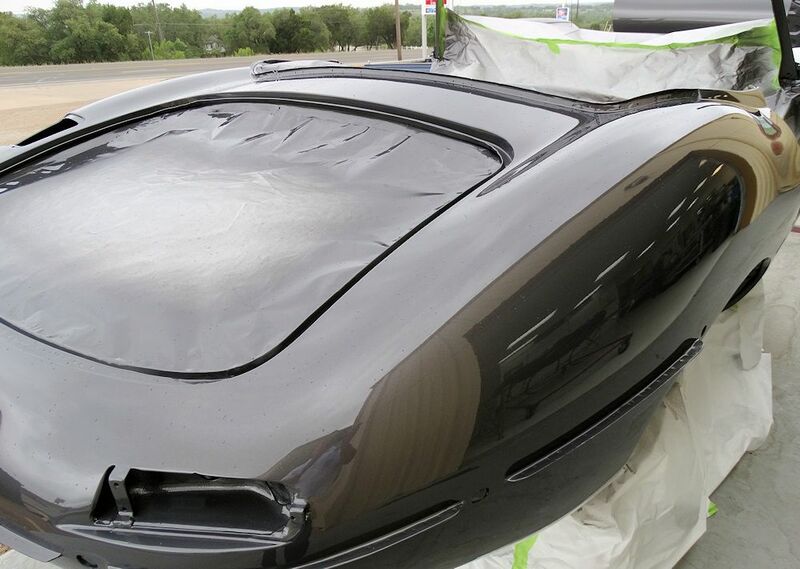 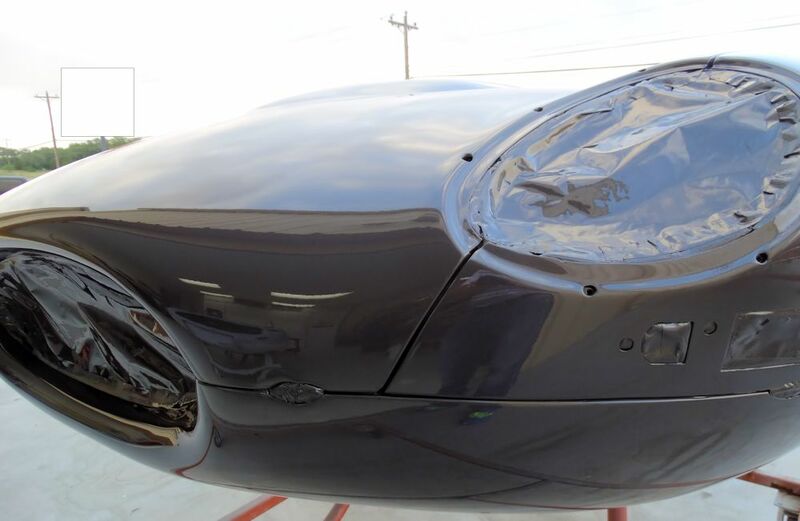 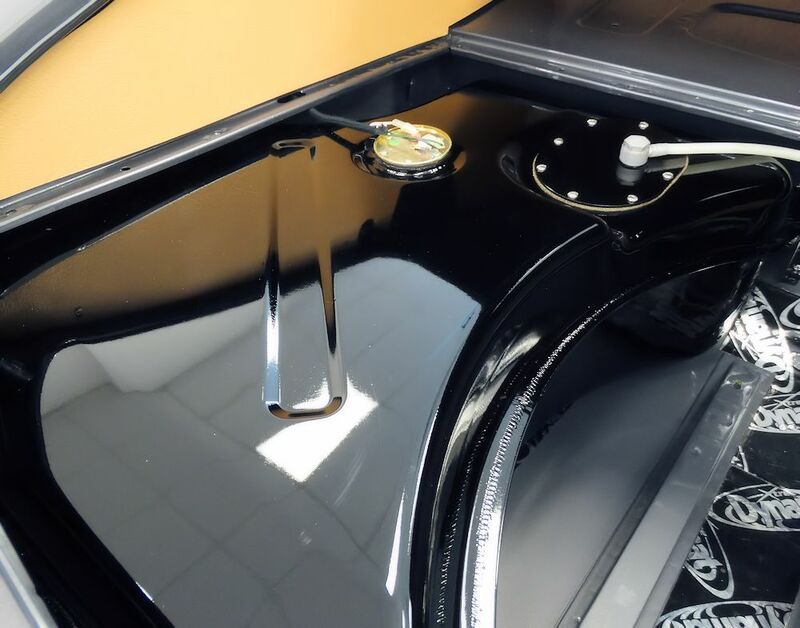 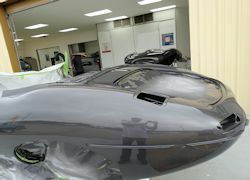 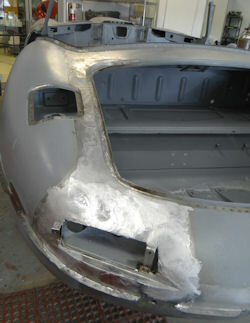 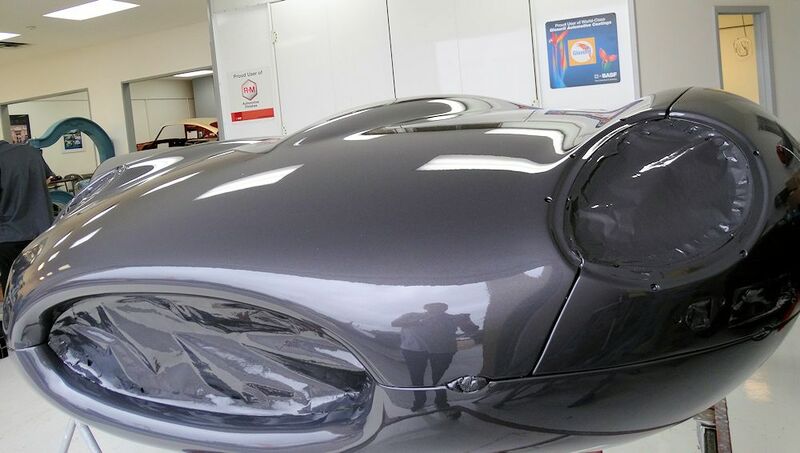 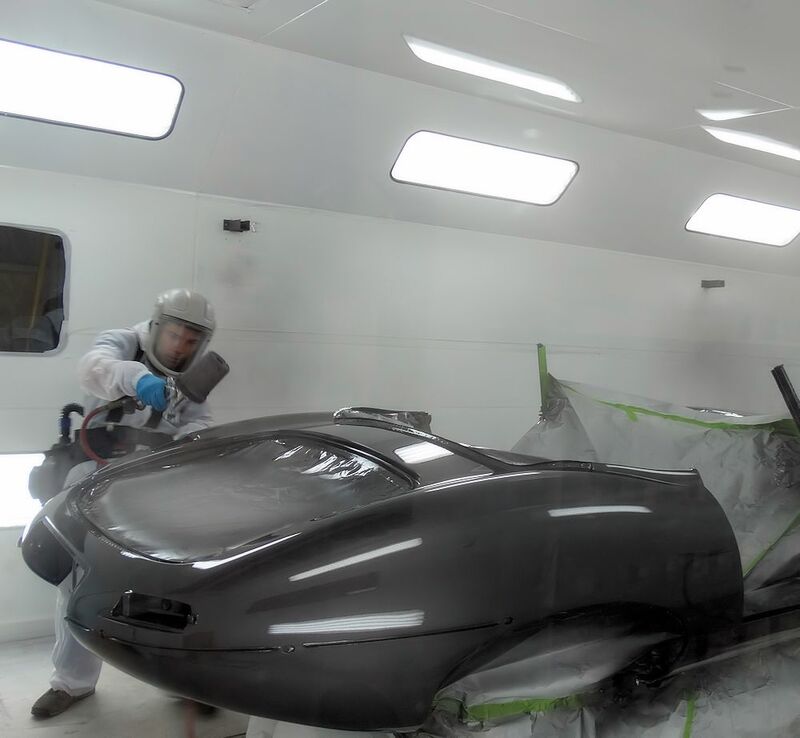 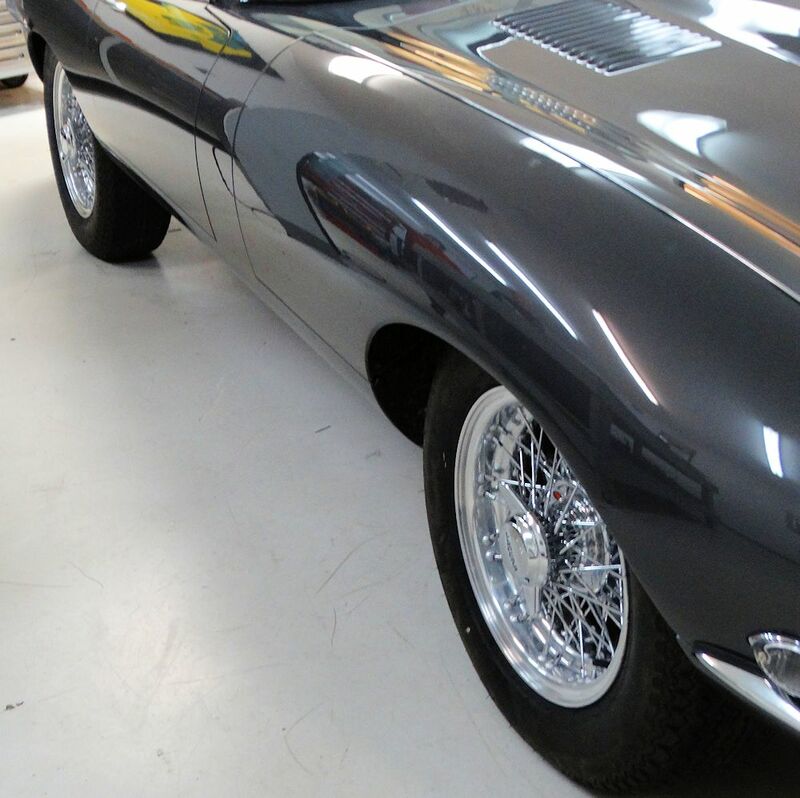 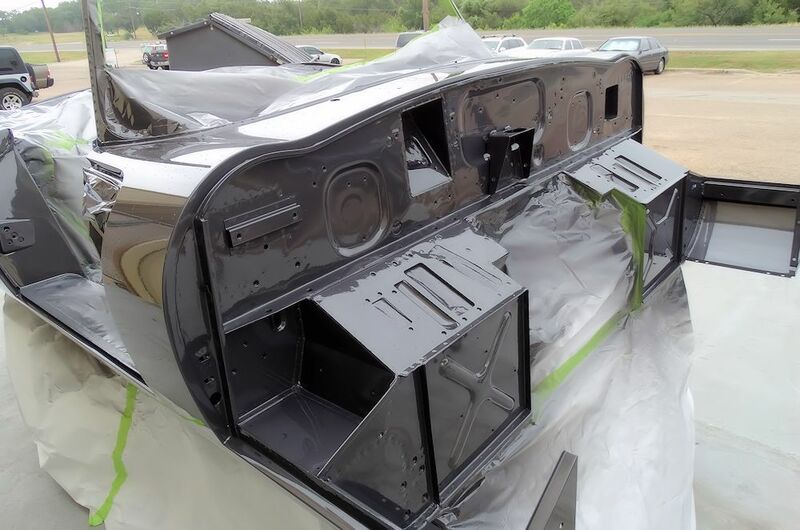 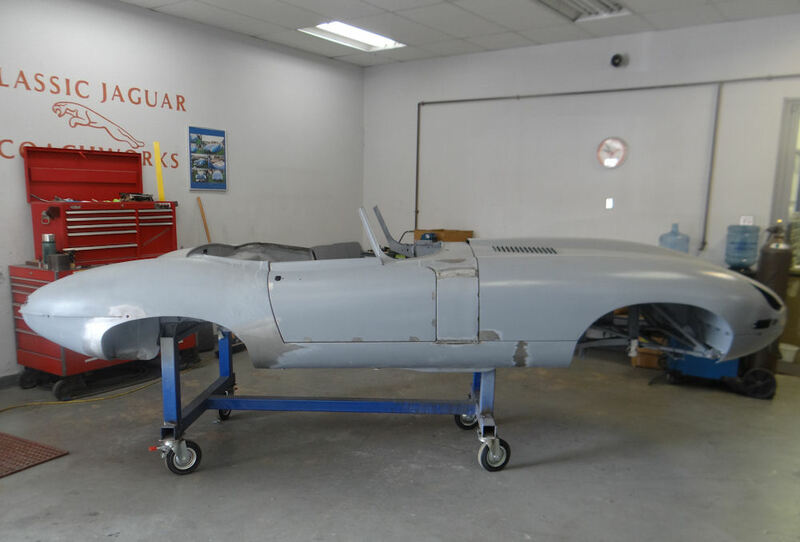 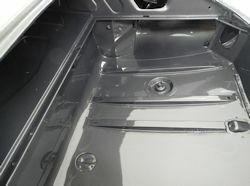 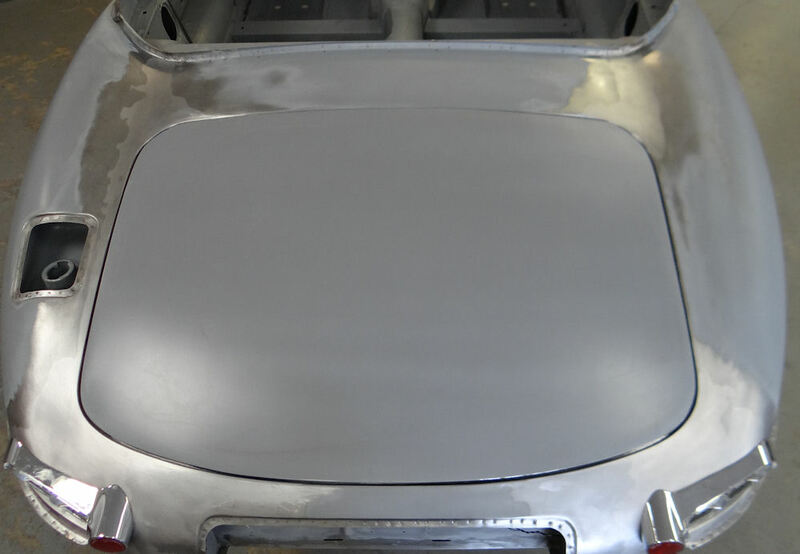 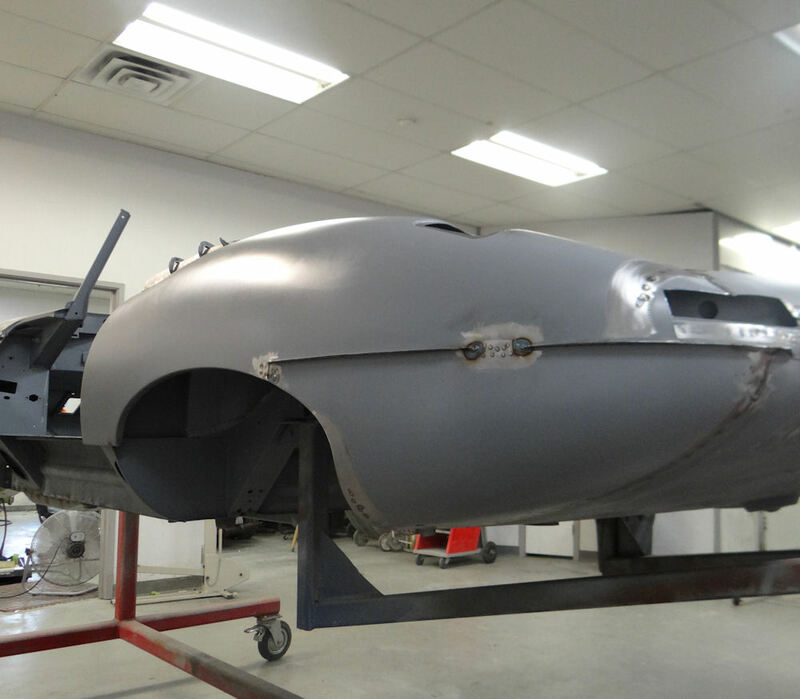 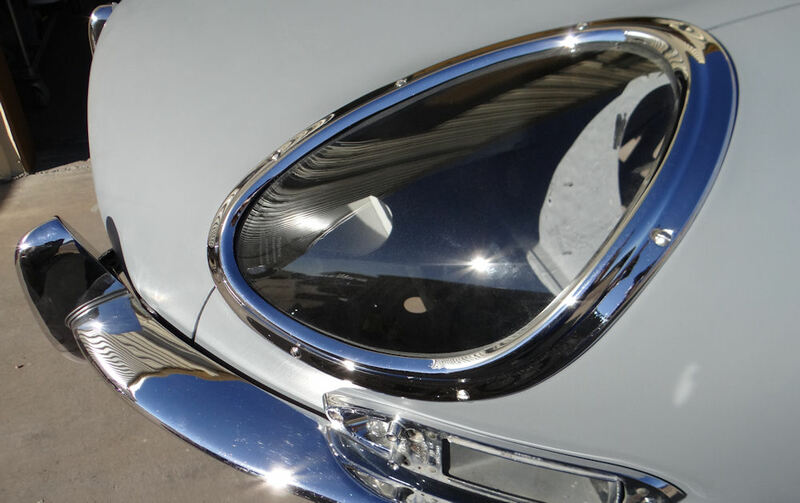 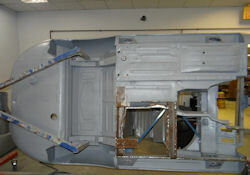 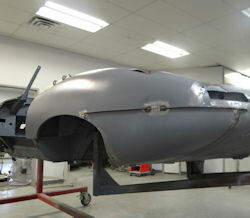 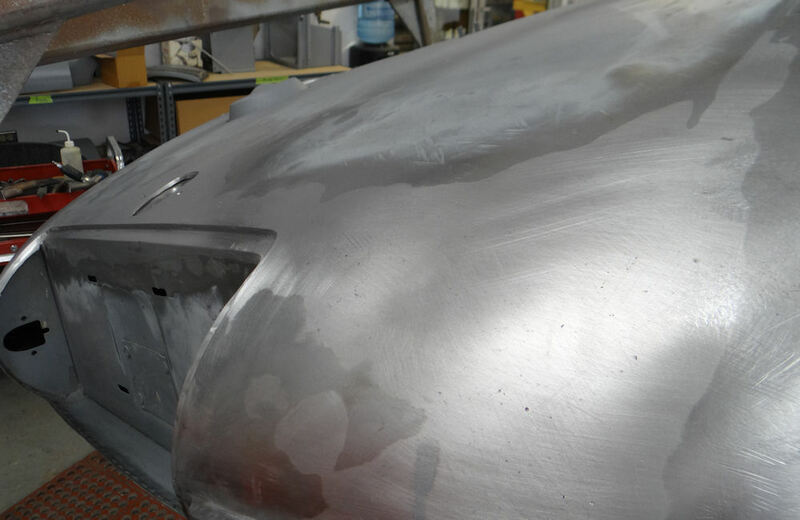 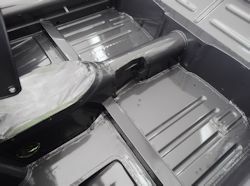 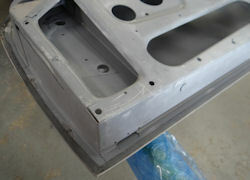 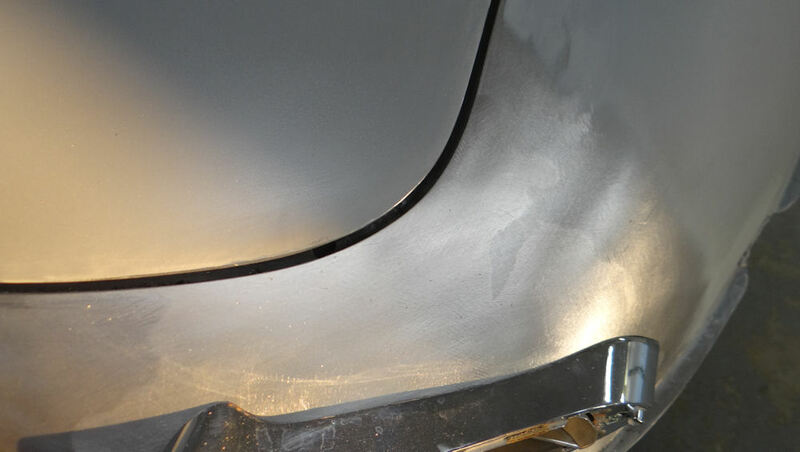 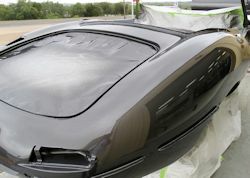 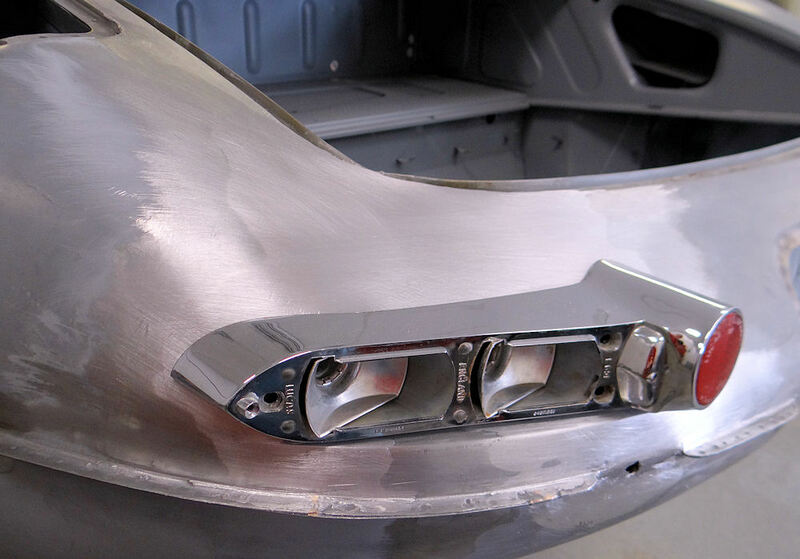 There is nothing quite like a freshly painted Opalescent Gunmetal E Type! 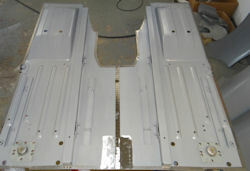 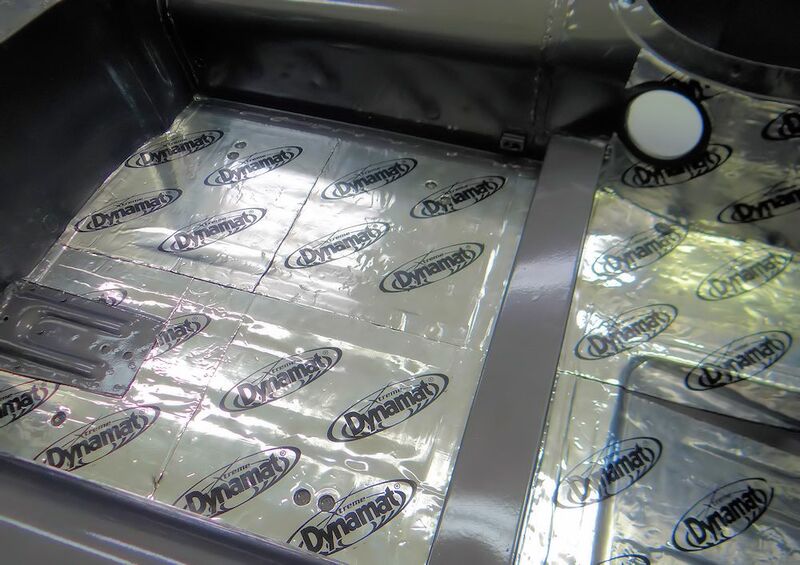 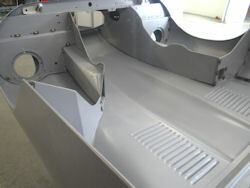 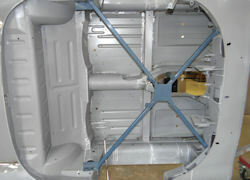 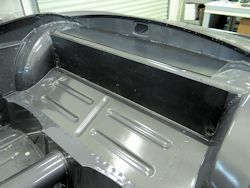 Applying 3M Rocker Guard and painting the underside of the floors.. 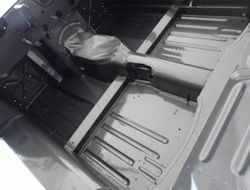 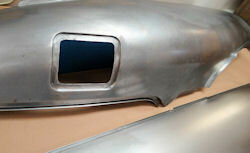 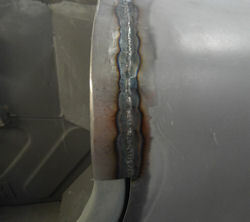 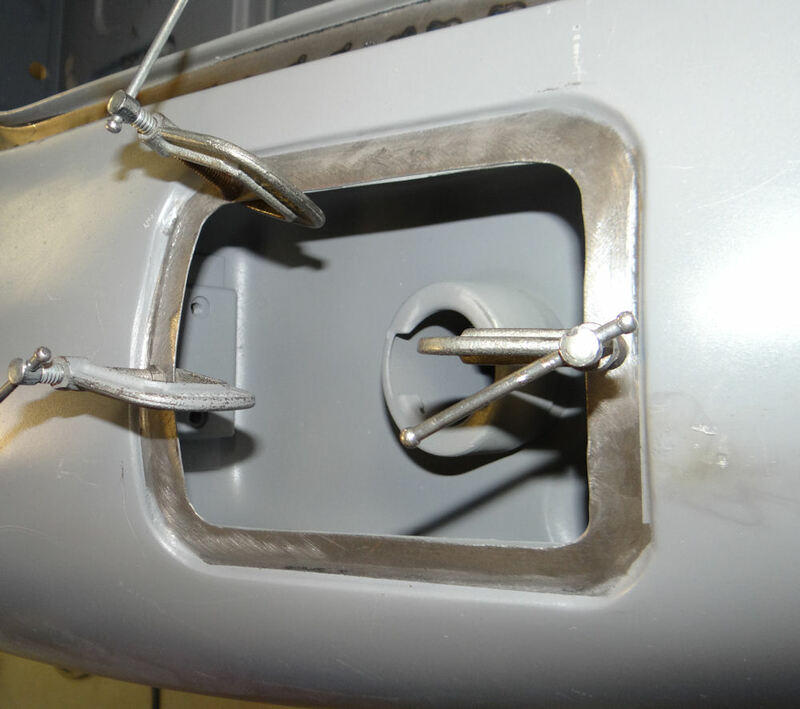 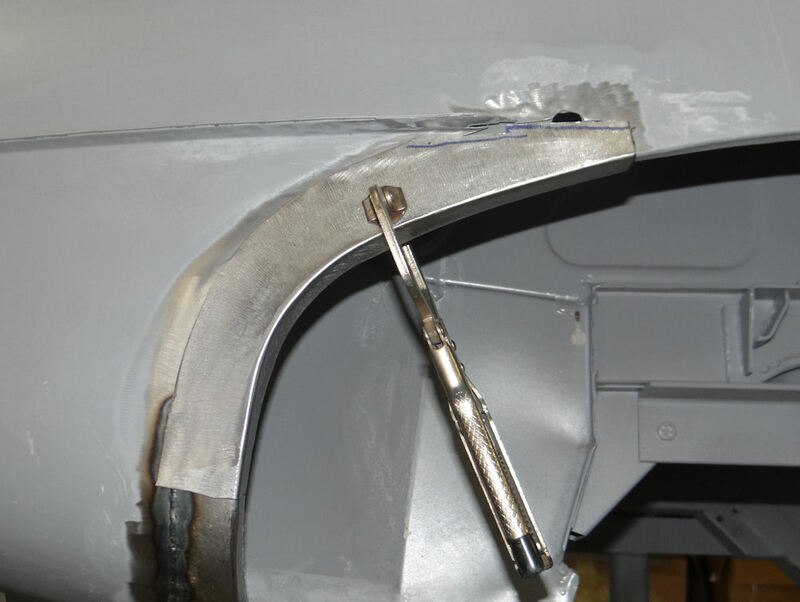 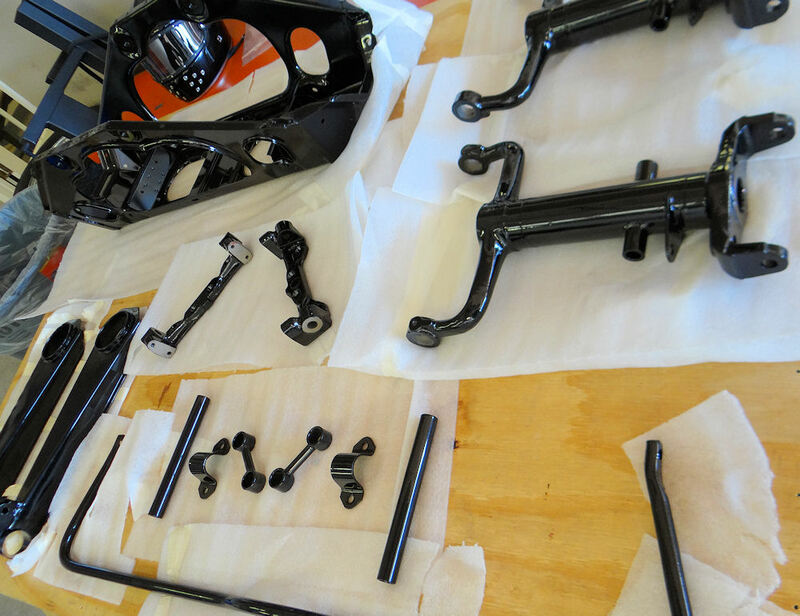 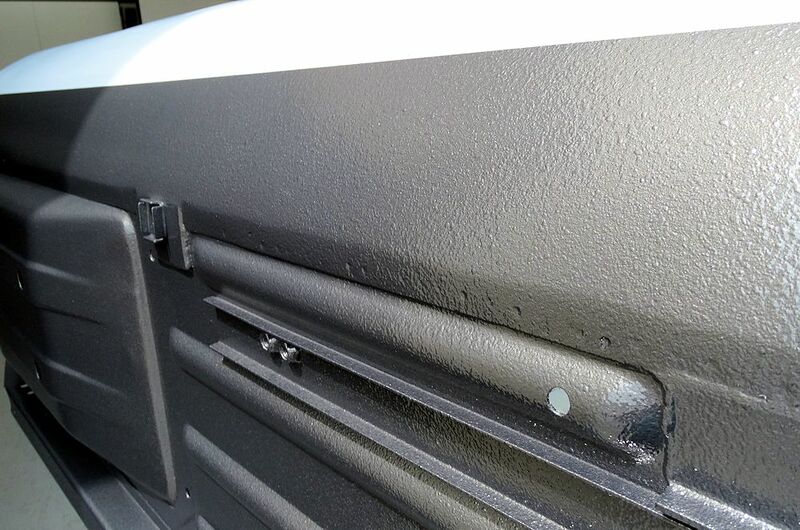 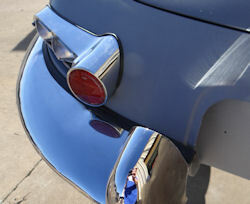 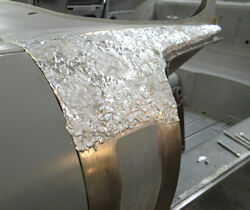 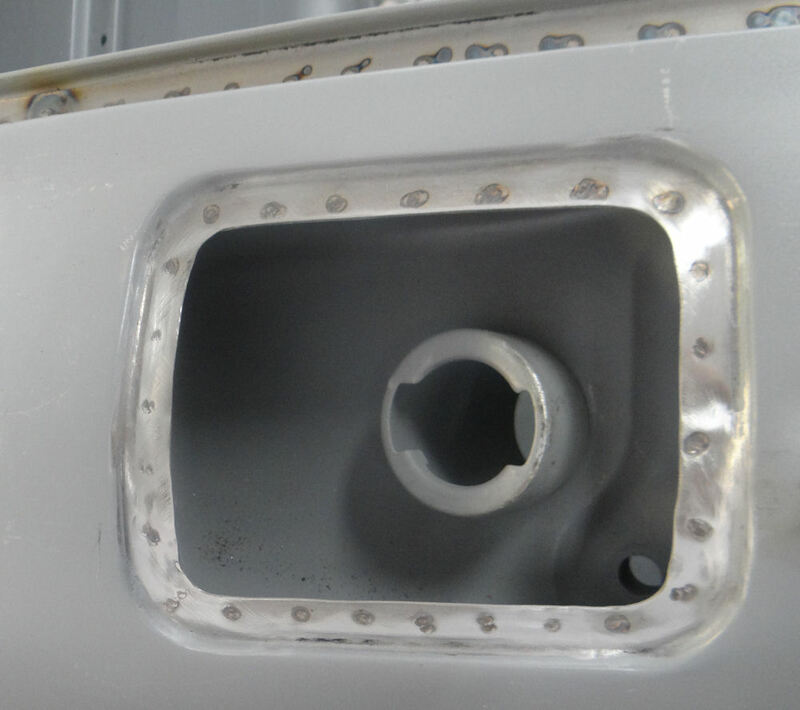 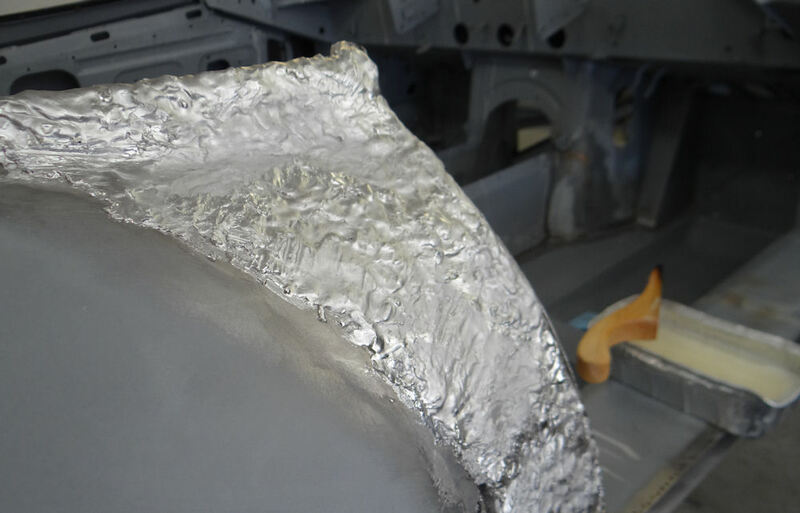 Applying the first of the Opalescent Gunmetal paint..
After a week of welding, grinding and hammering, your chrome trial fit has been completed. 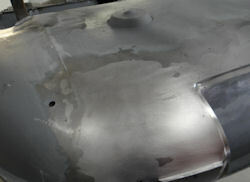 It is almost time to mix up some Opalescent Gunmetal! 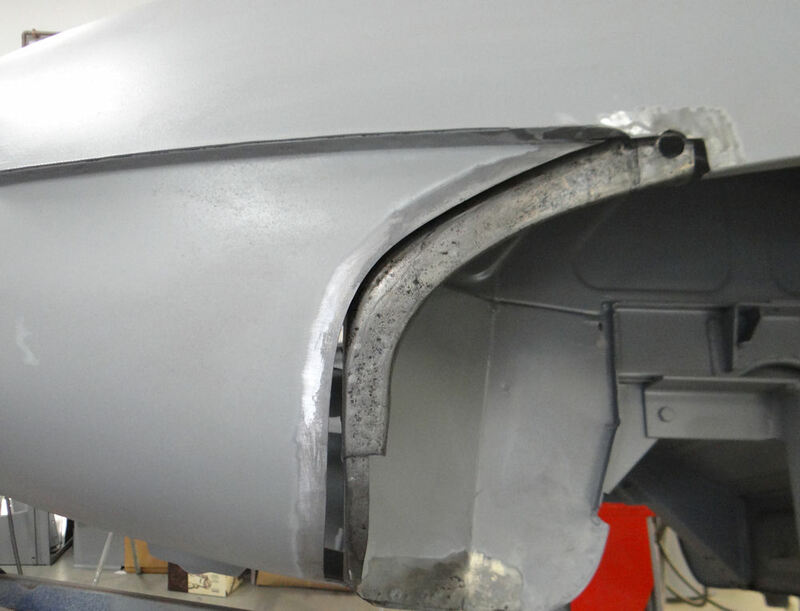 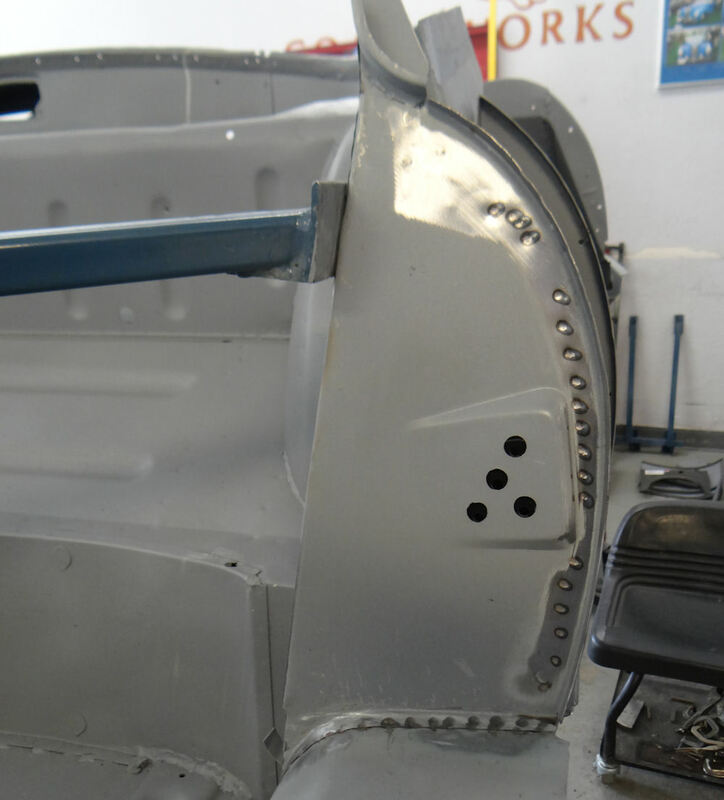 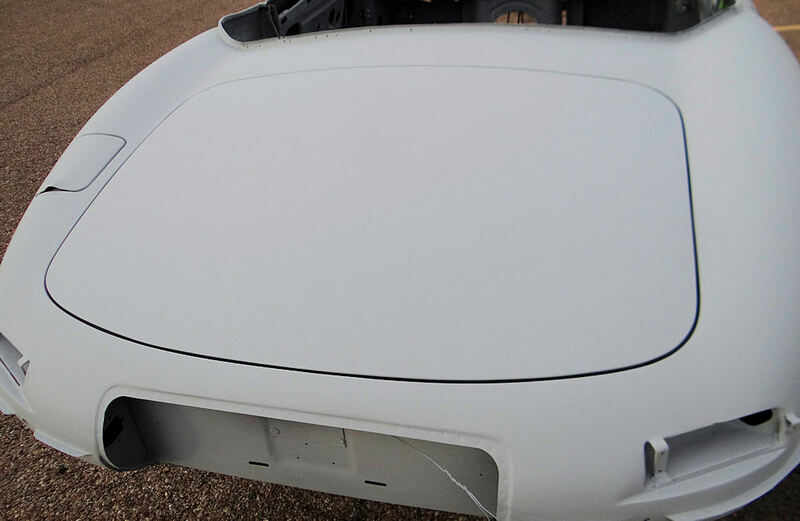 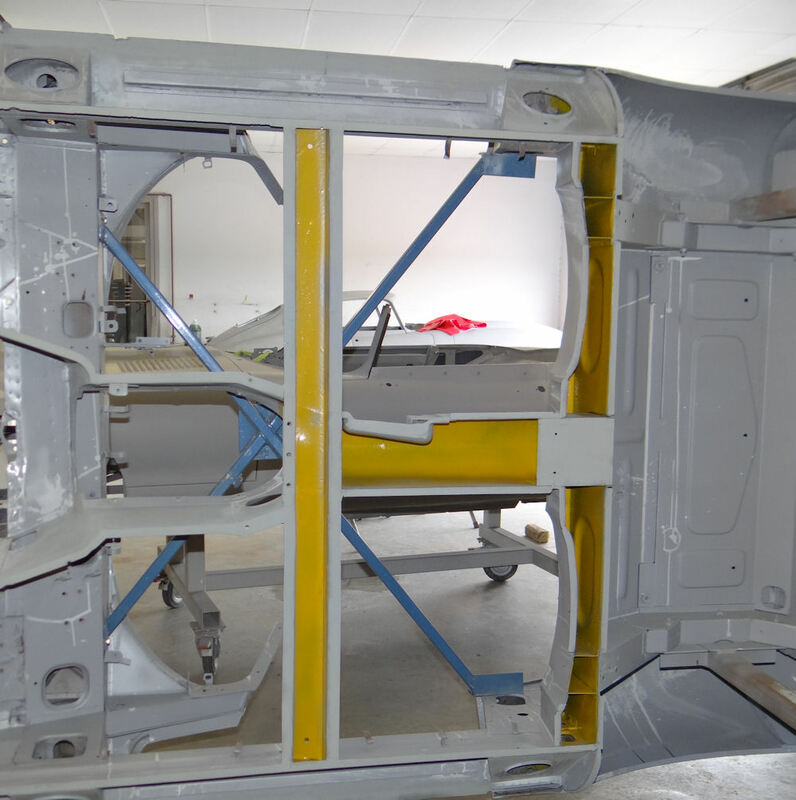 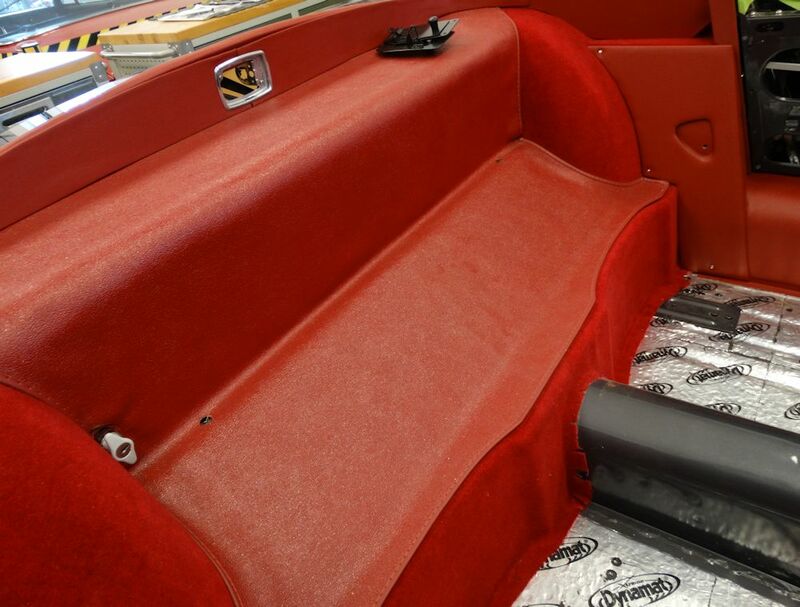 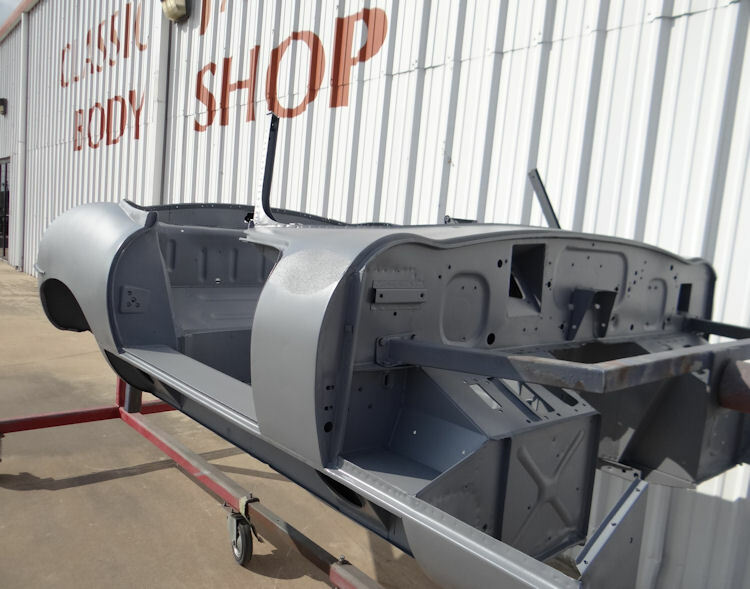 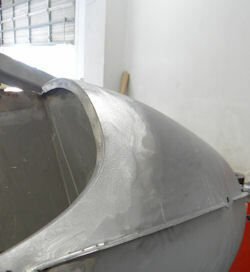 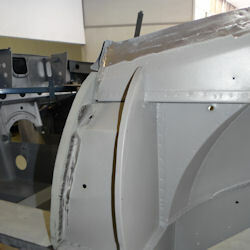 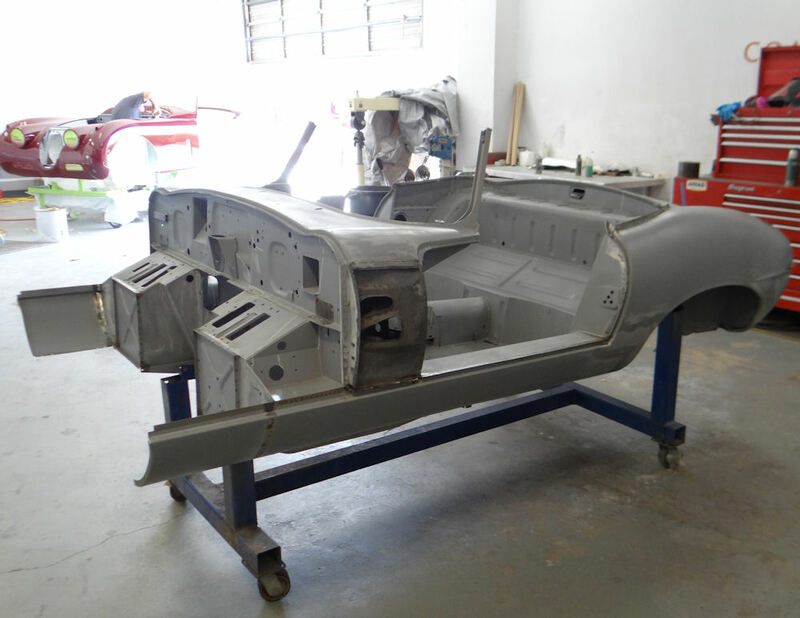 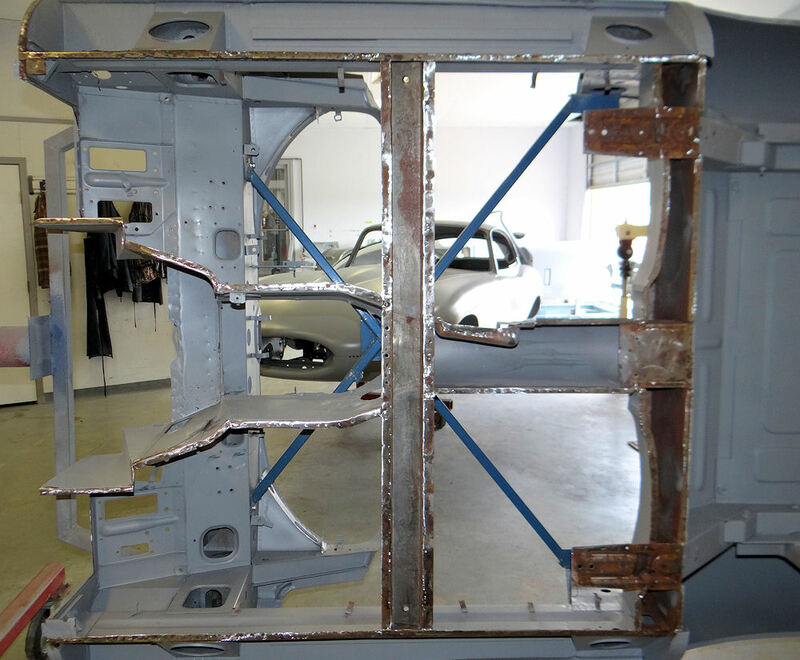 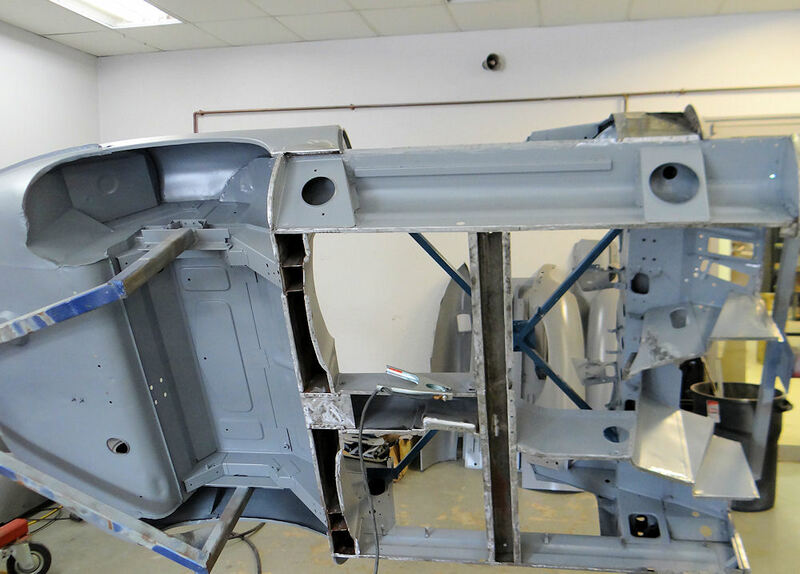 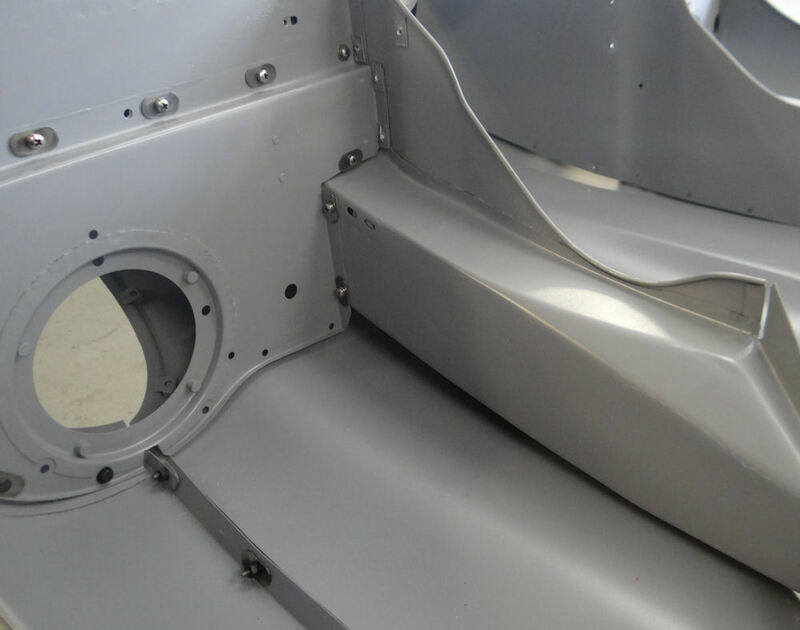 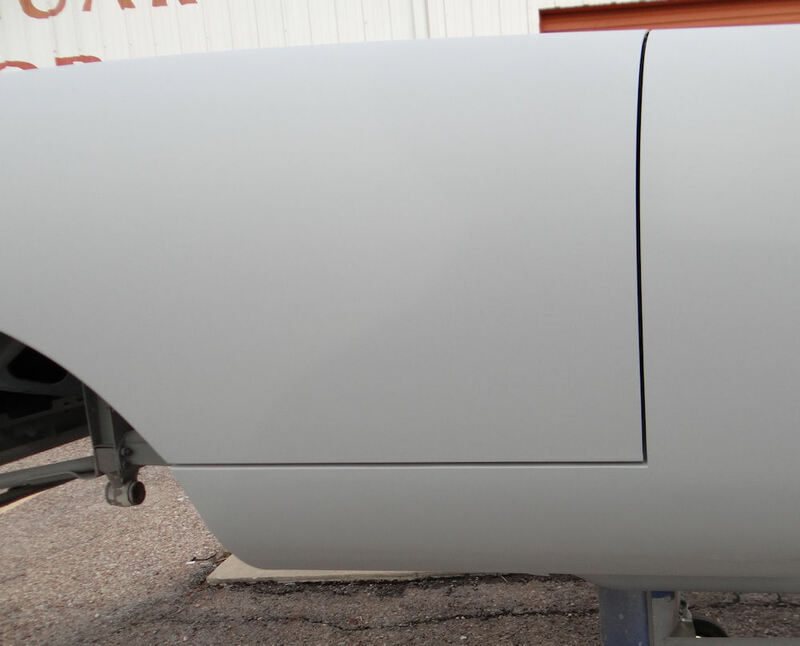 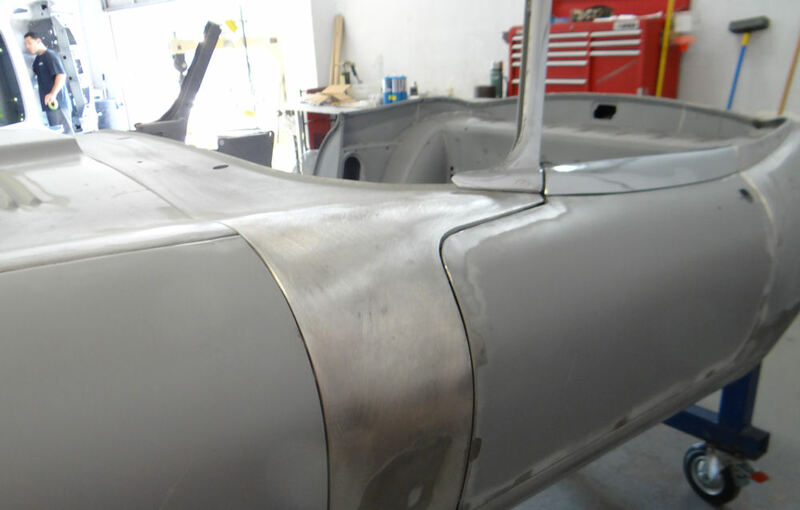 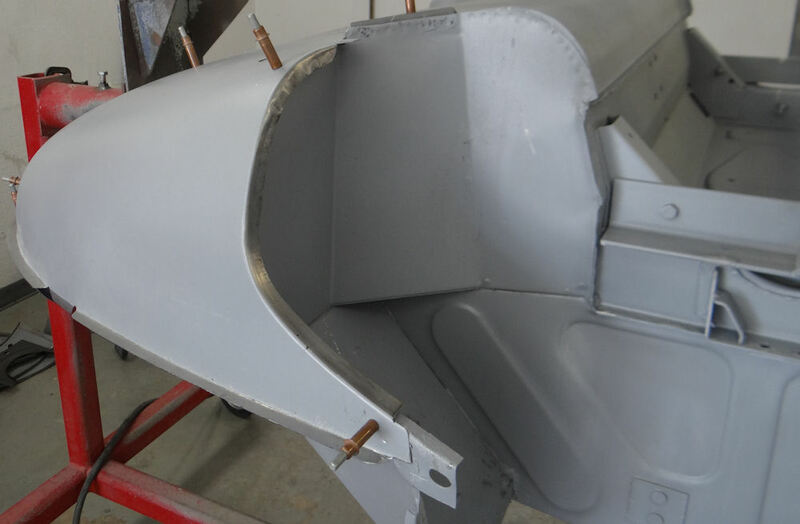 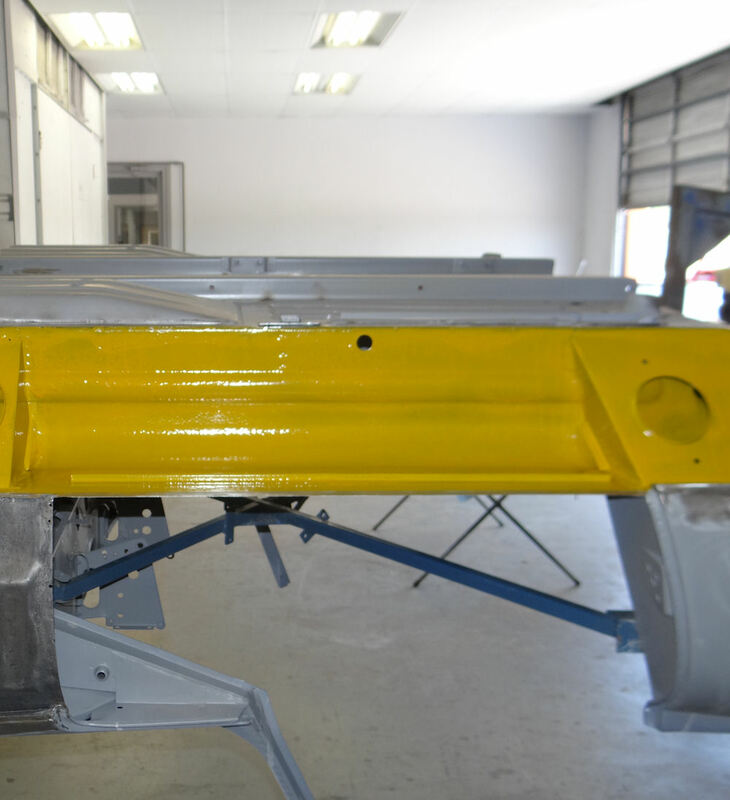 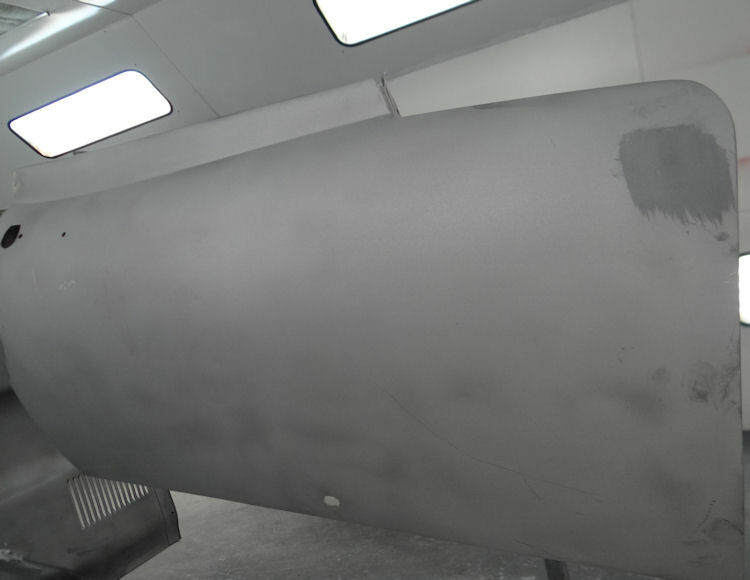 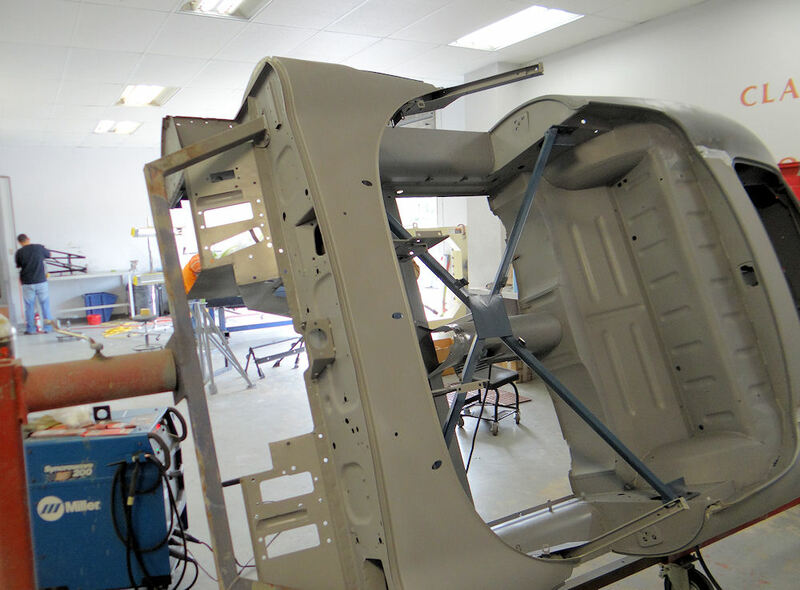 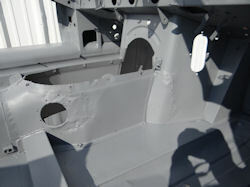 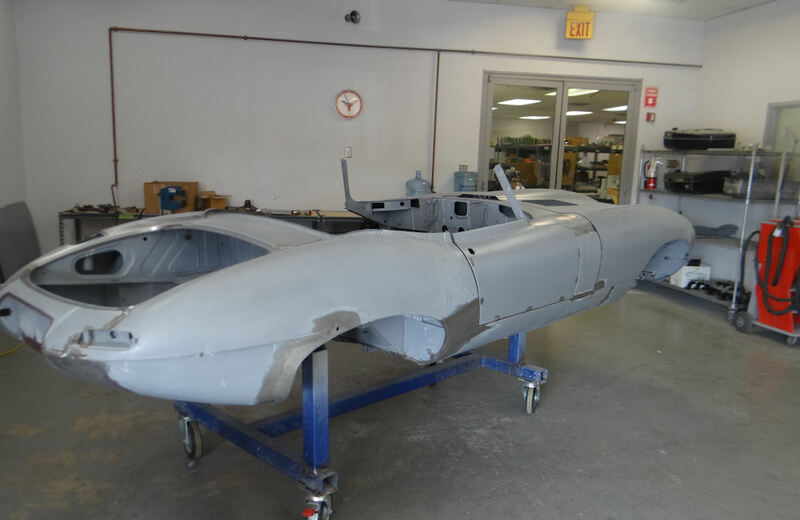 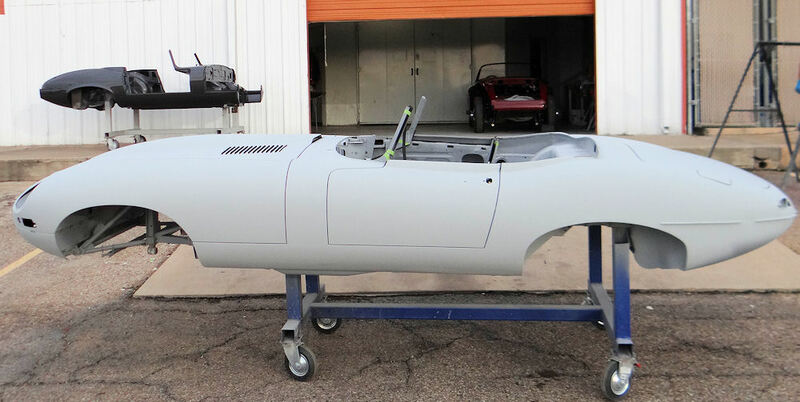 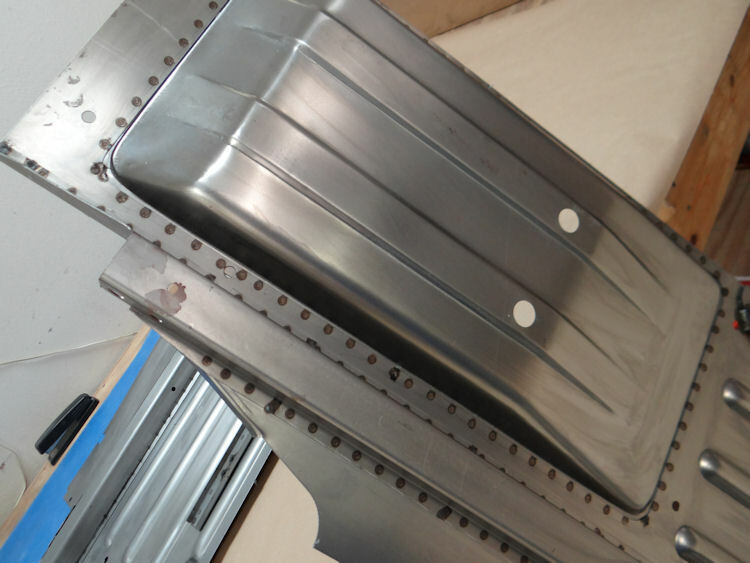 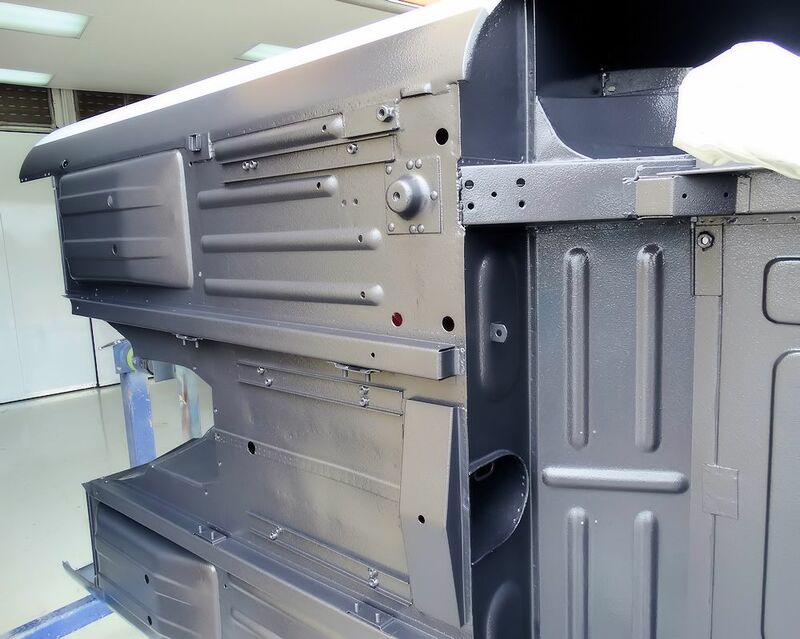 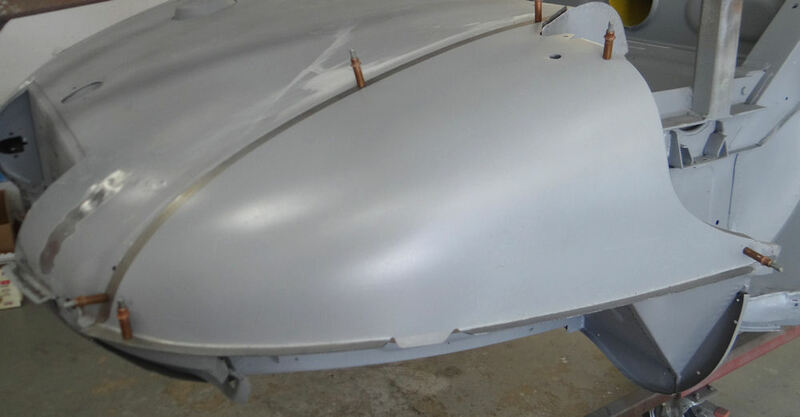 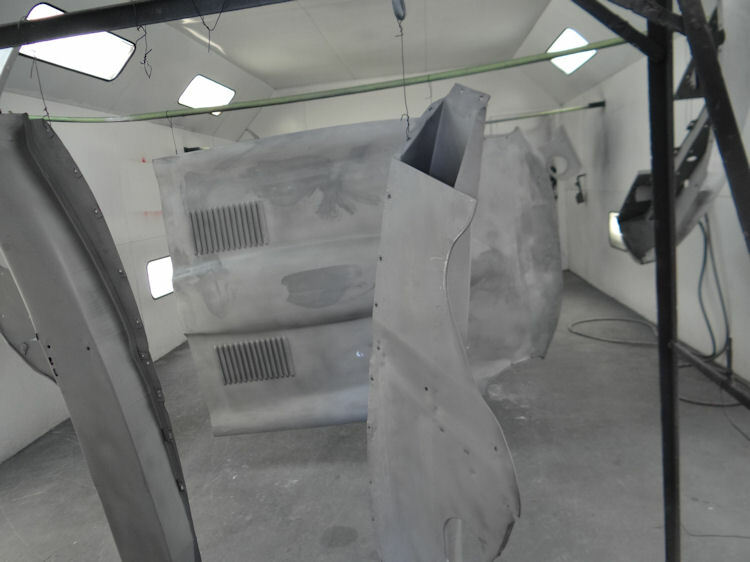 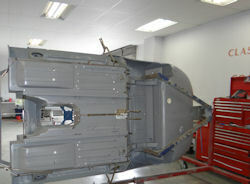 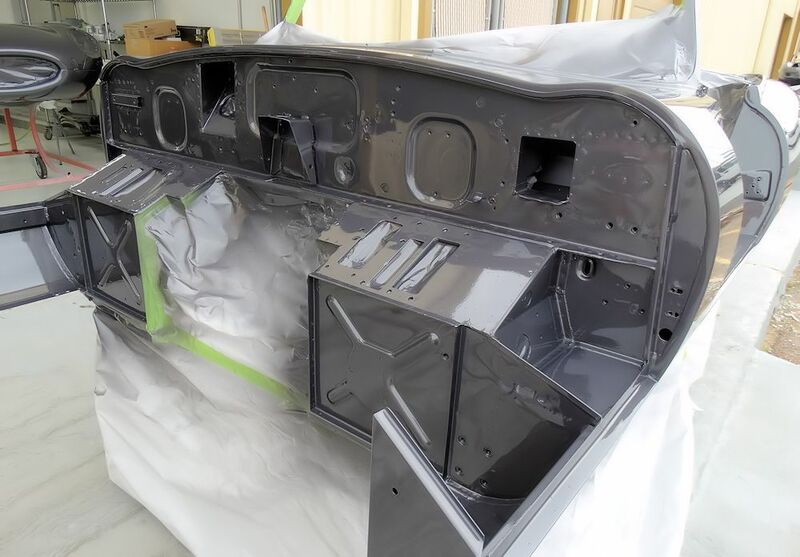 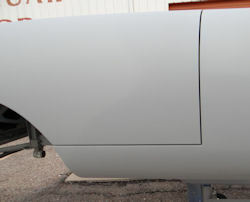 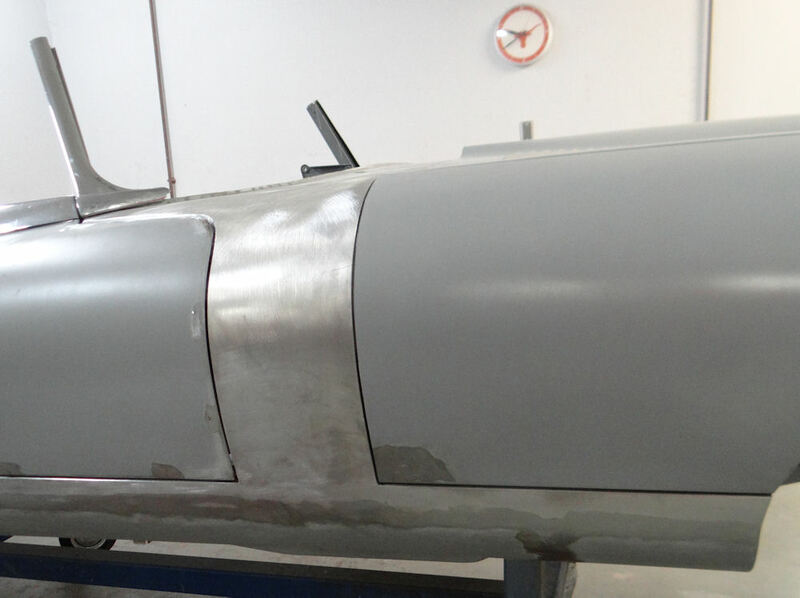 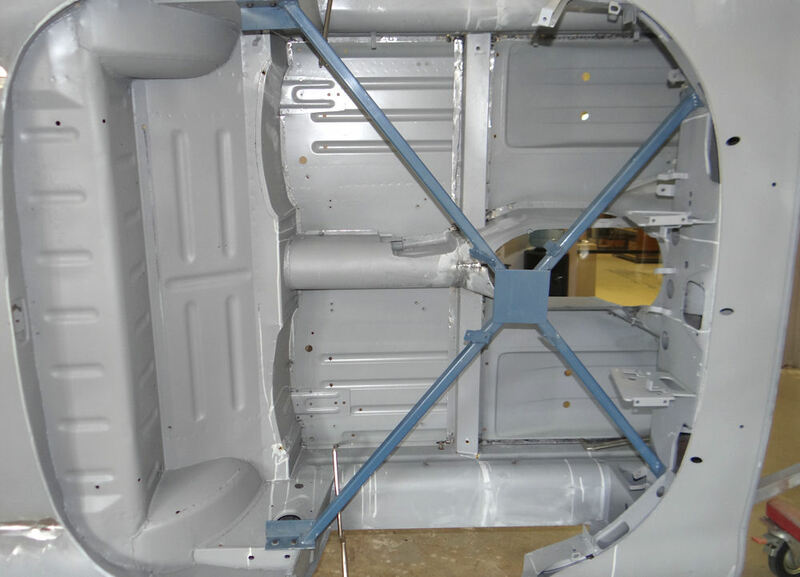 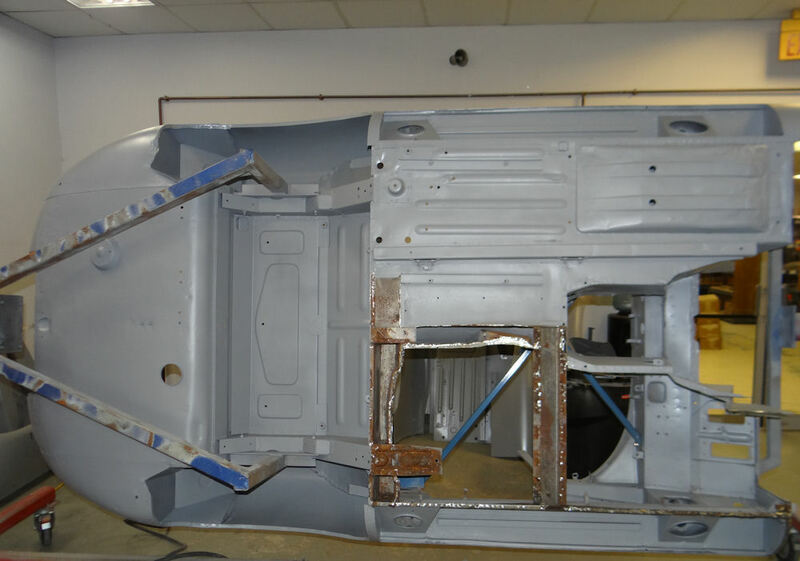 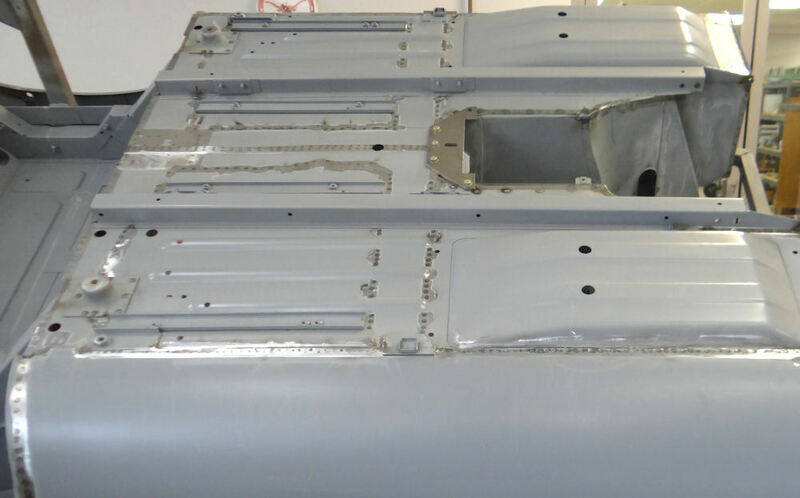 We have now completed the bodywork stage of this restoration and the car has been put into high build, sprayable polyester primer. 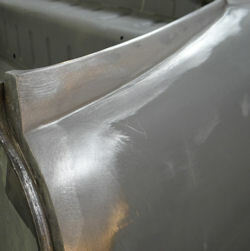 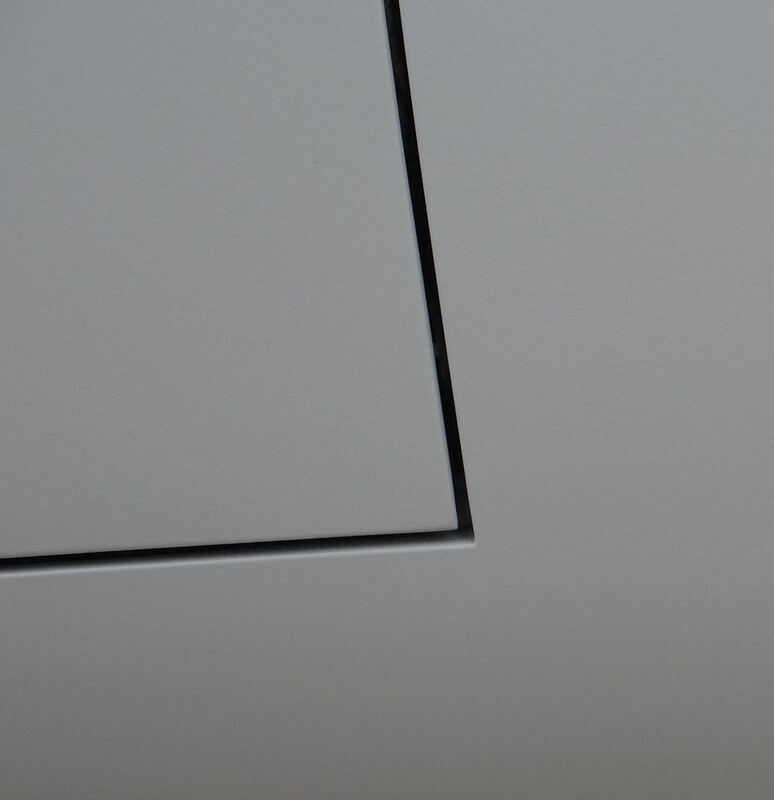 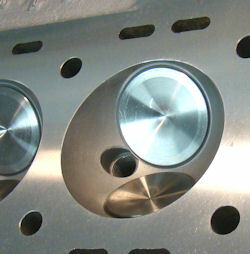 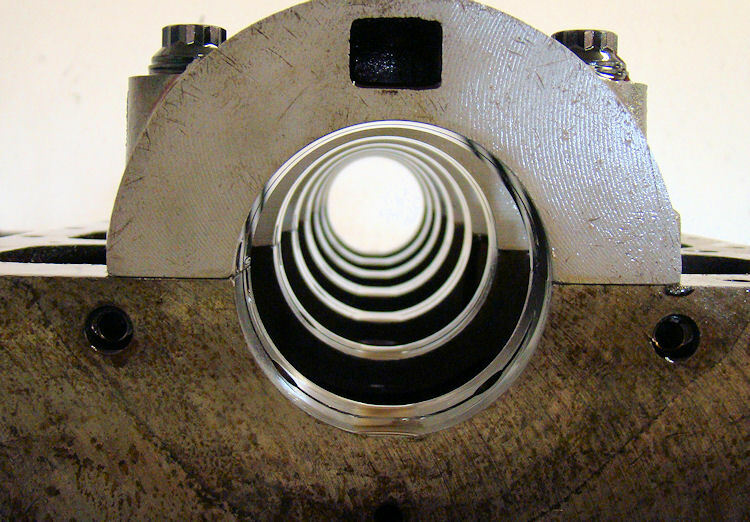 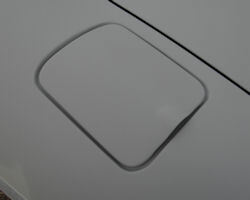 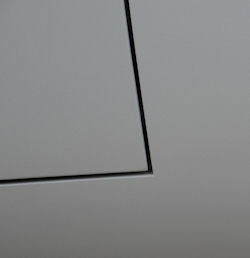 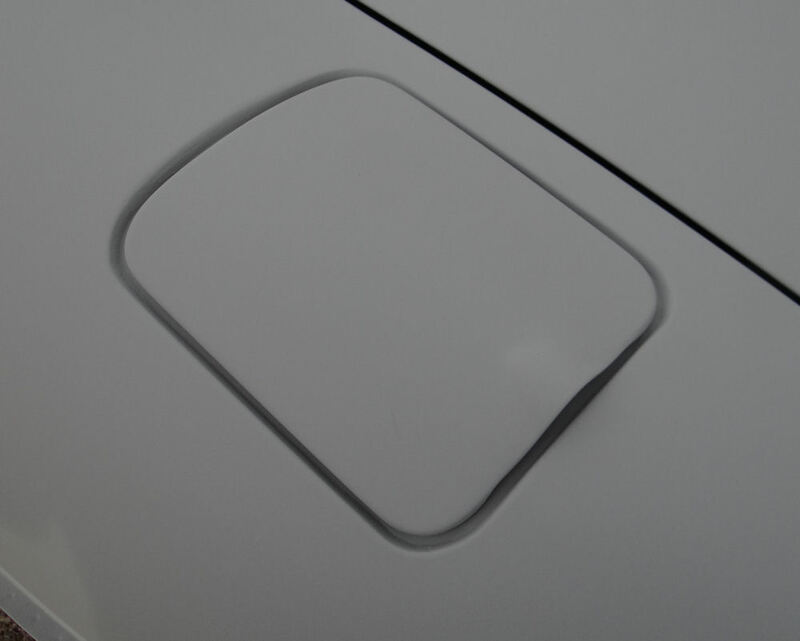 The last photo in the sequence below shows a magnified image of the bonnet gap, which is as good as it gets.. 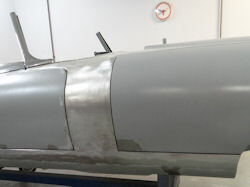 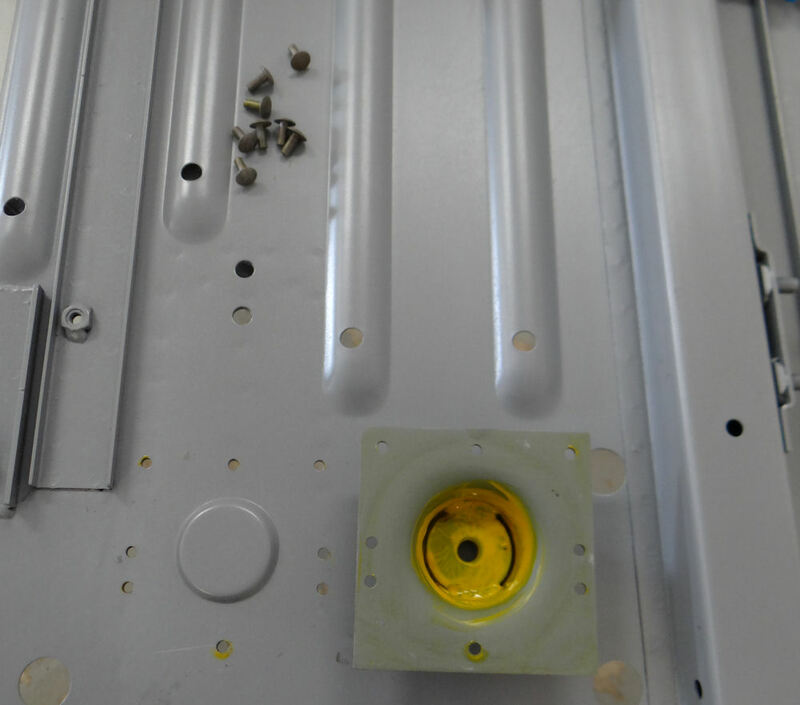 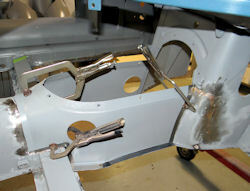 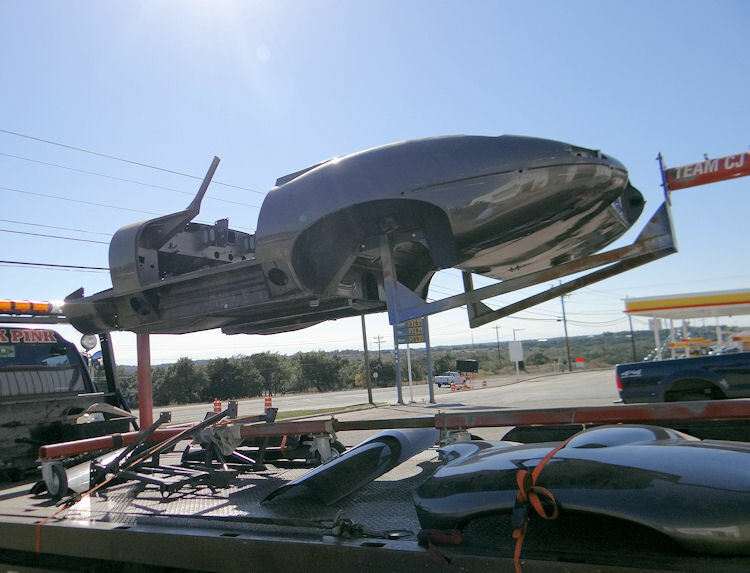 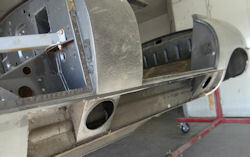 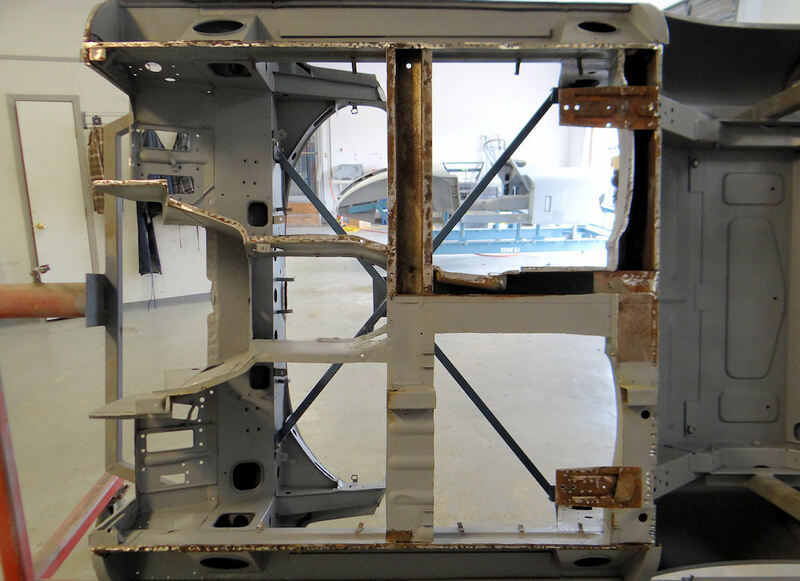 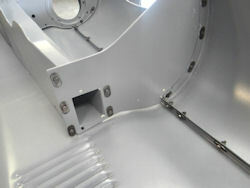 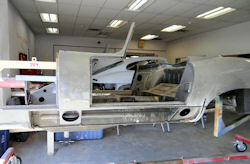 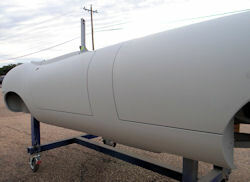 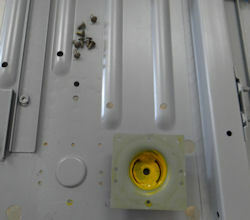 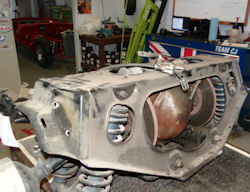 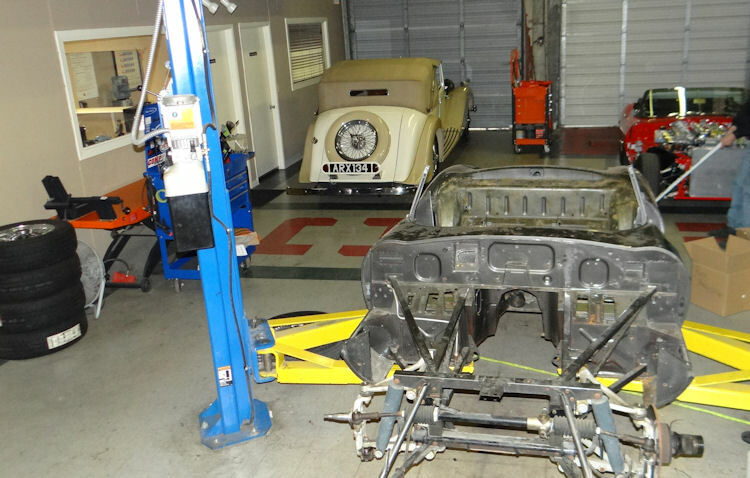 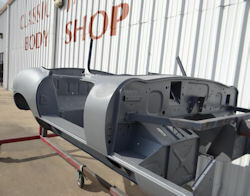 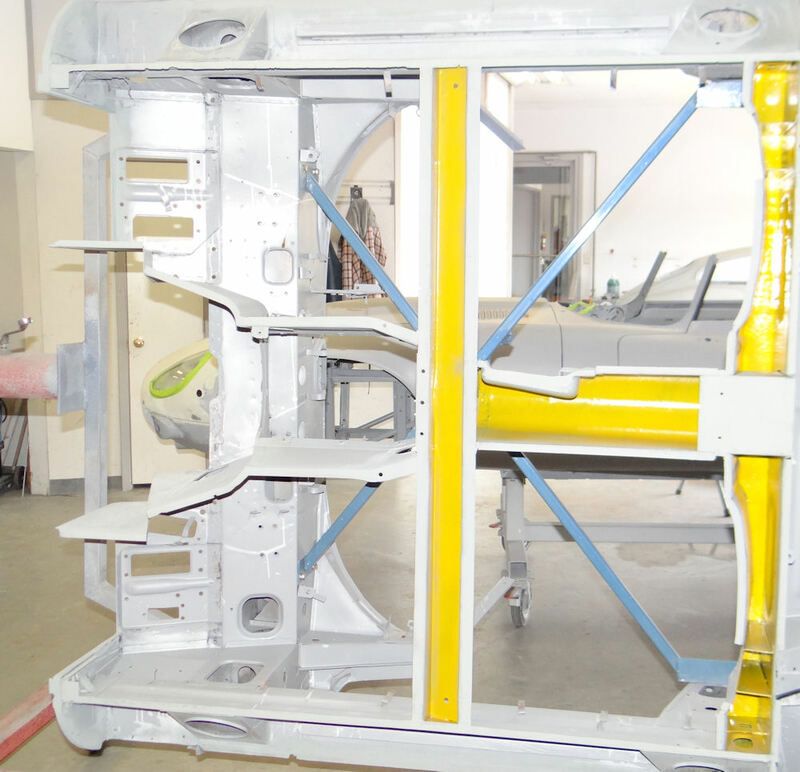 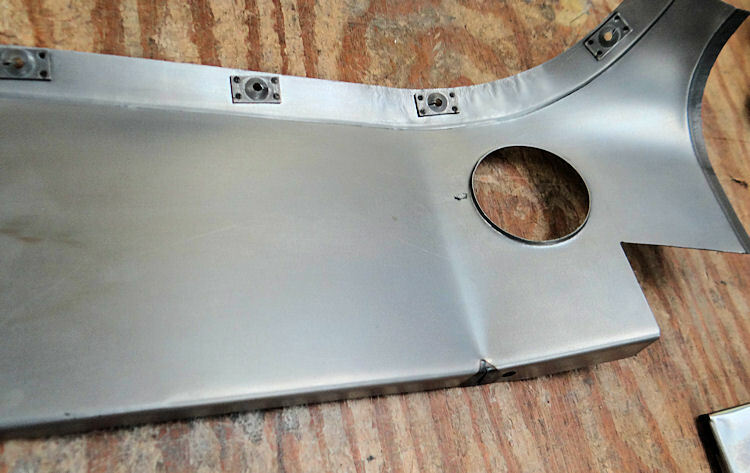 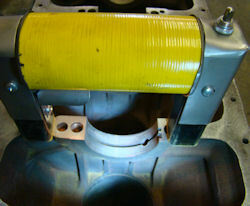 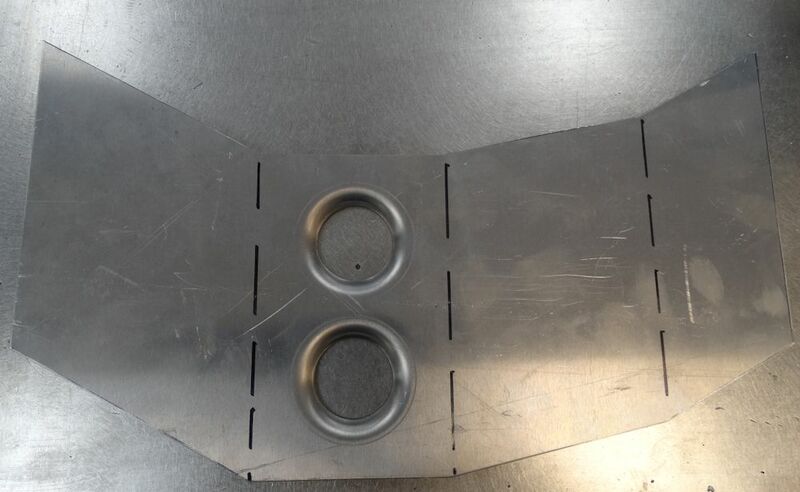 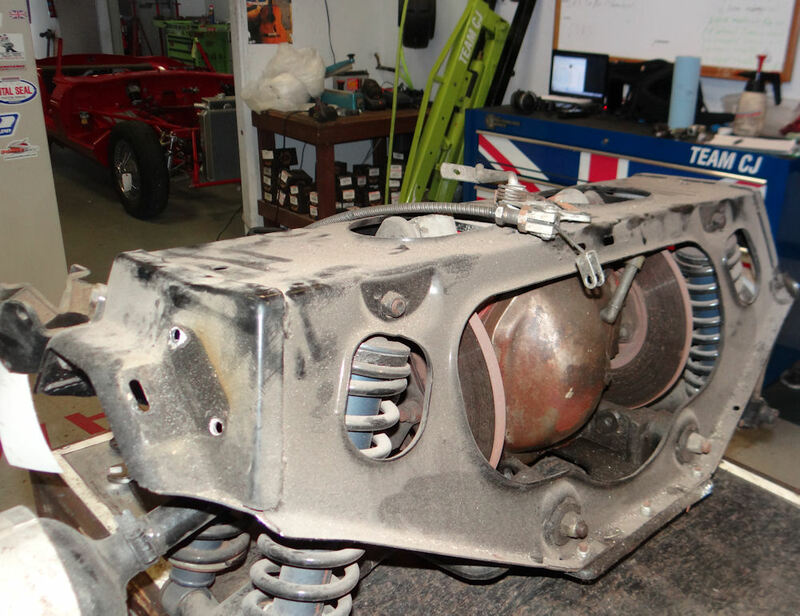 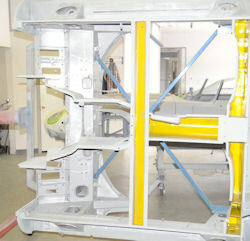 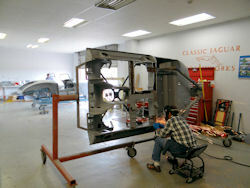 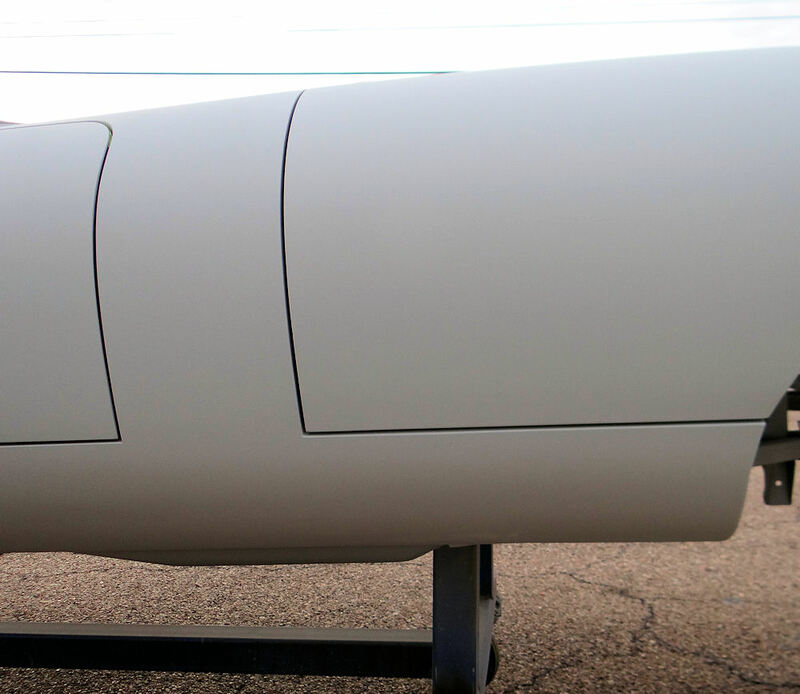 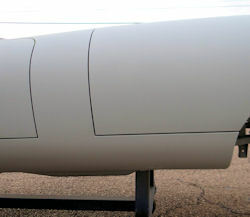 Your bodyshell has been removed from the rotisserie and is sitting on one of the roll-around frame jigs. 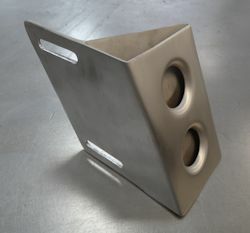 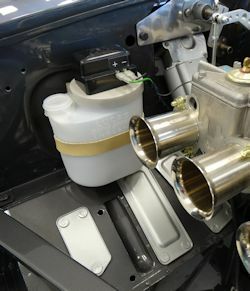 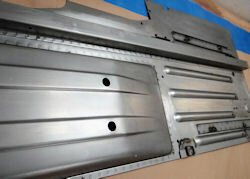 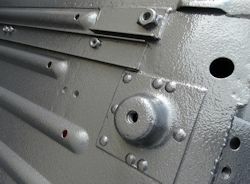 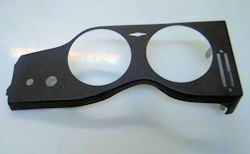 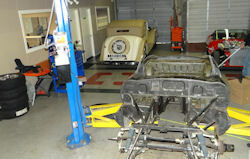 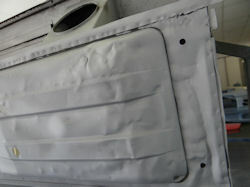 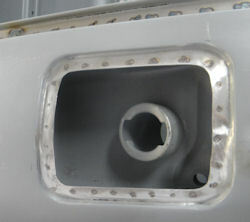 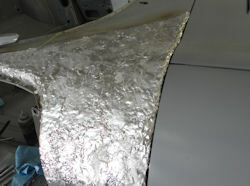 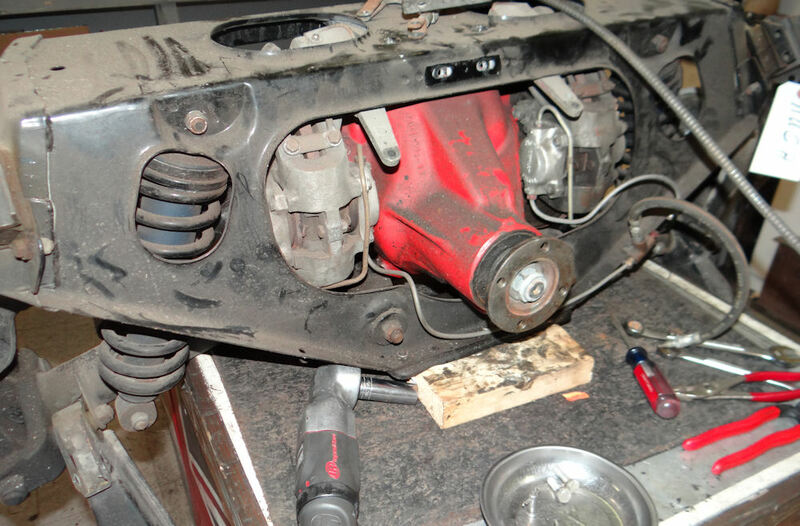 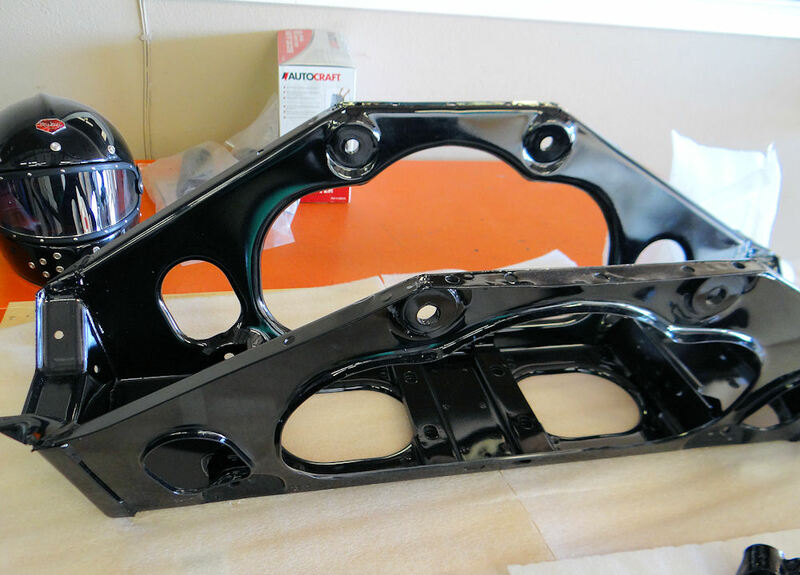 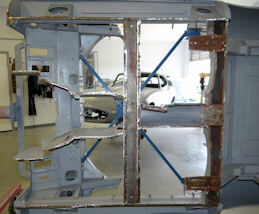 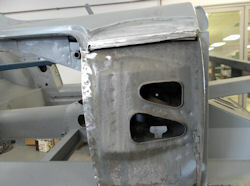 Over the next few days we will be installing the replacement engine frames and fitting your new bonnet. 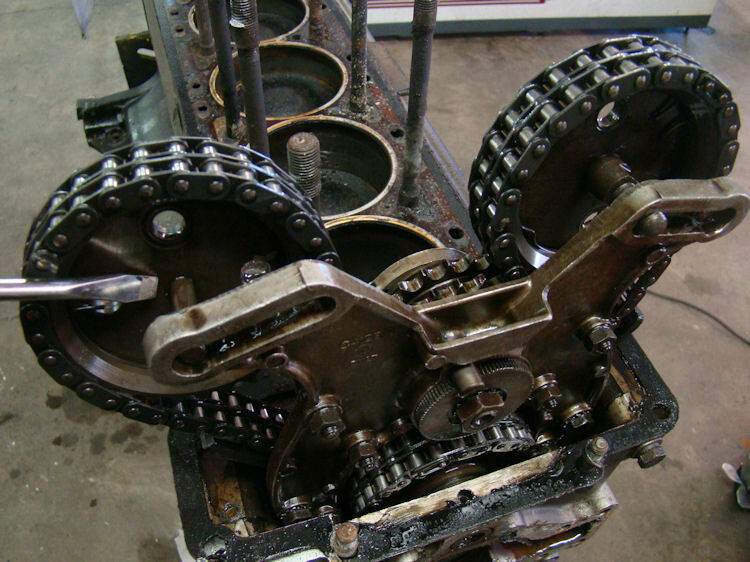 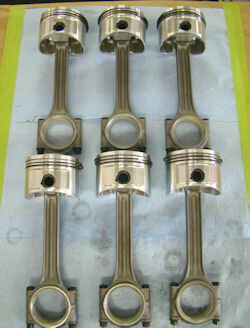 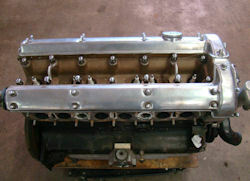 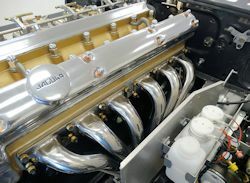 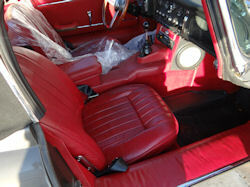 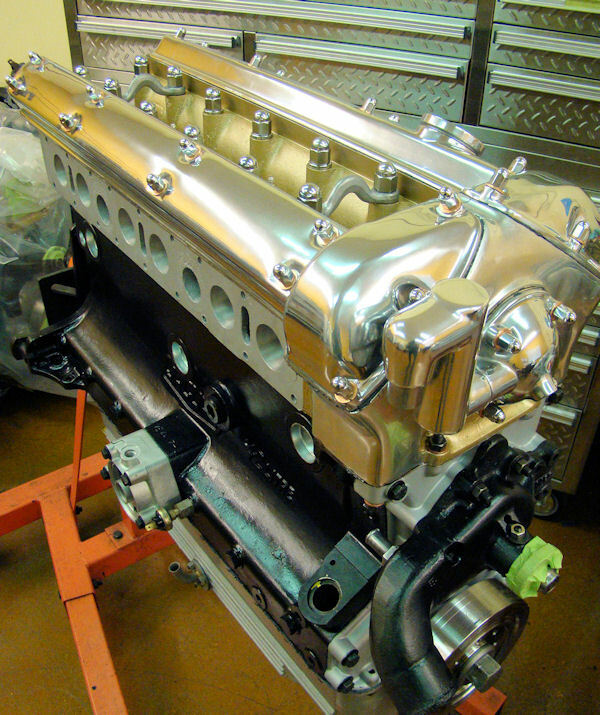 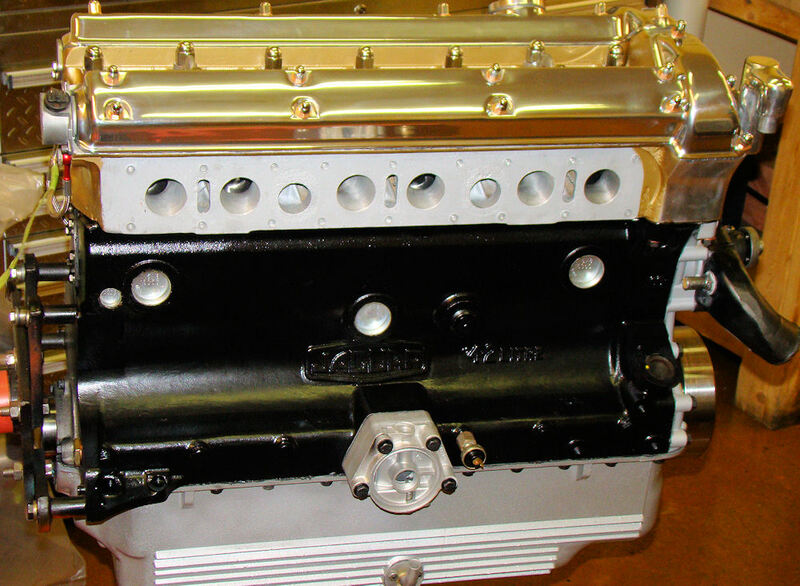 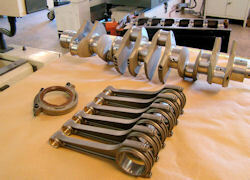 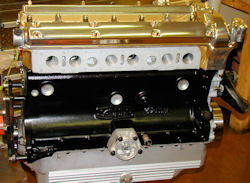 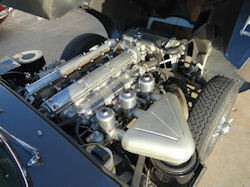 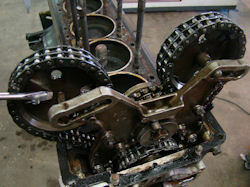 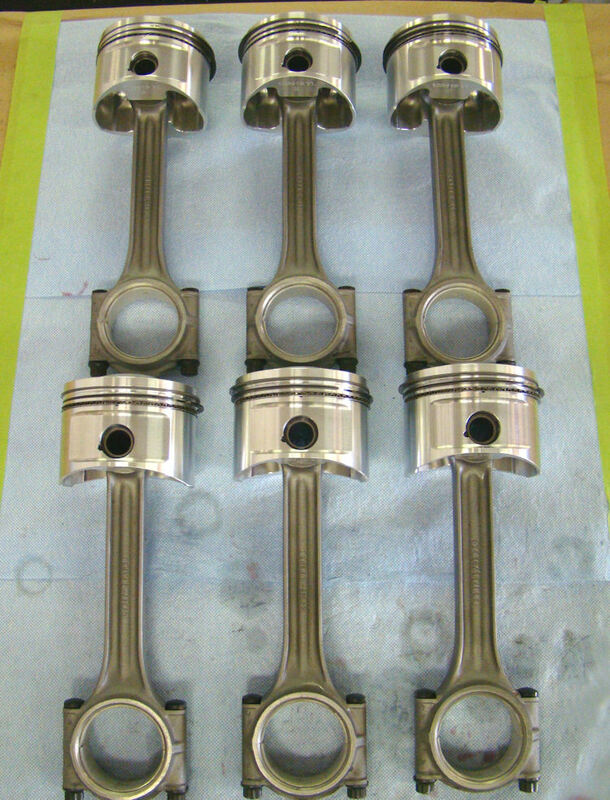 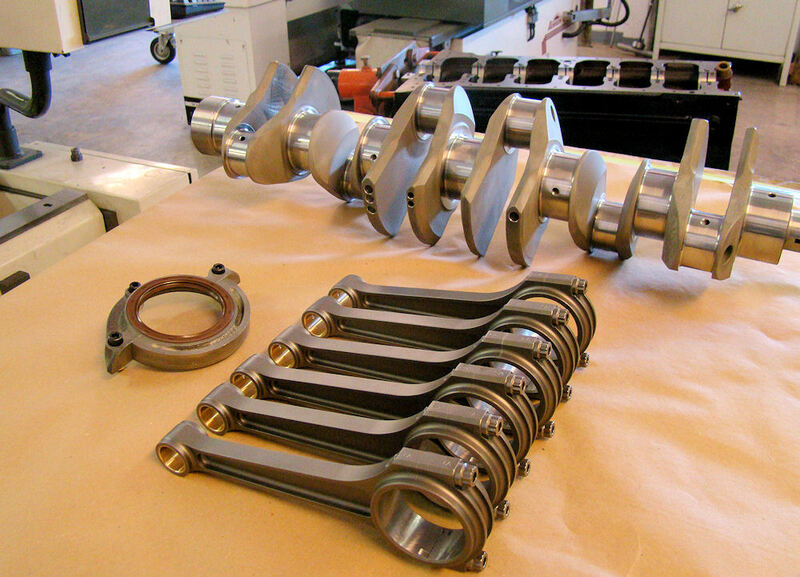 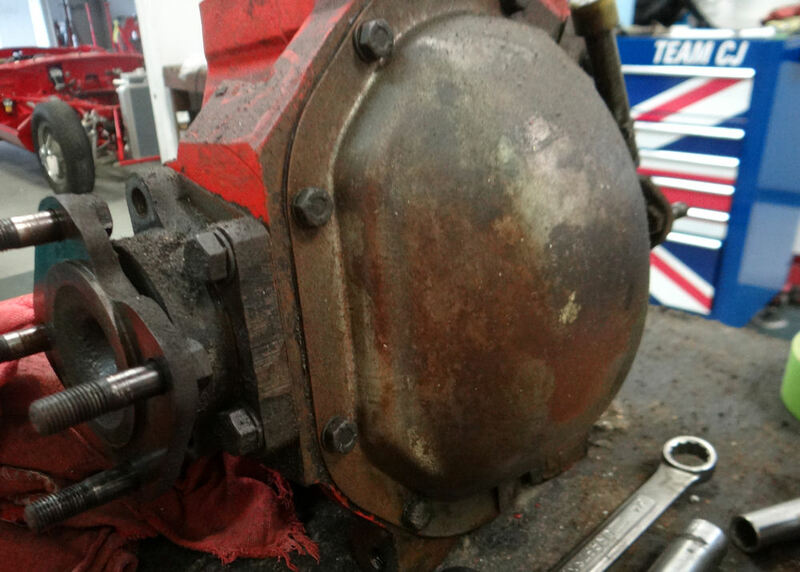 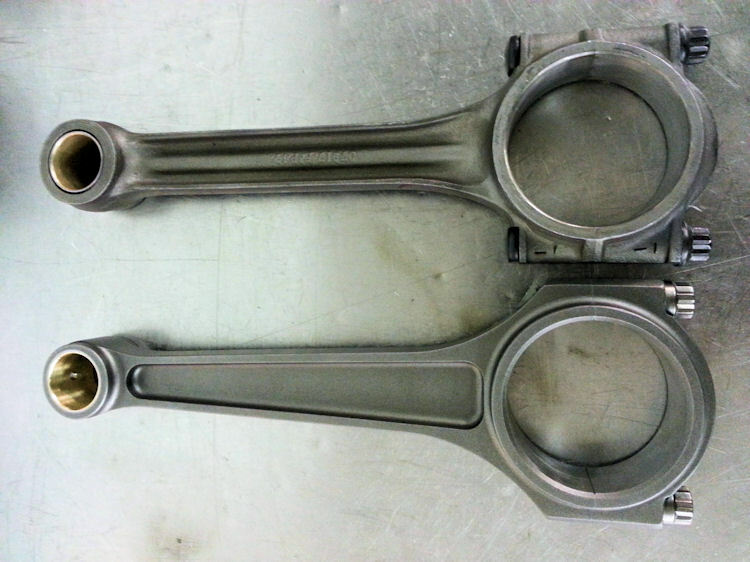 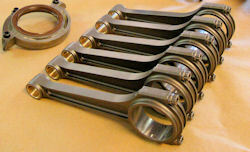 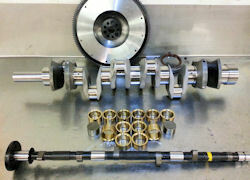 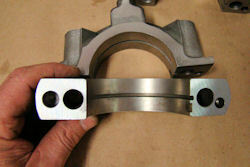 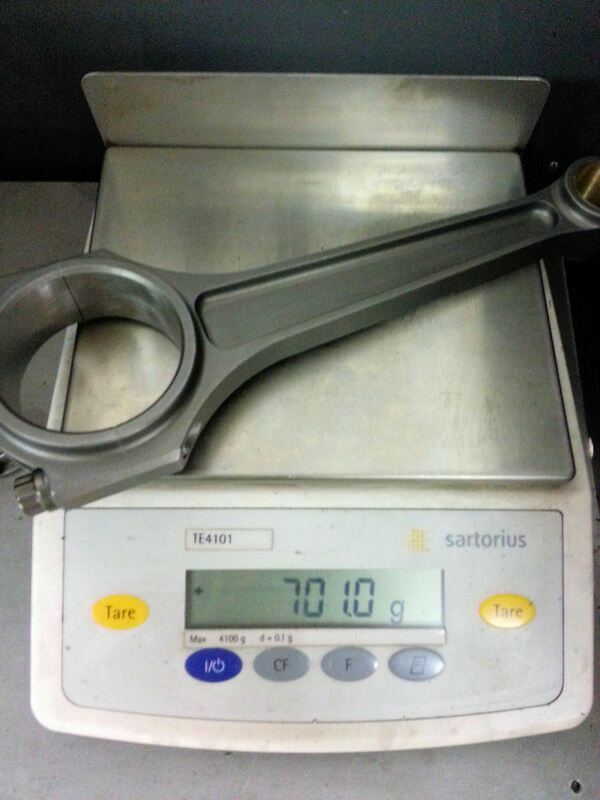 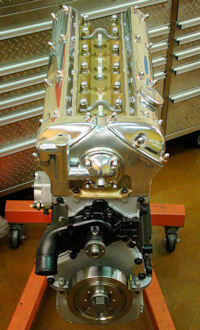 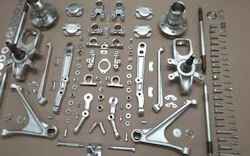 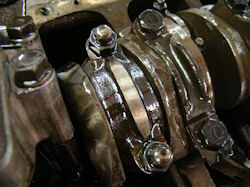 I am pleased to report that your Supersports 4.7 engine rebuild has now been completed. 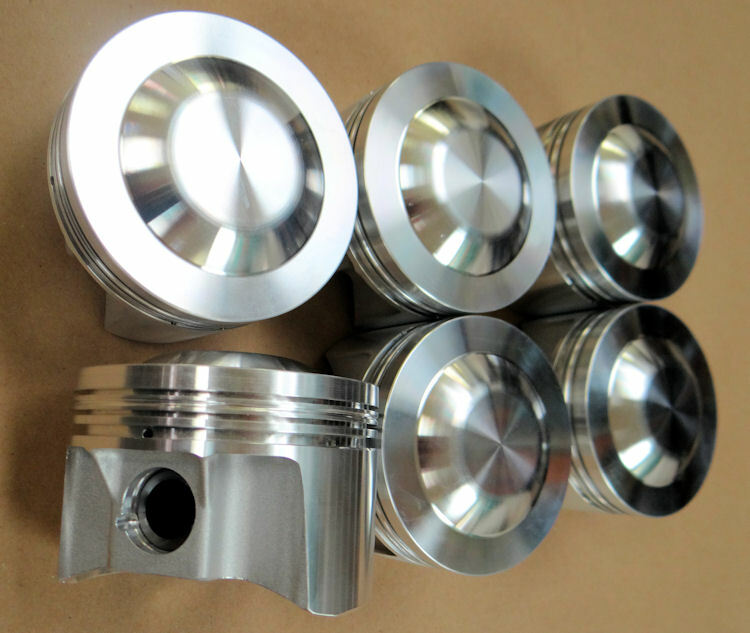 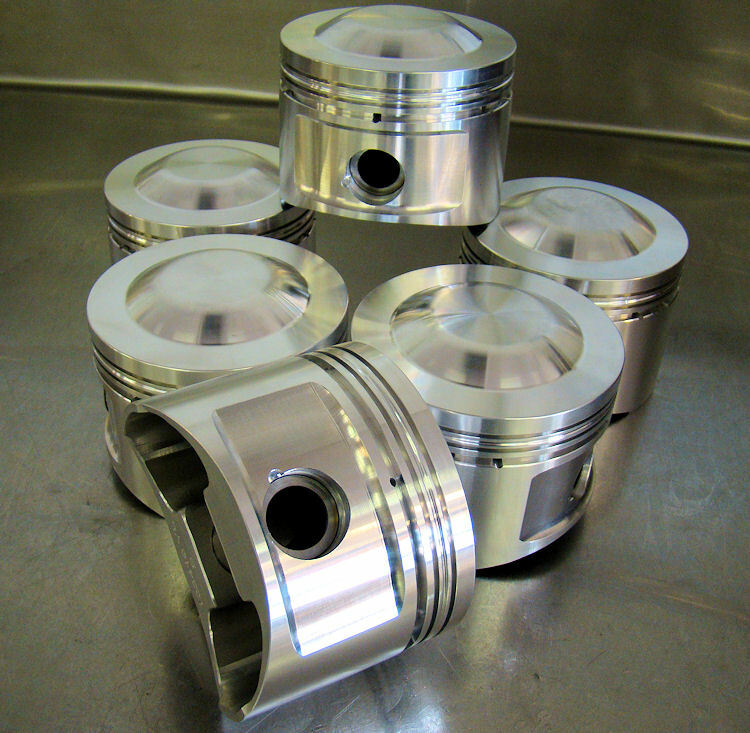 Some gorgeous machine work on display, as well as your custom 4.7 Supersports stroker pistons, and a set of forged Crower rods. 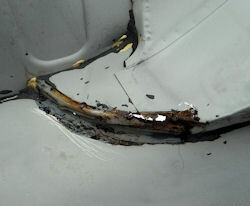 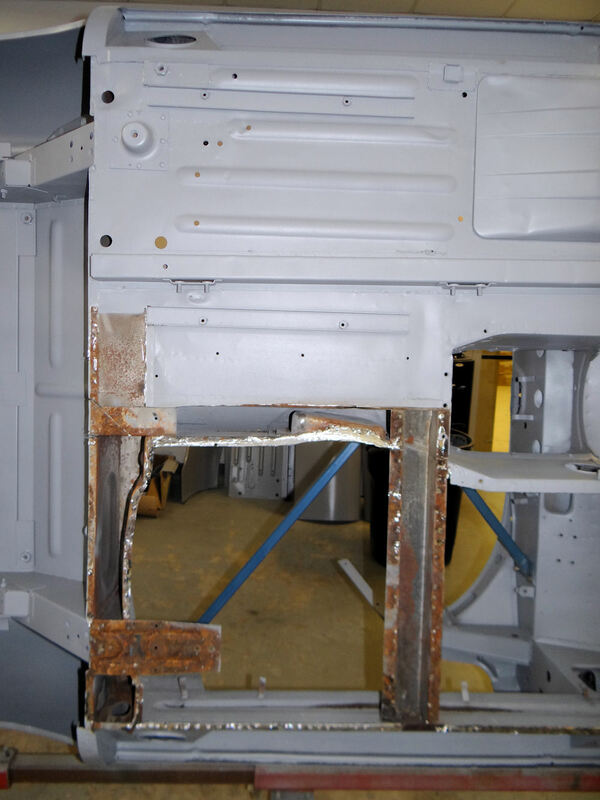 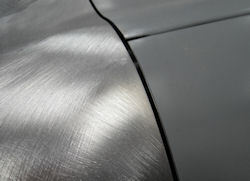 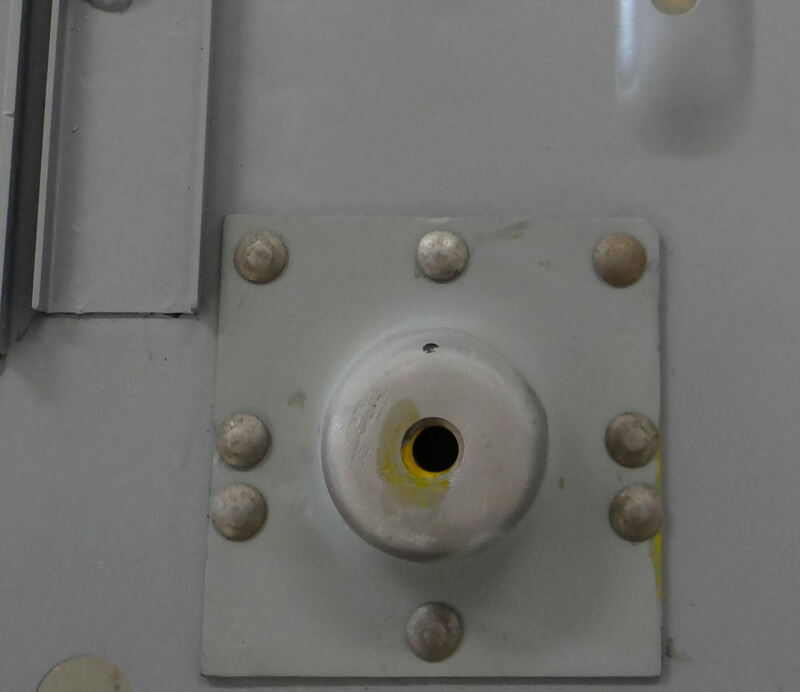 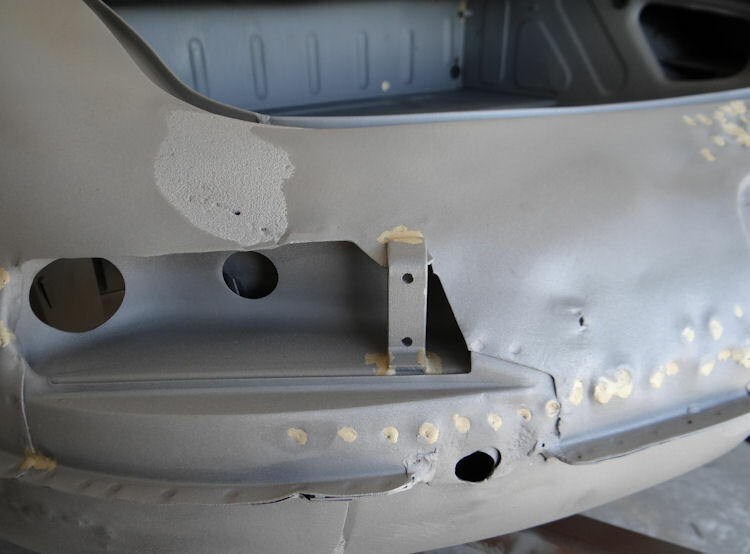 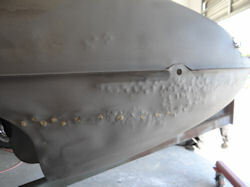 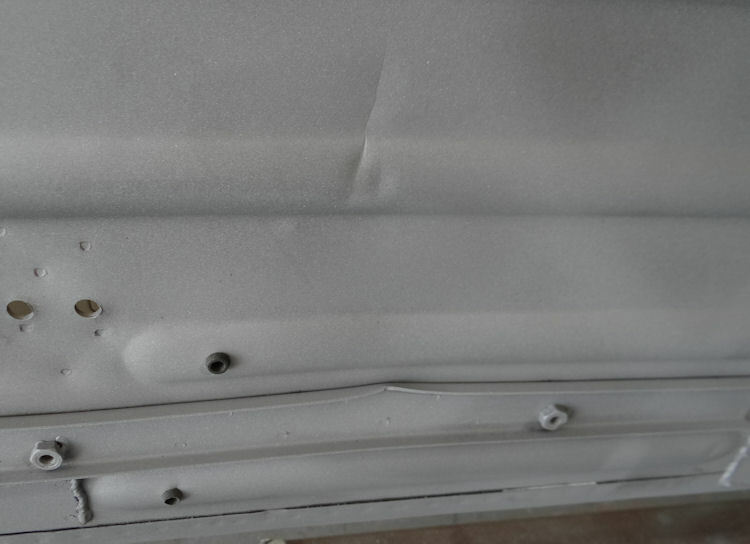 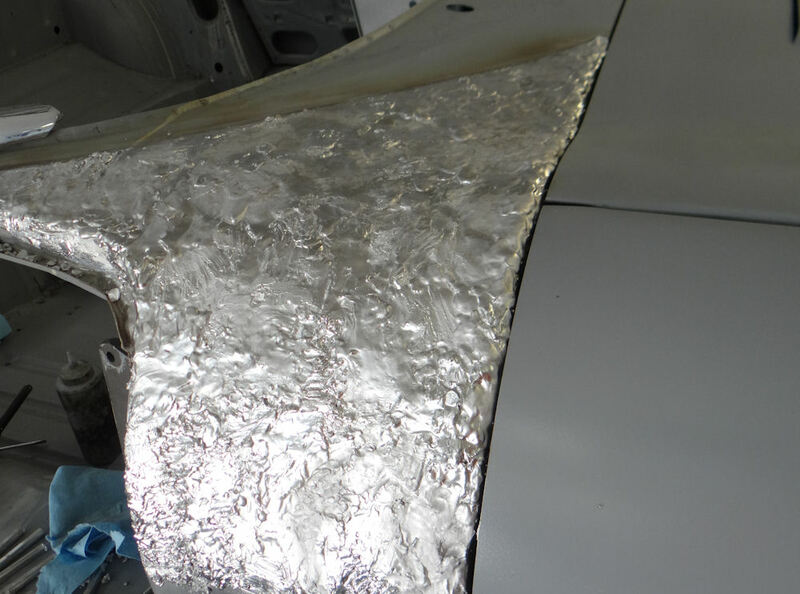 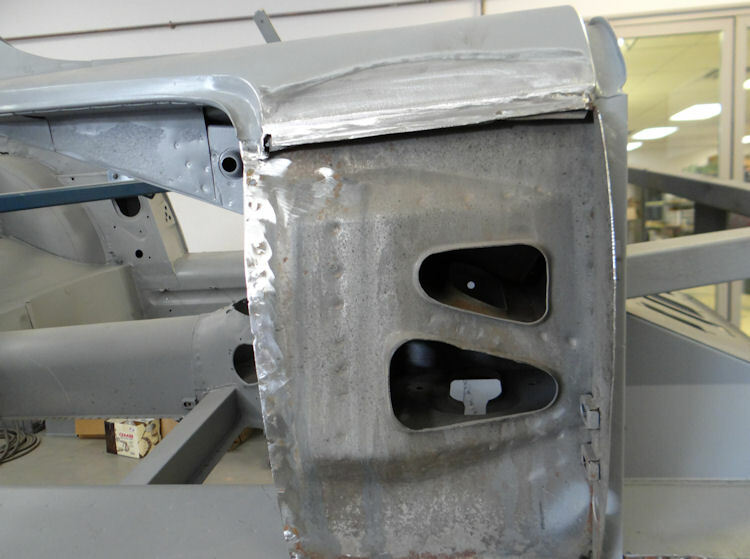 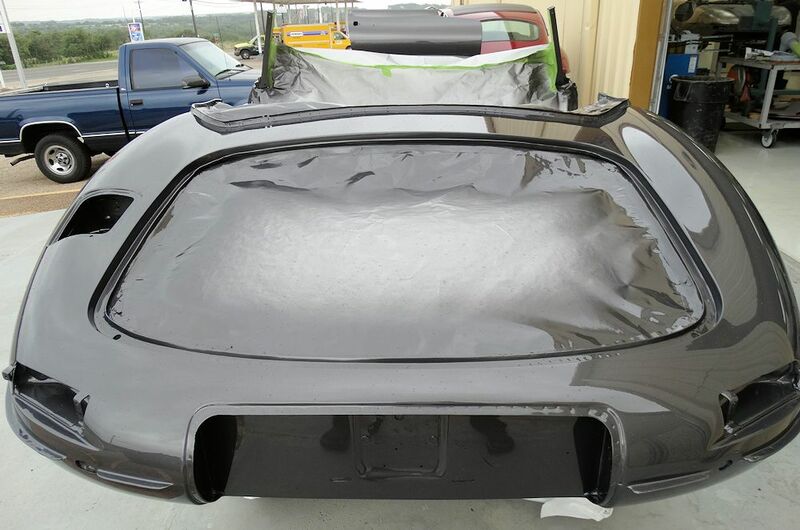 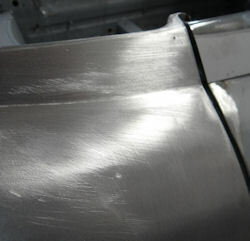 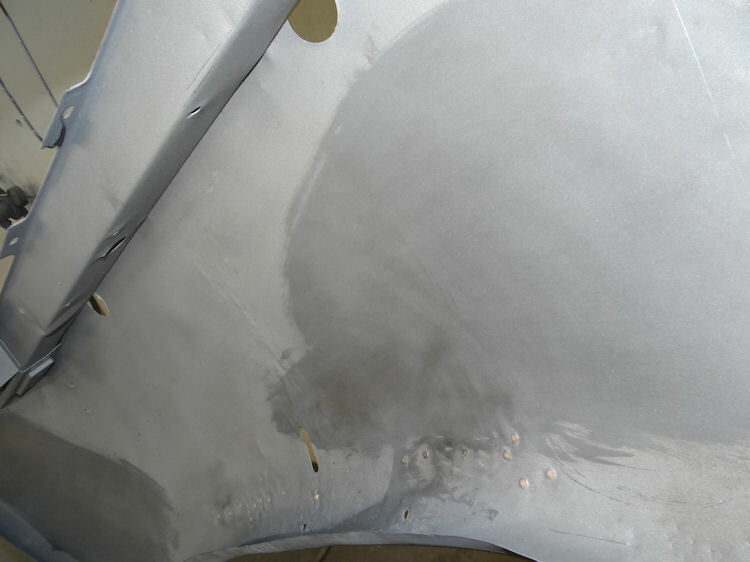 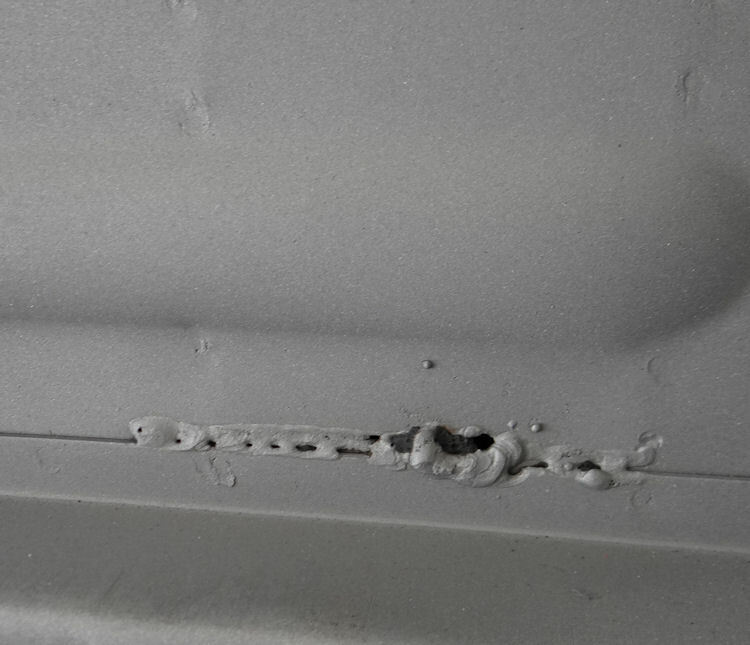 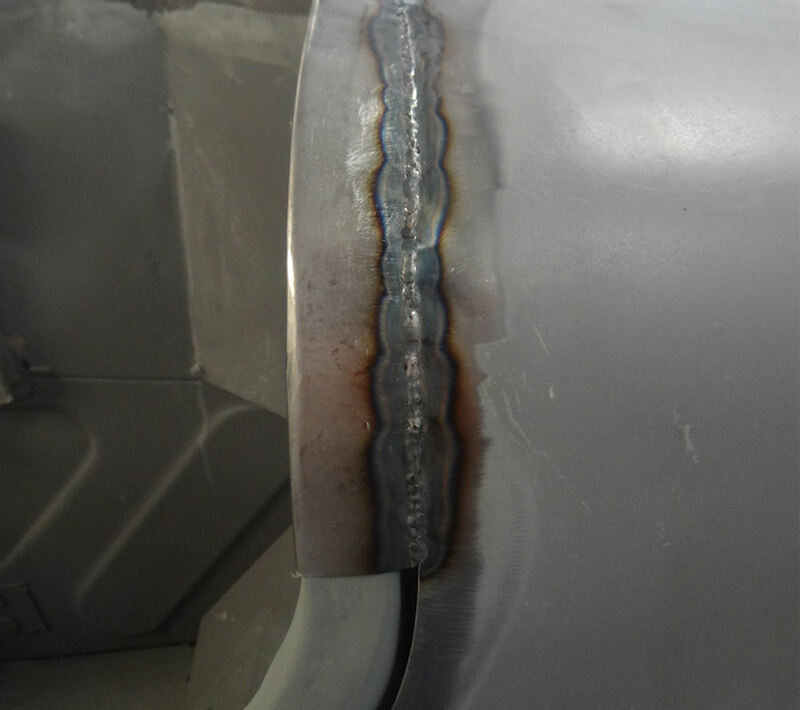 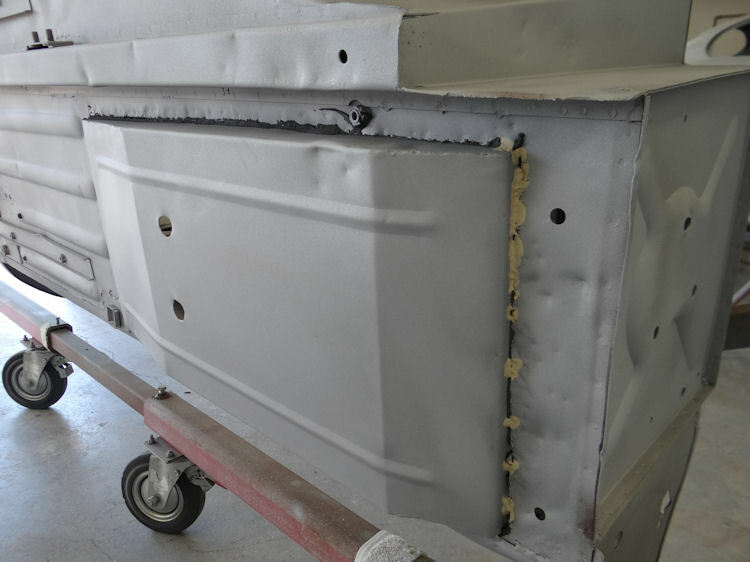 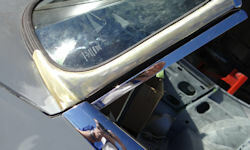 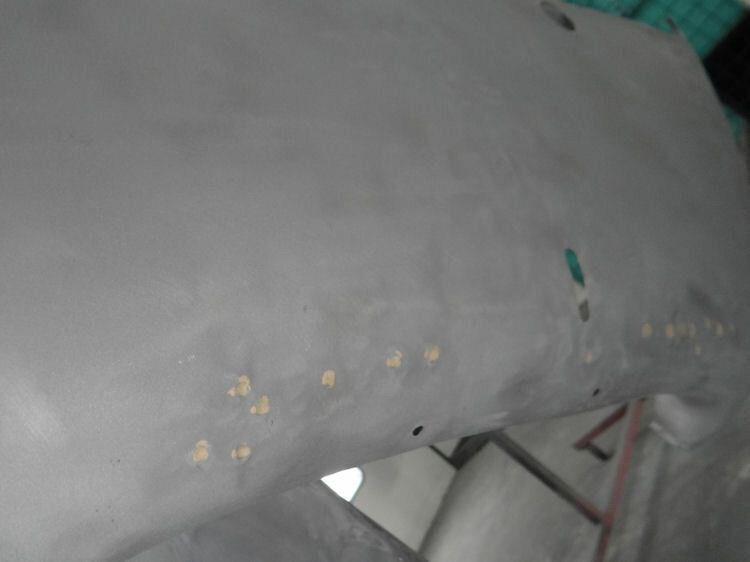 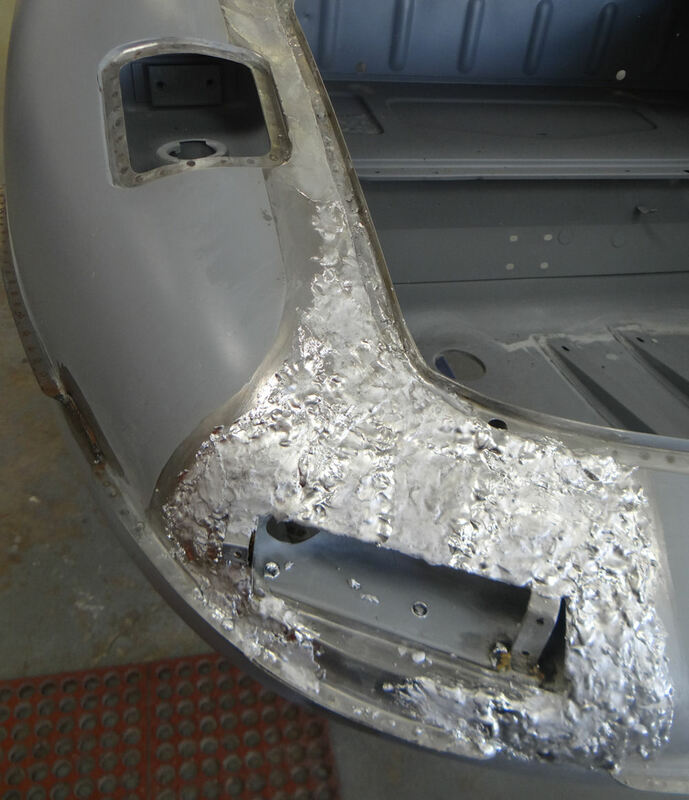 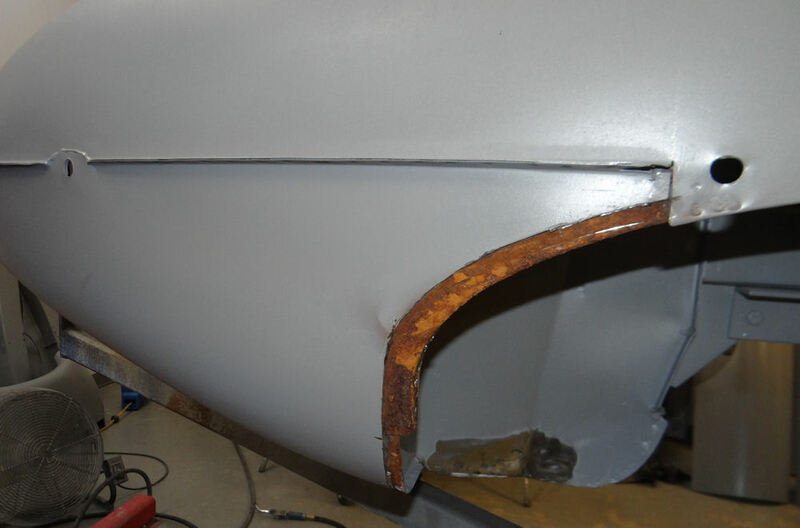 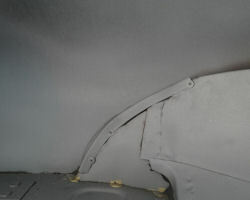 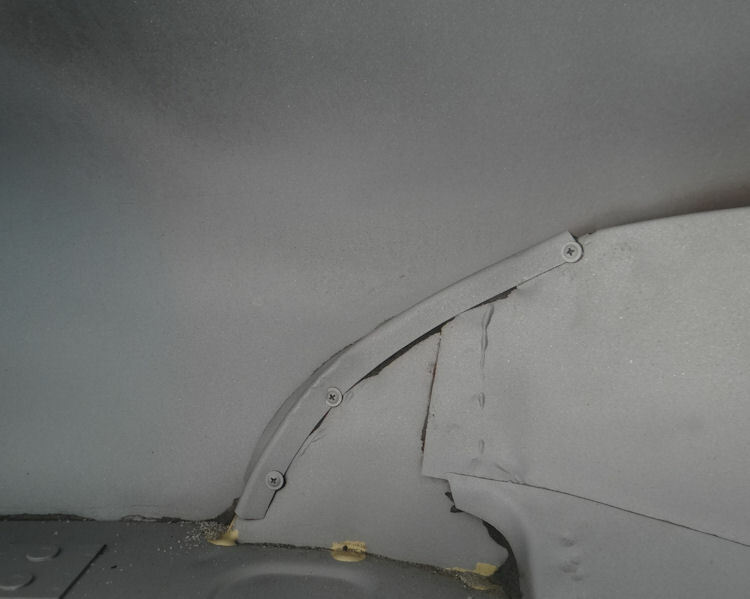 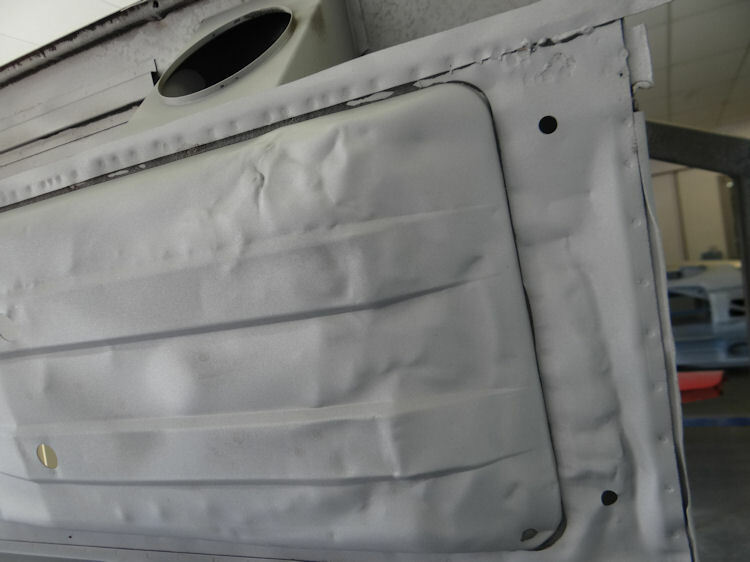 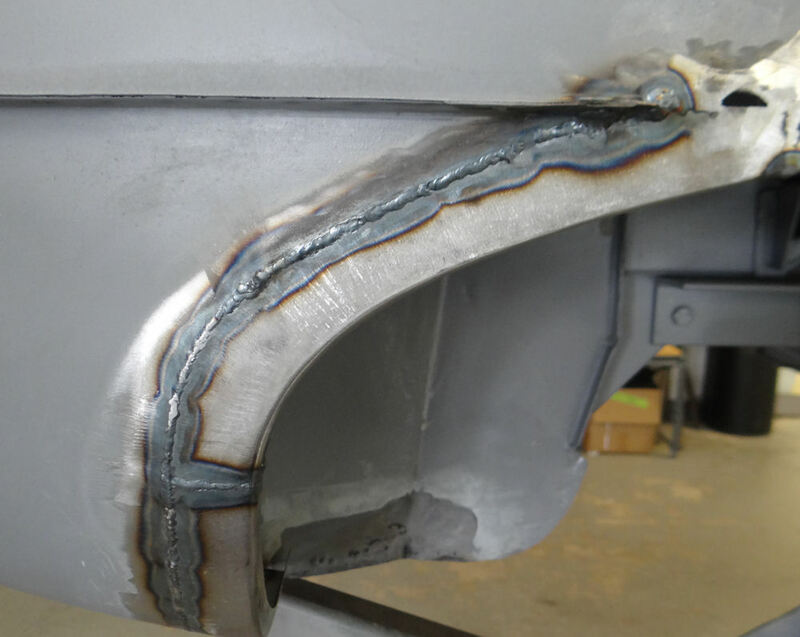 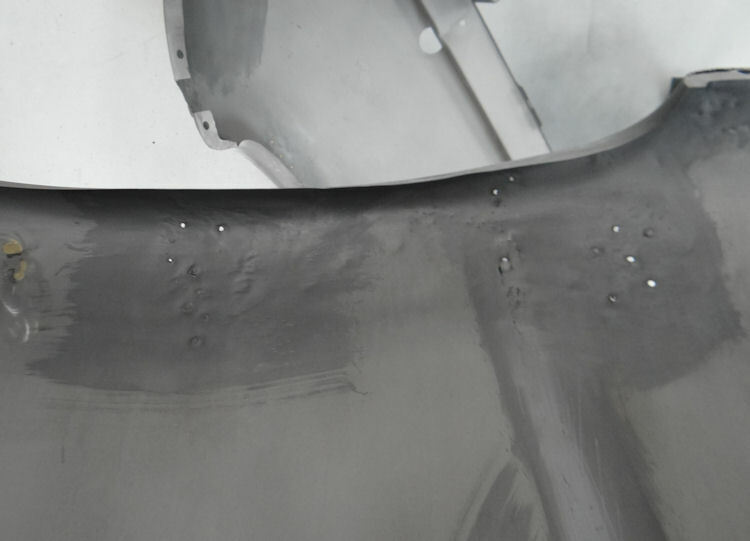 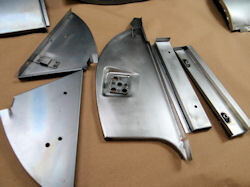 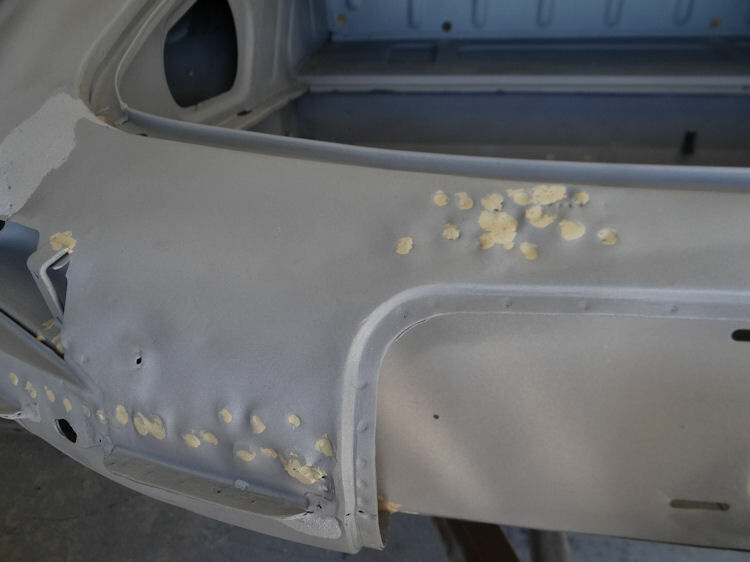 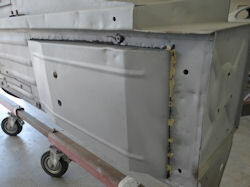 After blasting the body back to bare metal, we can now see exactly what we have to deal with in terms of bodywork and sheet metal replacement. 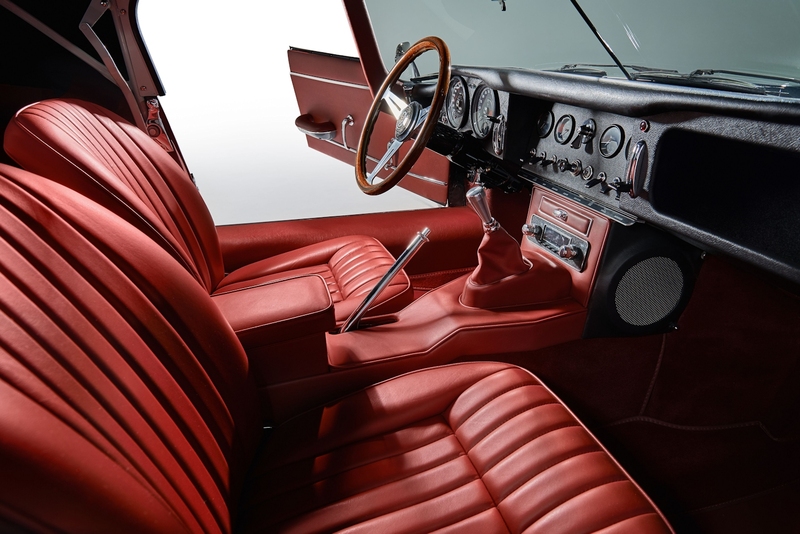 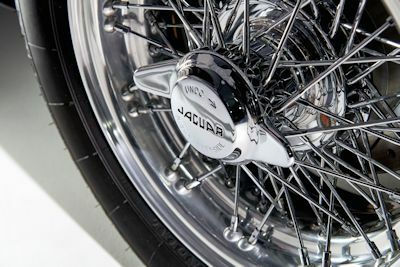 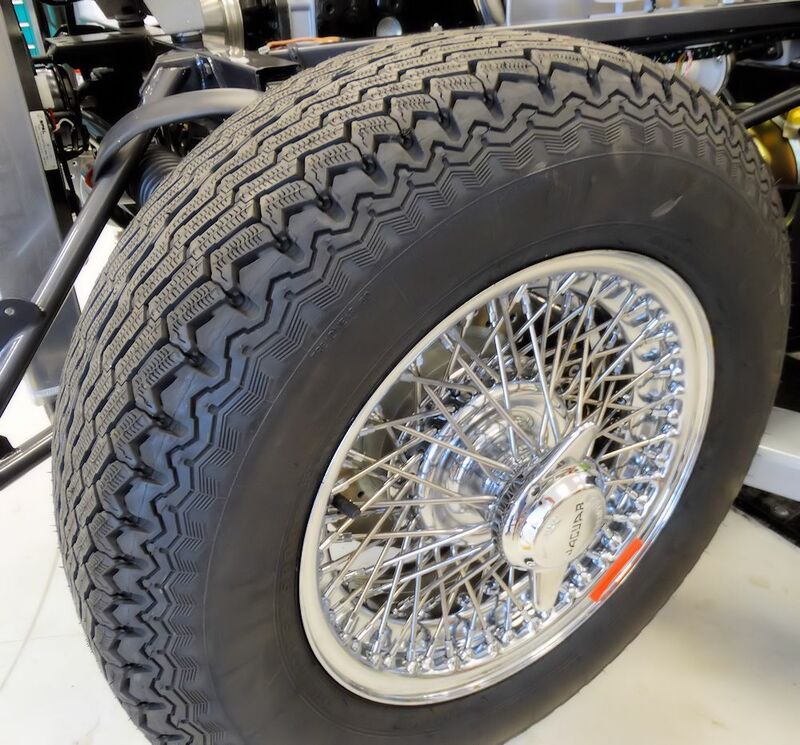 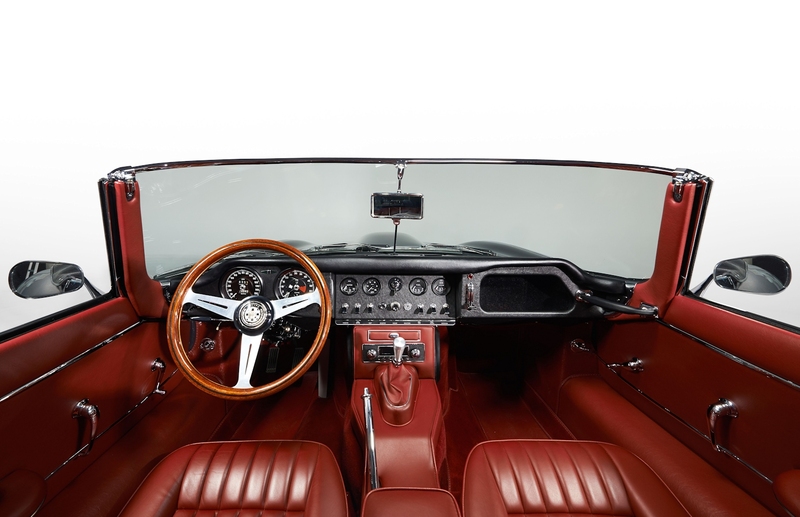 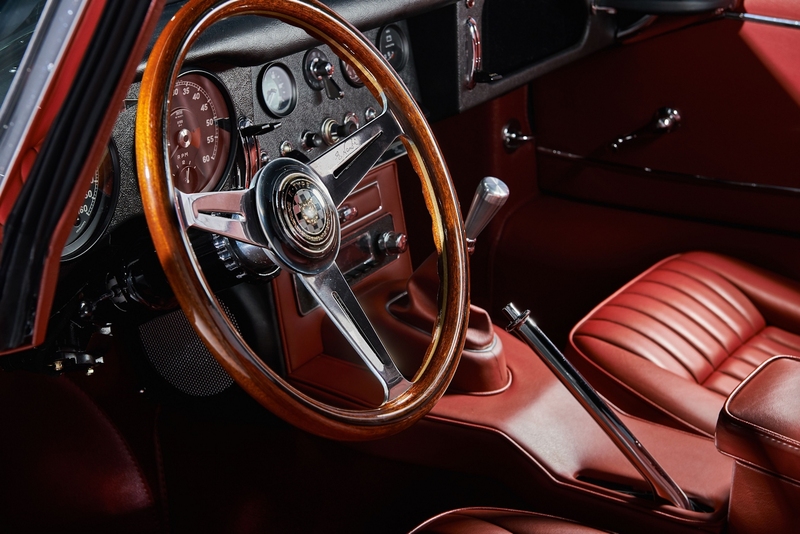 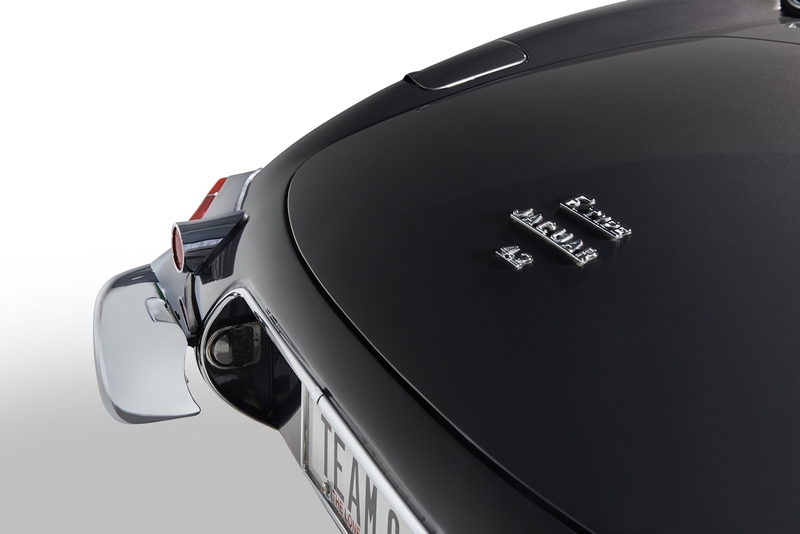 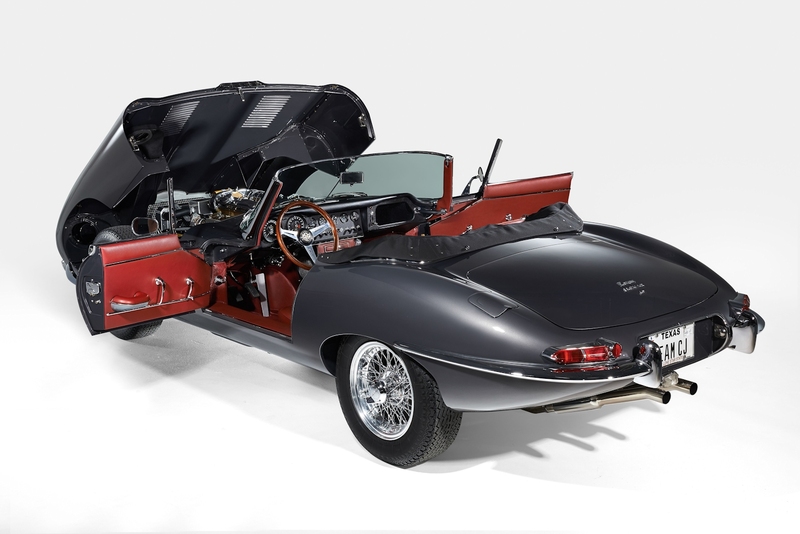 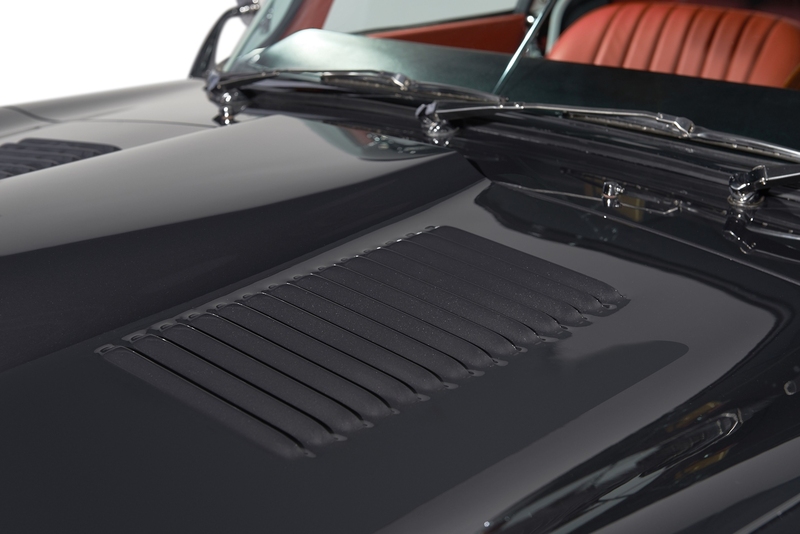 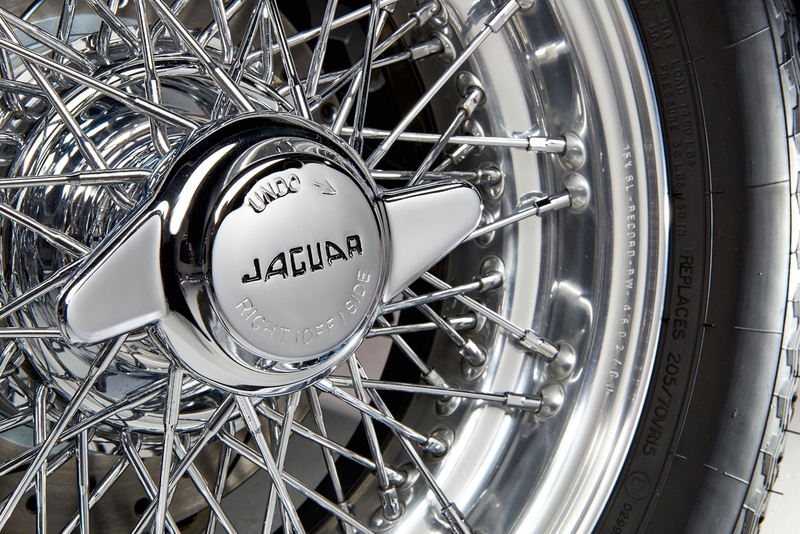 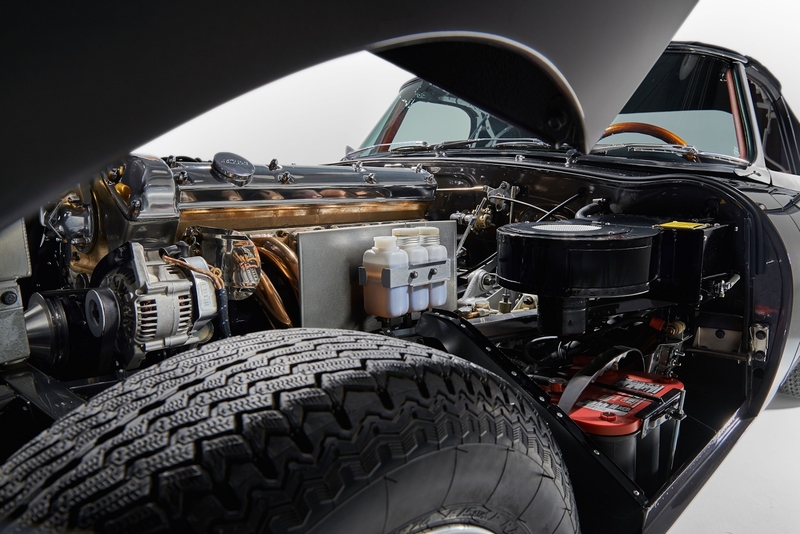 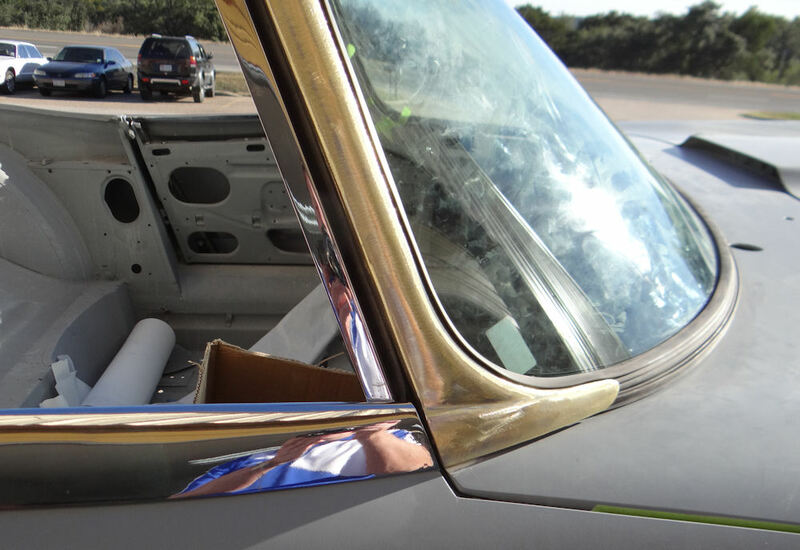 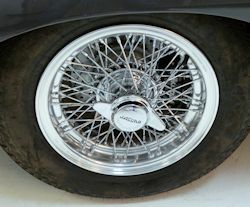 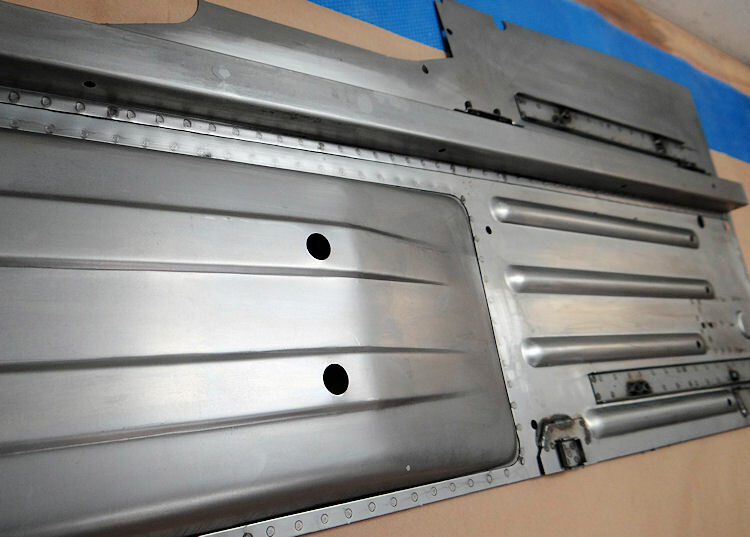 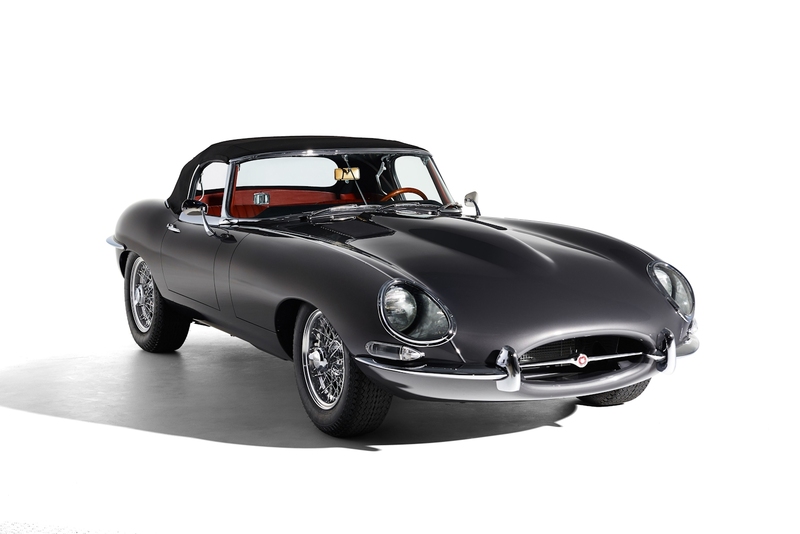 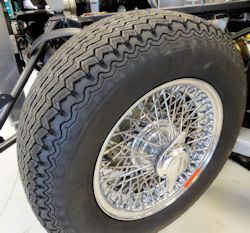 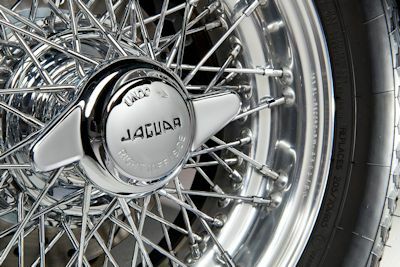 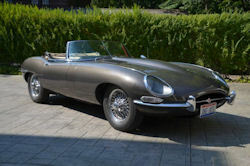 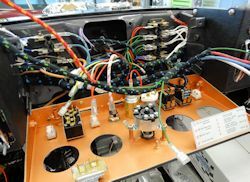 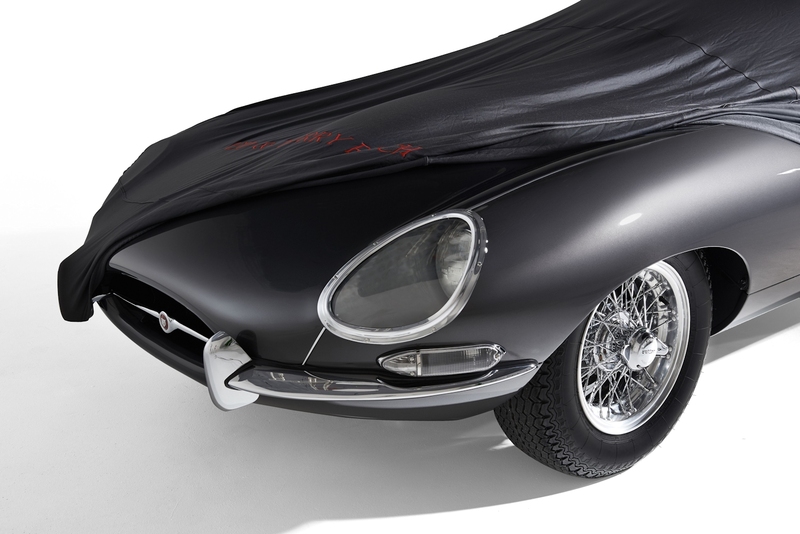 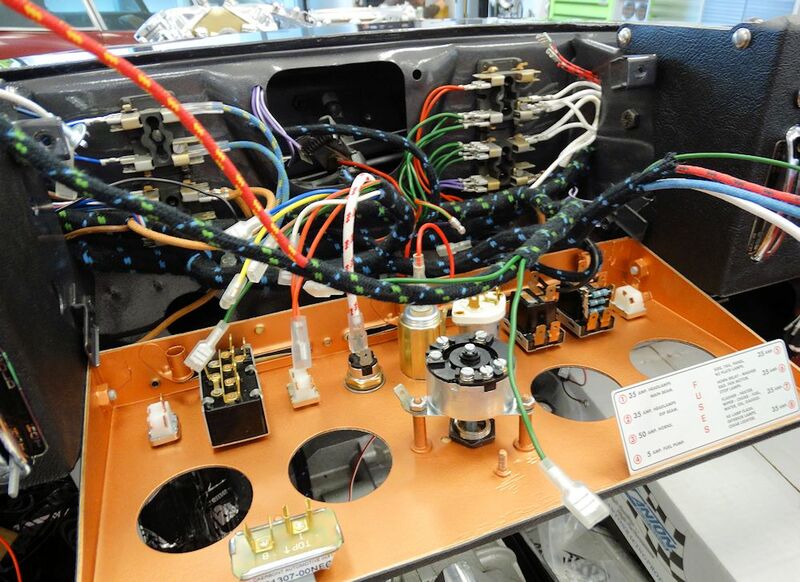 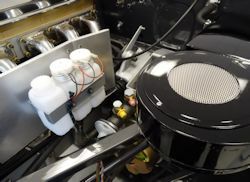 All in all, your car is certainly much better than most E Types that visit the CJ Coachworks, although there are a few issues that will obviously need some attention. 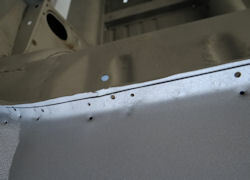 The underside of the floor, while not terribly rusty, is pretty beaten up. 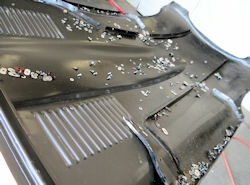 We should discuss your options in this regard, although I would be inclinded to replace the entire floor, if I was you. 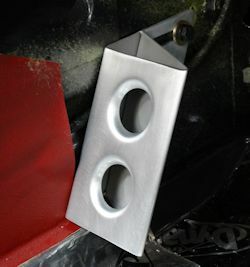 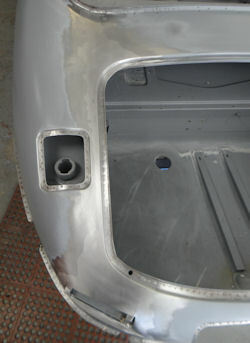 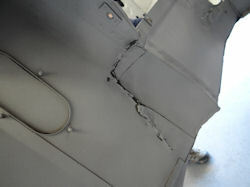 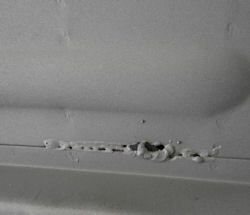 A few extra holes on the rear cowl Both front floors are pretty beaten up! 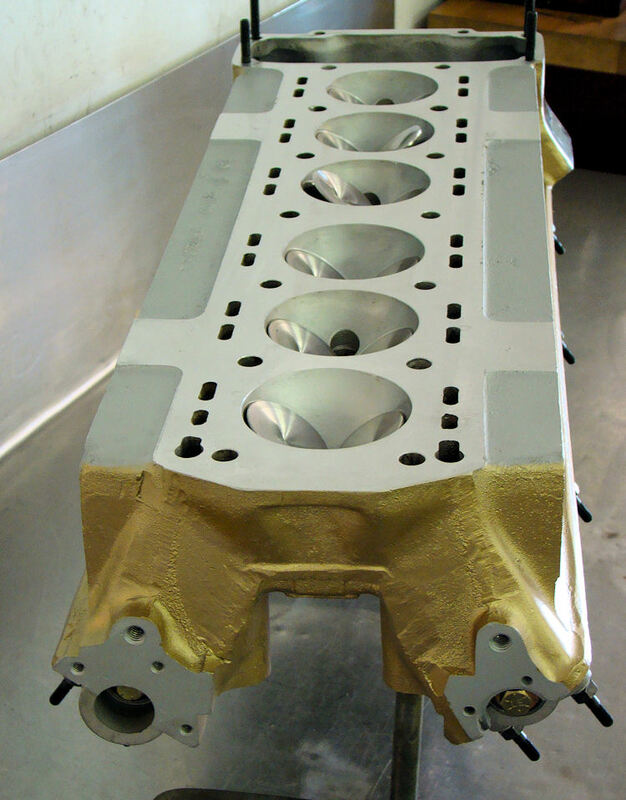 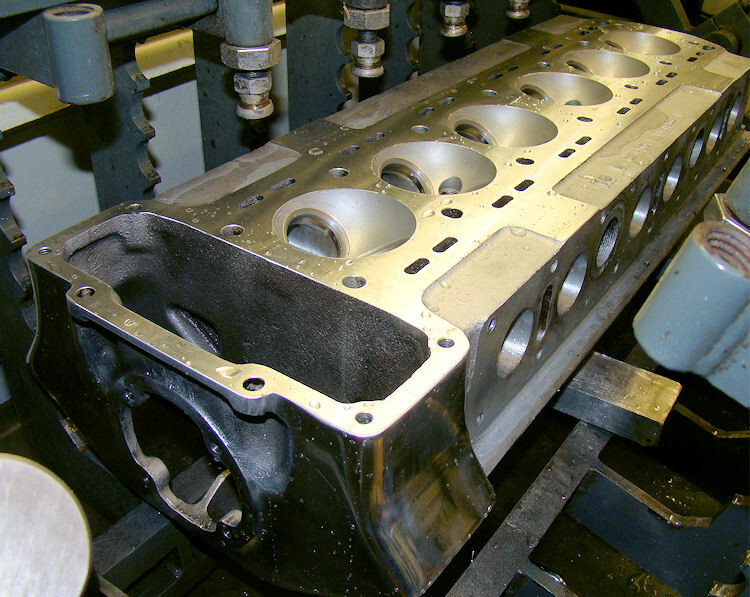 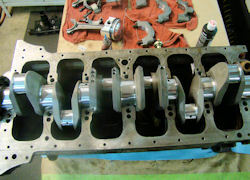 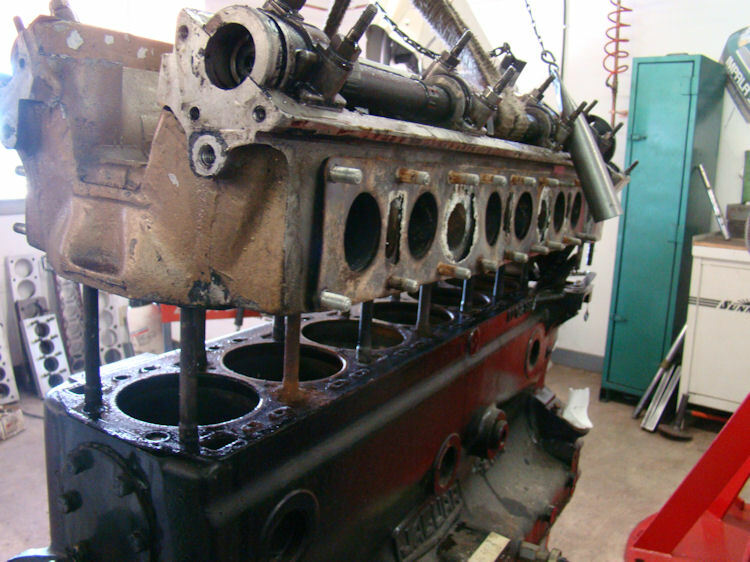 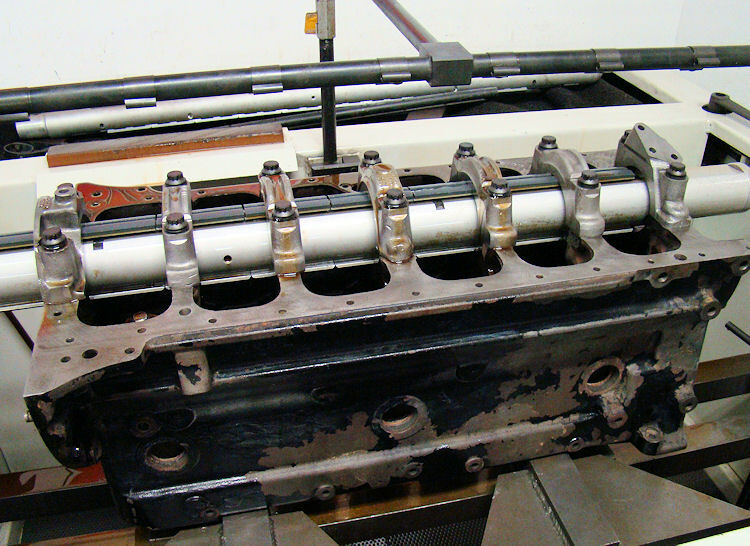 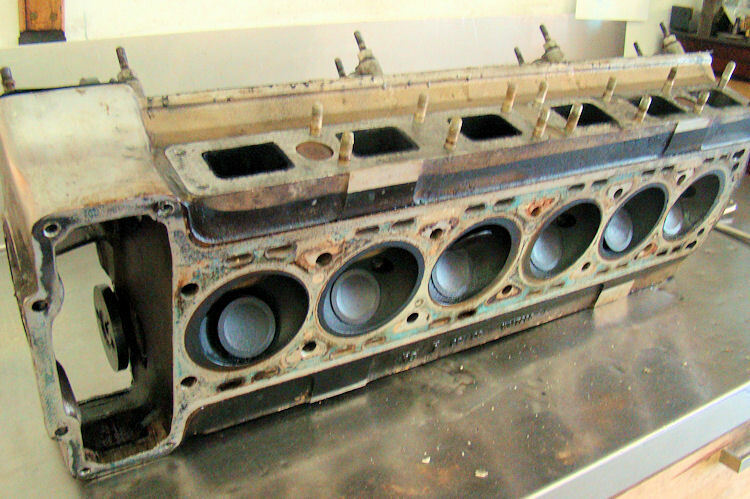 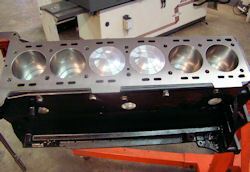 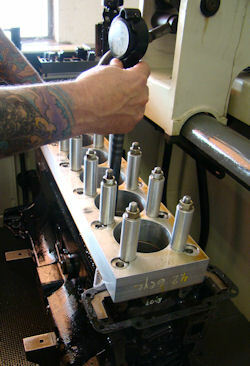 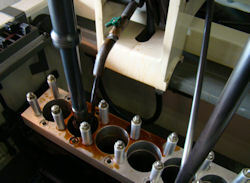 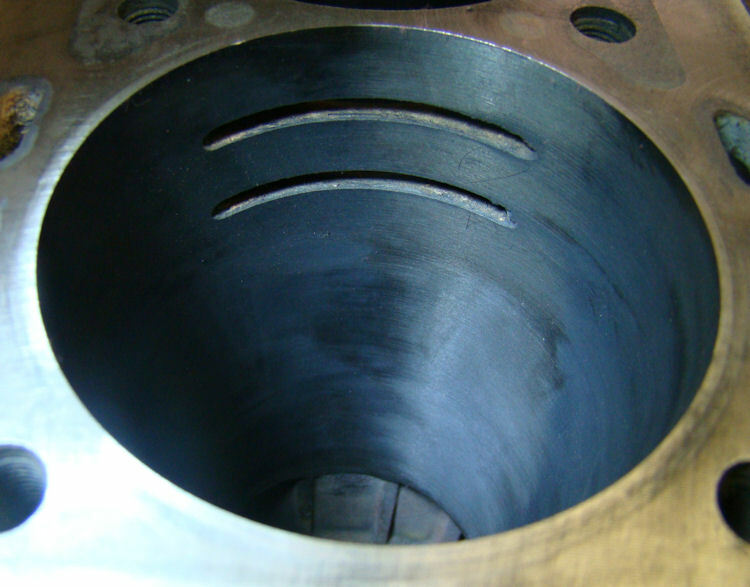 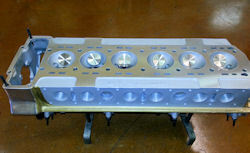 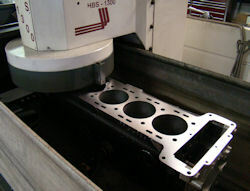 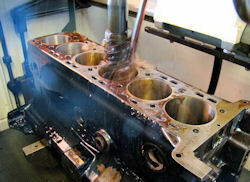 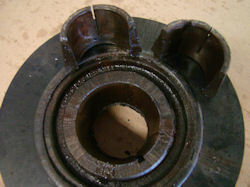 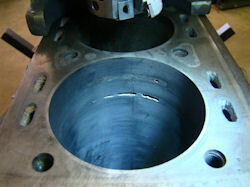 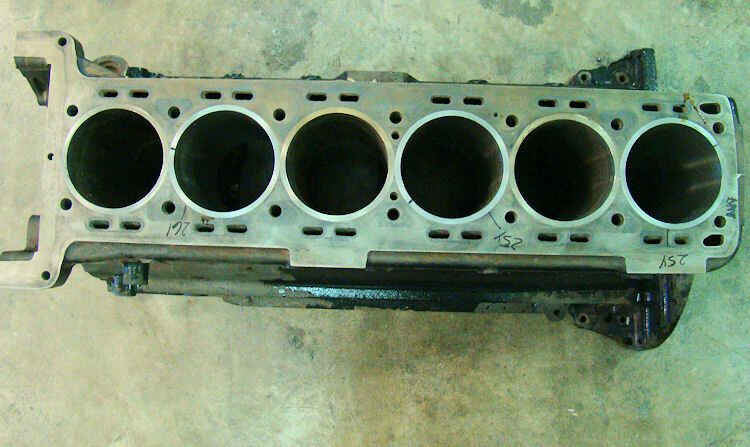 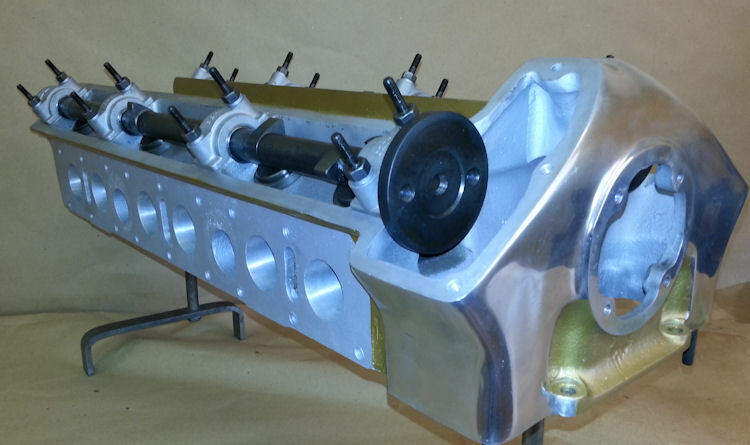 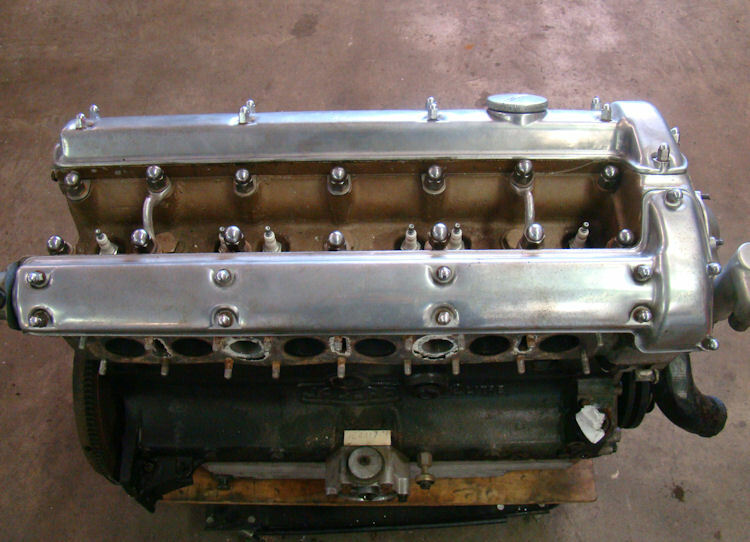 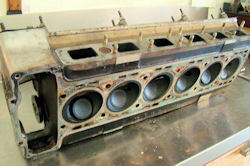 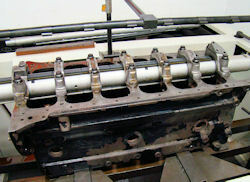 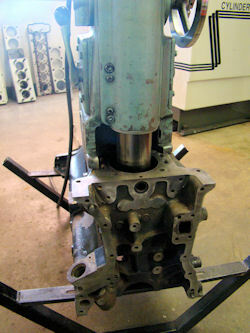 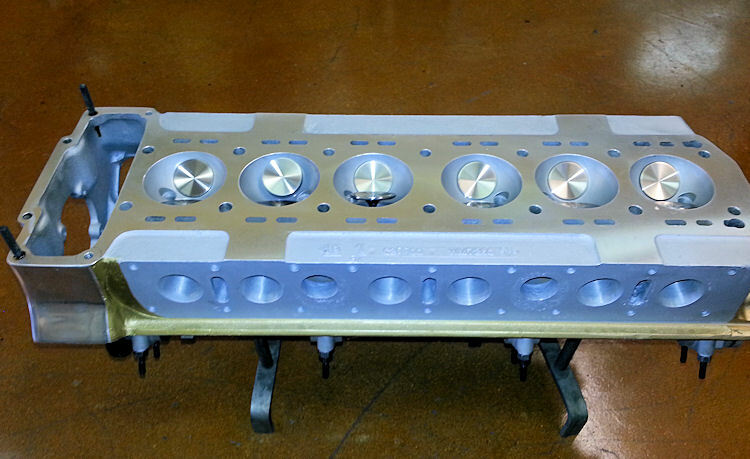 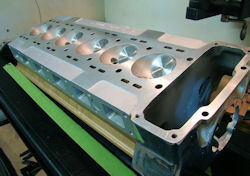 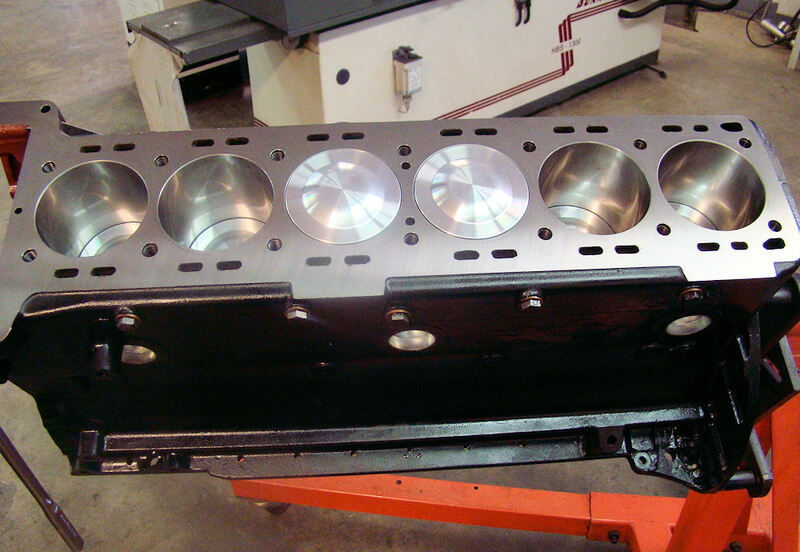 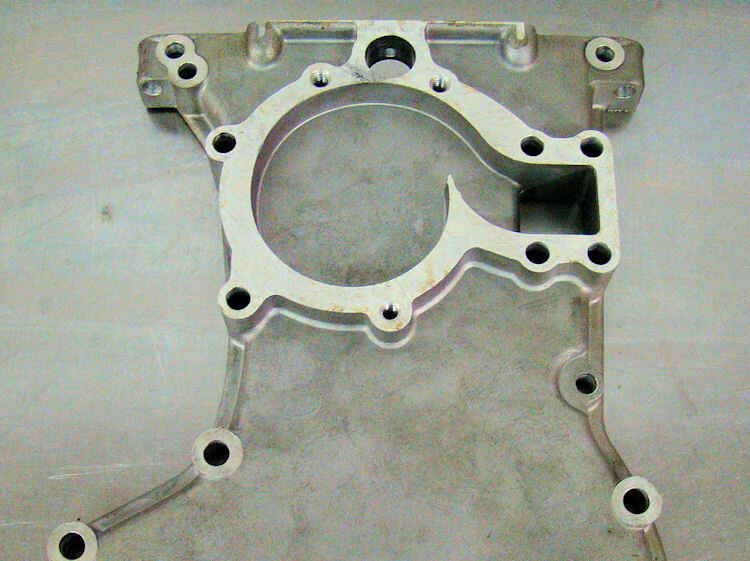 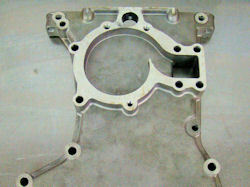 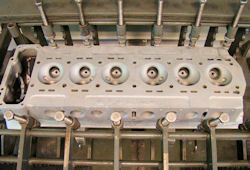 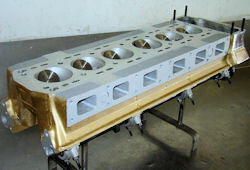 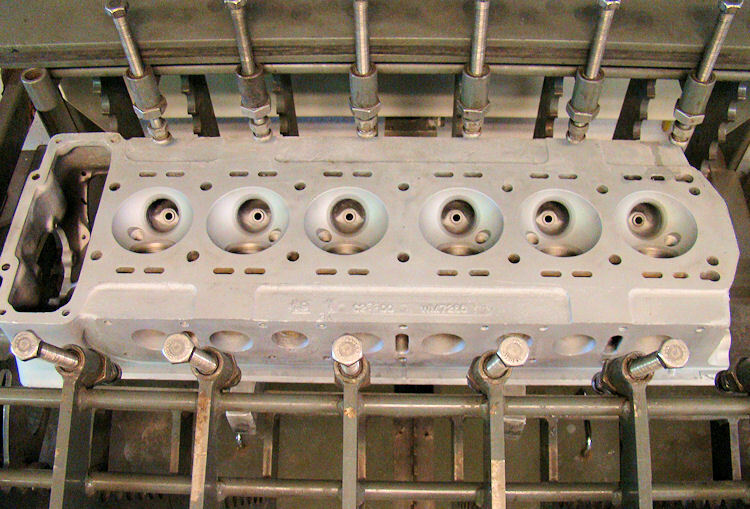 I am pleased to report that your Stage One cylinder head rebuild has now been completed. 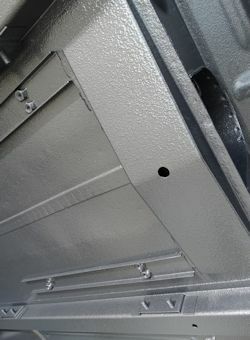 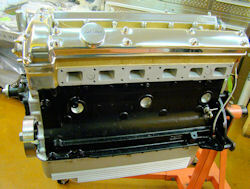 We picked up a very healthy 55 cfm on the flow bench, which will make this a very strong running engine. 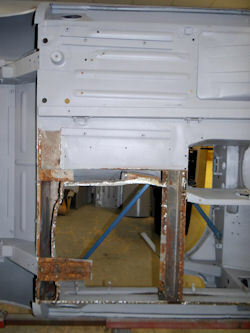 It is a shame this machine work will be hidden! 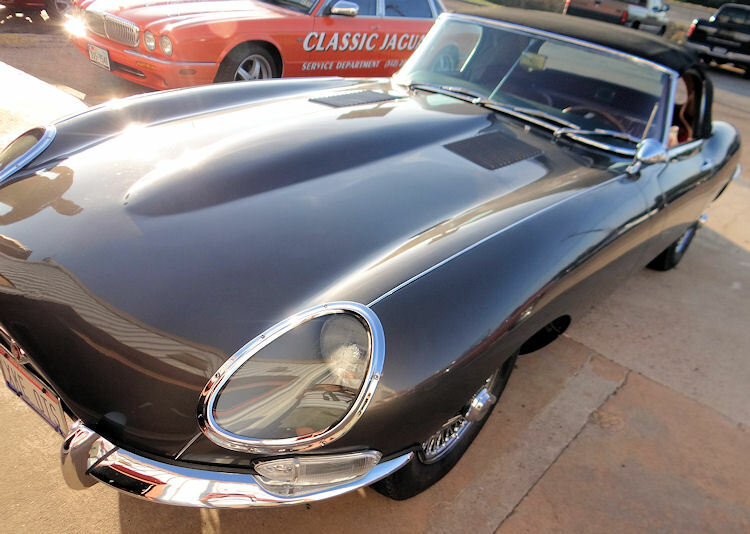 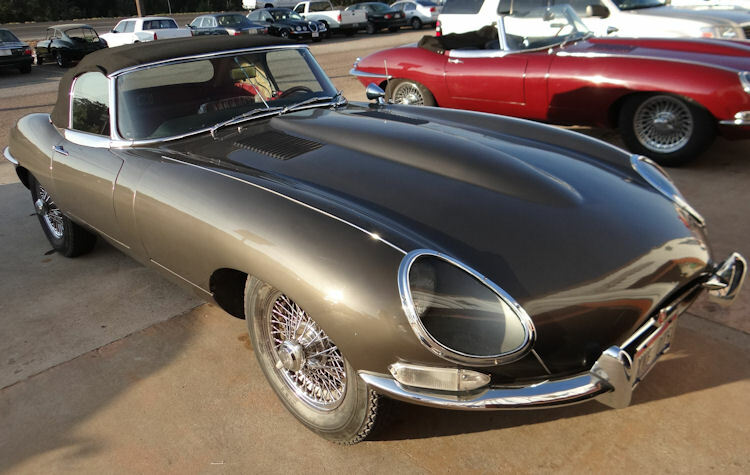 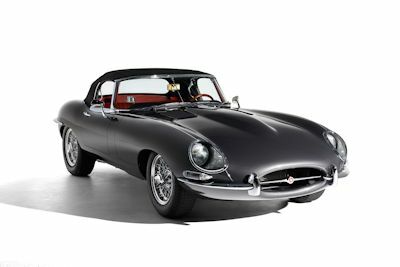 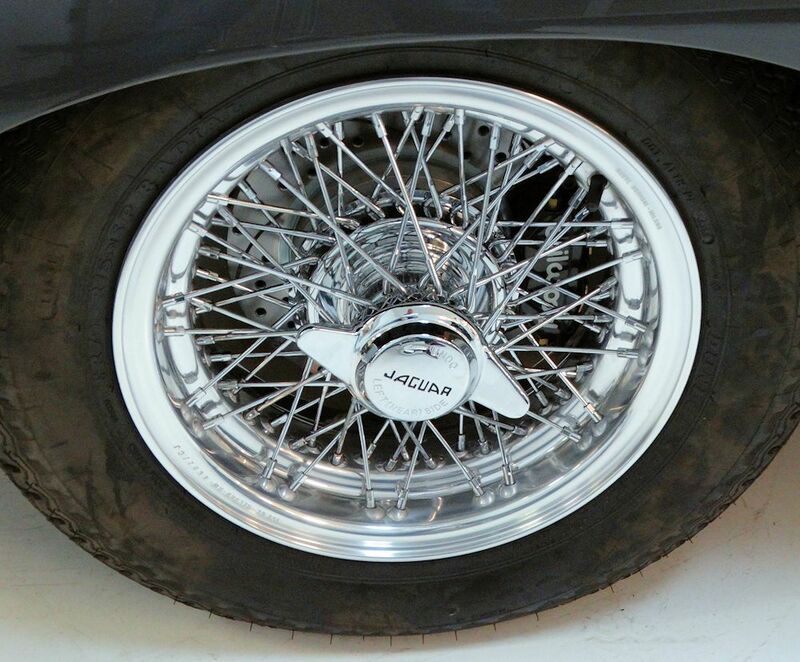 I am pleased to report that your car has arrived safely at Classic Jaguar and we will have your restoration underway in the next few days.